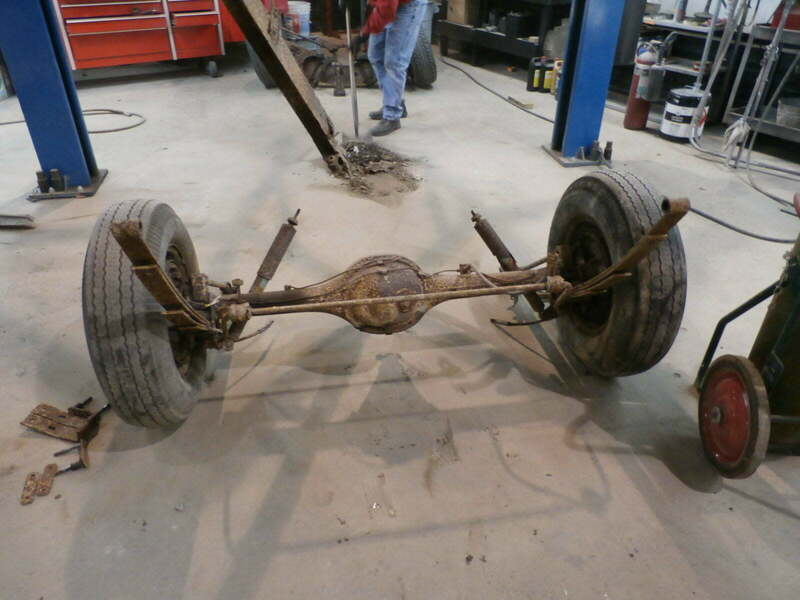 This vehicle was stored in a barn for 40 years and the elements have not been nice to it. 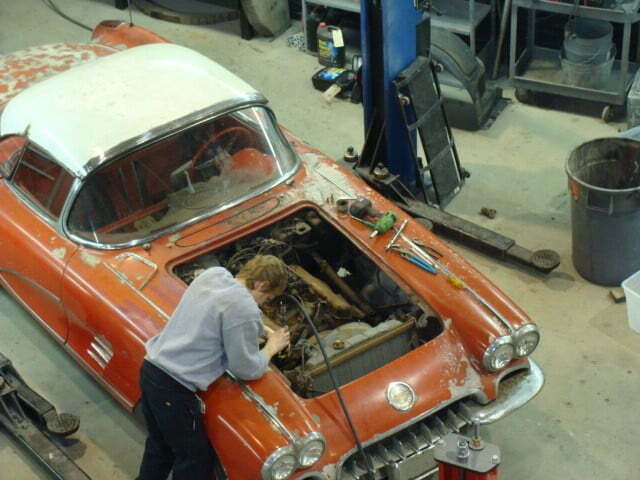 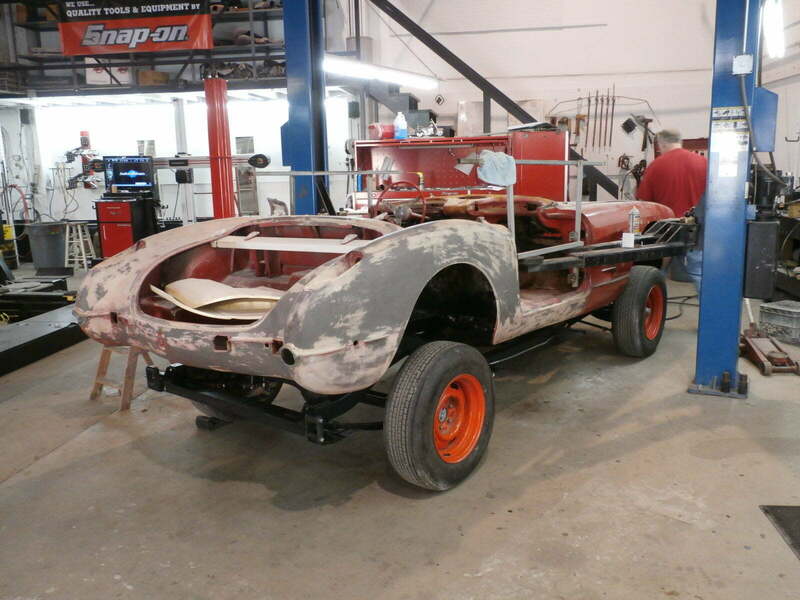 The original owner passed on recently and his widow has decided to restore the vehicle in his memory. 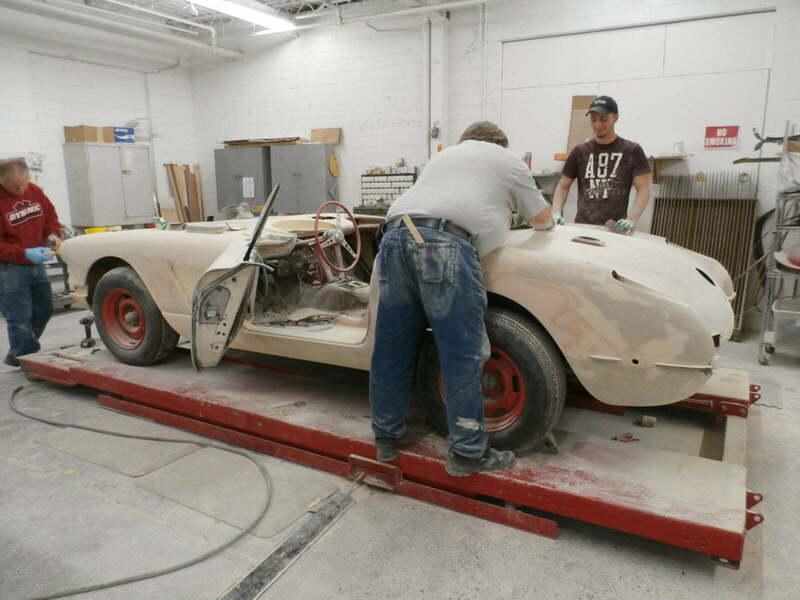 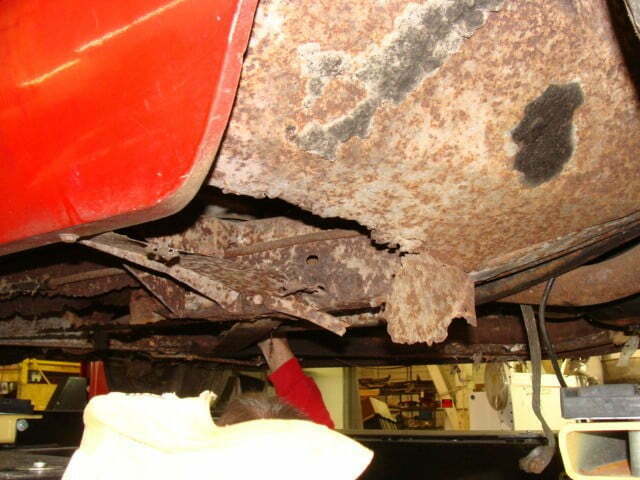 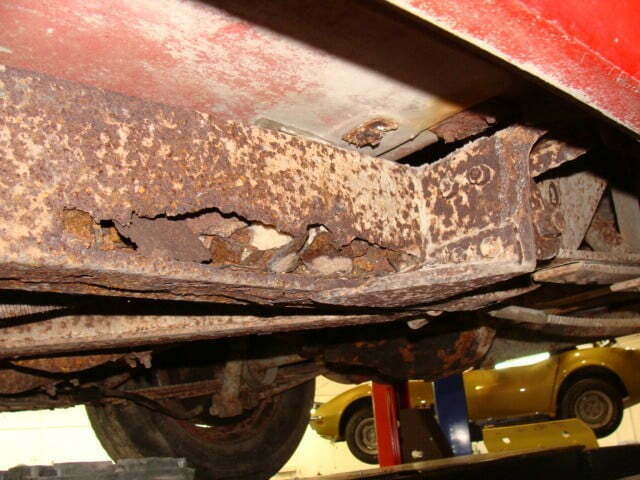 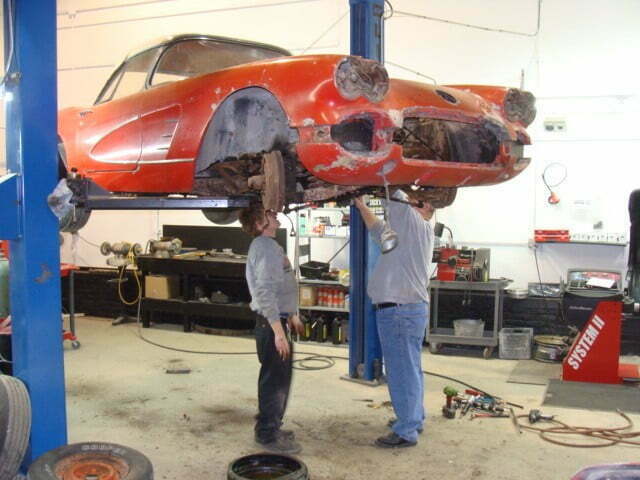 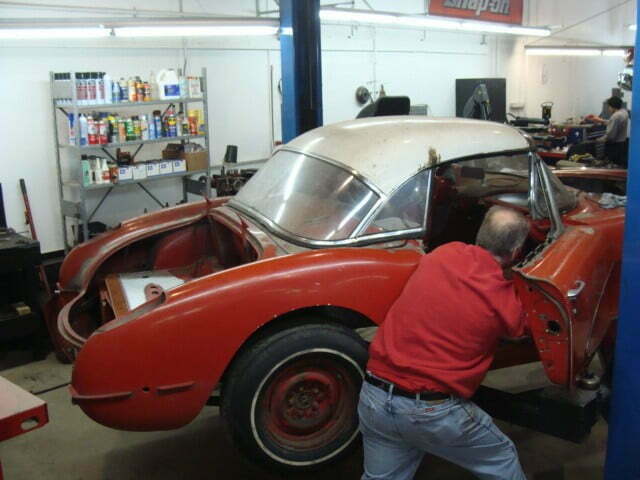 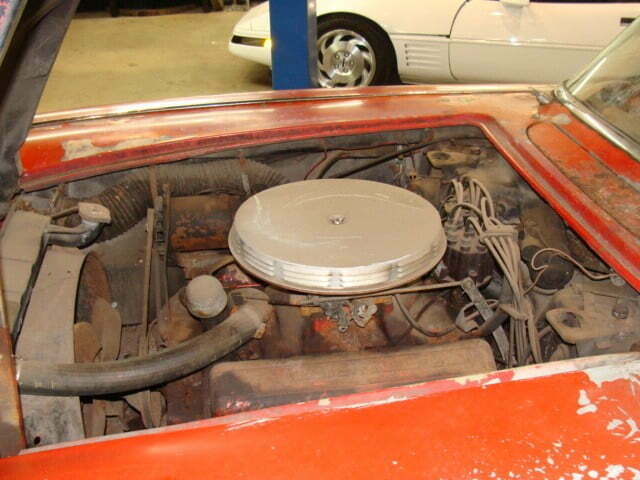 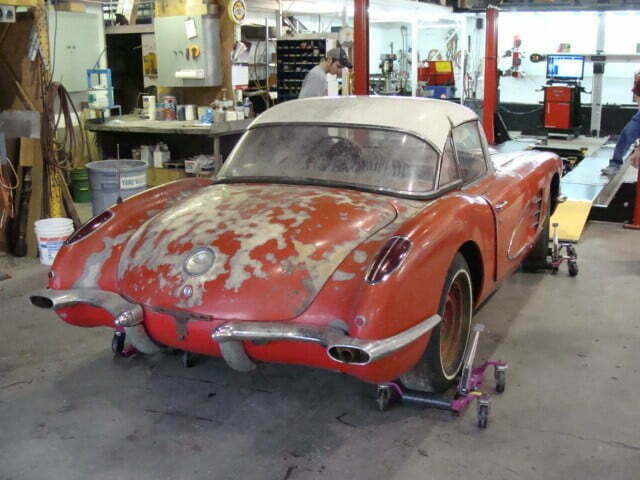 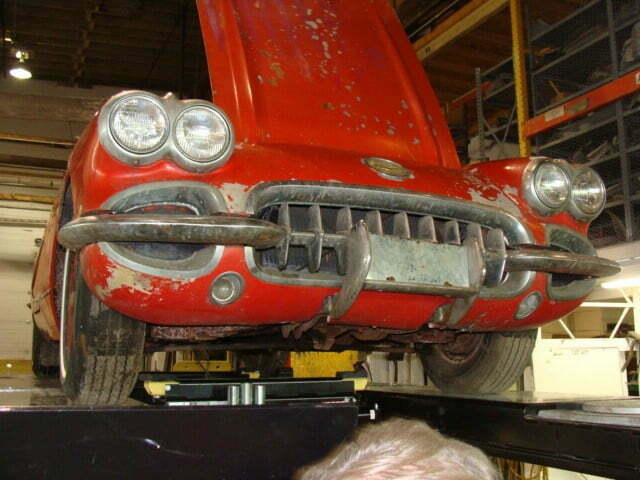 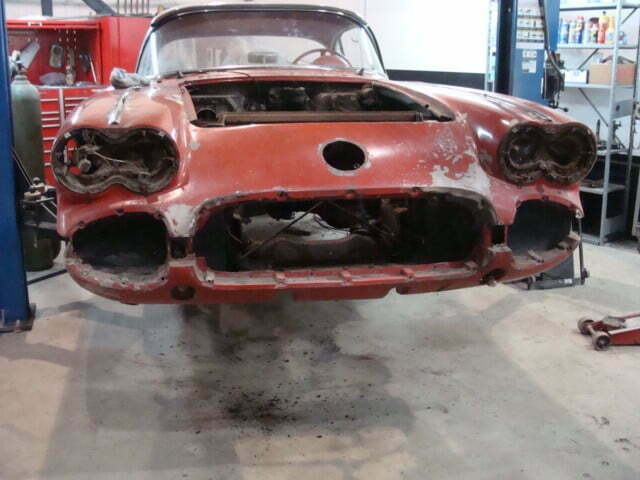 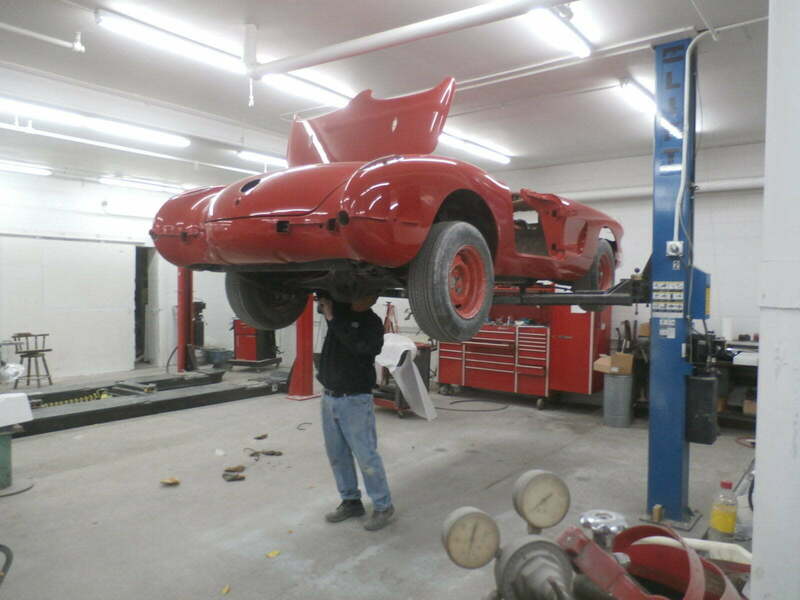 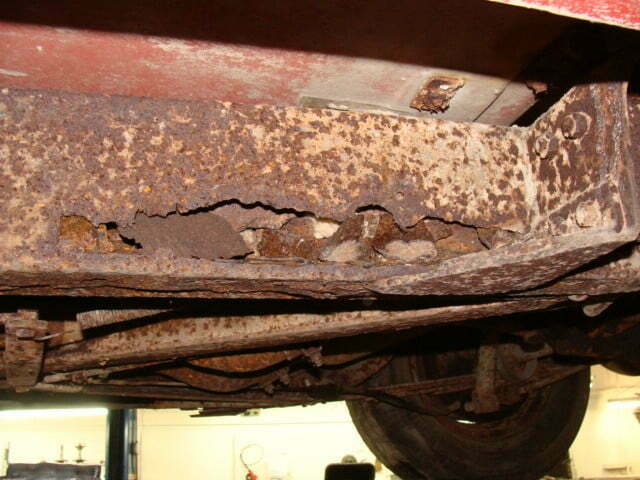 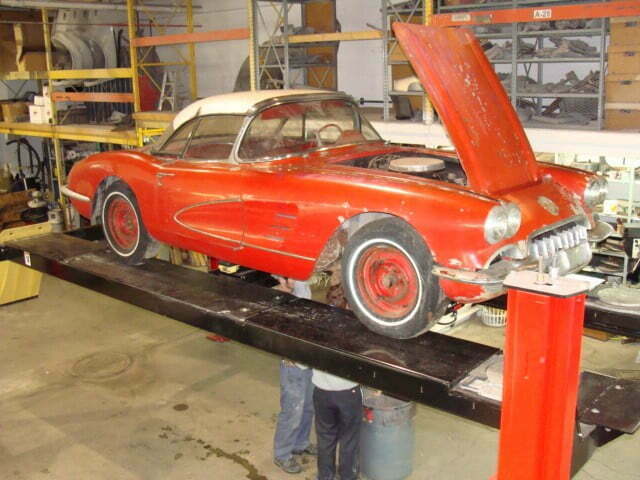 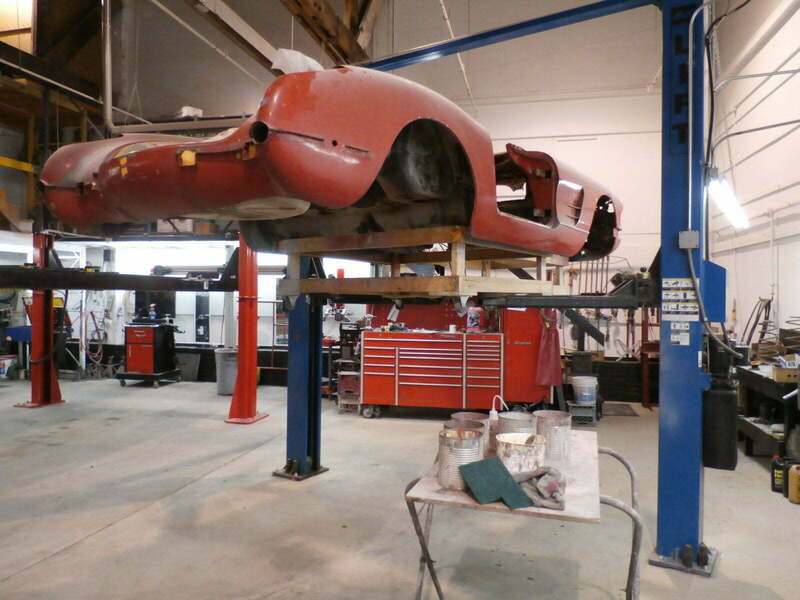 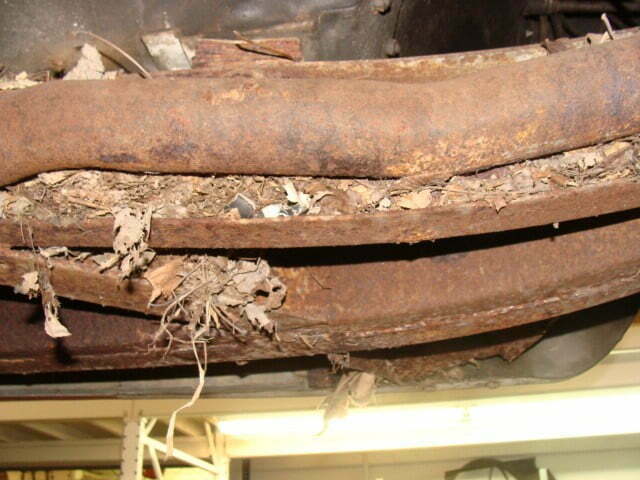 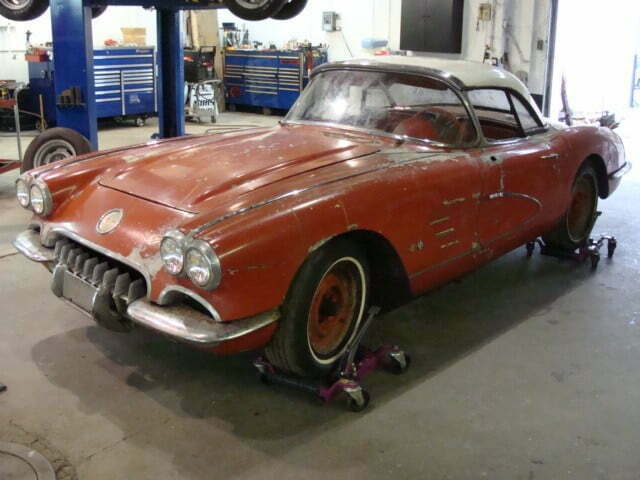 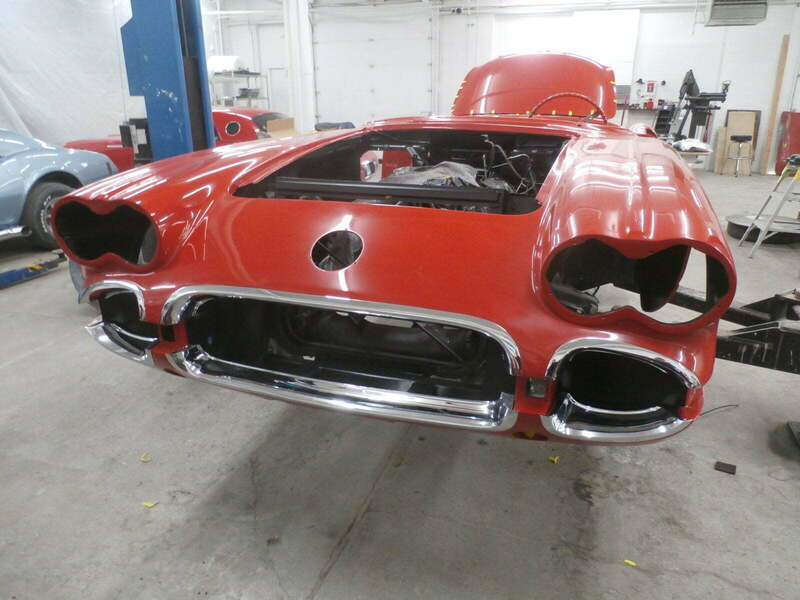 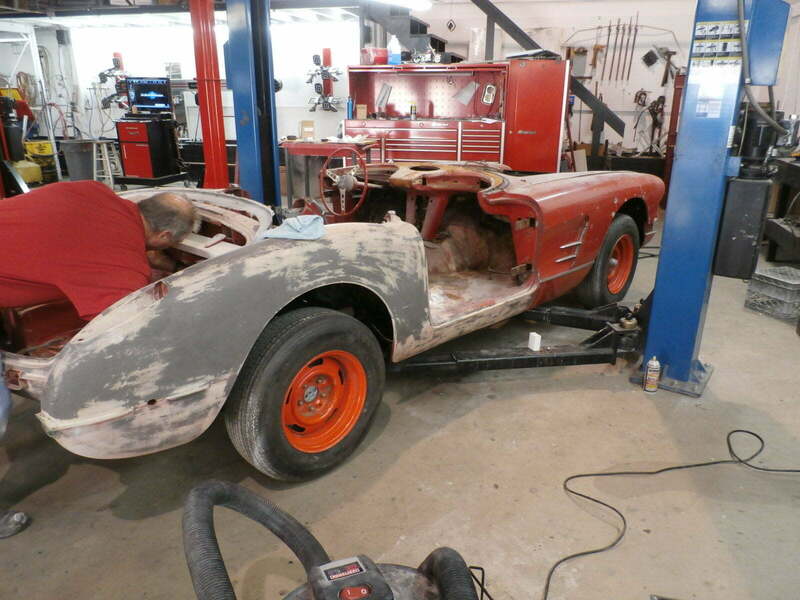 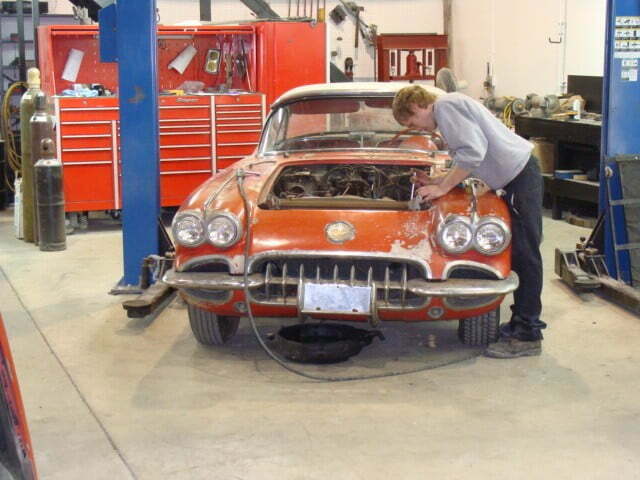 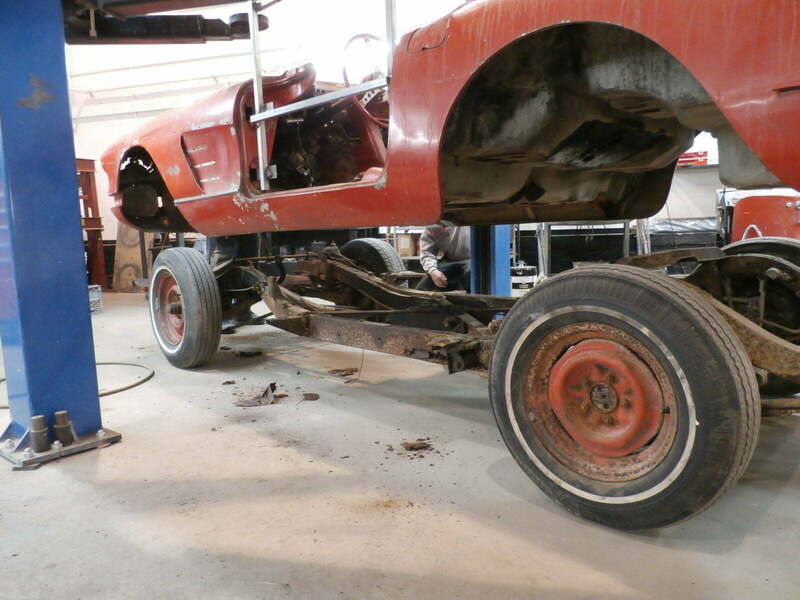 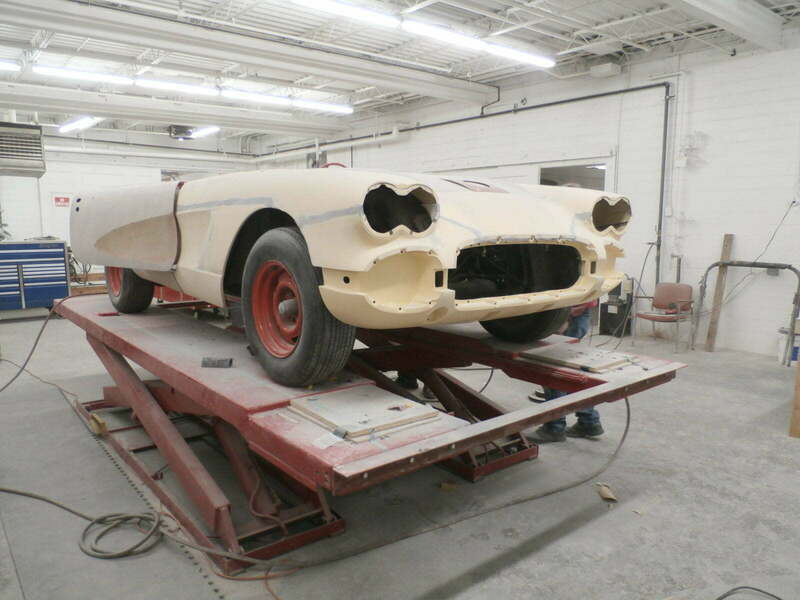 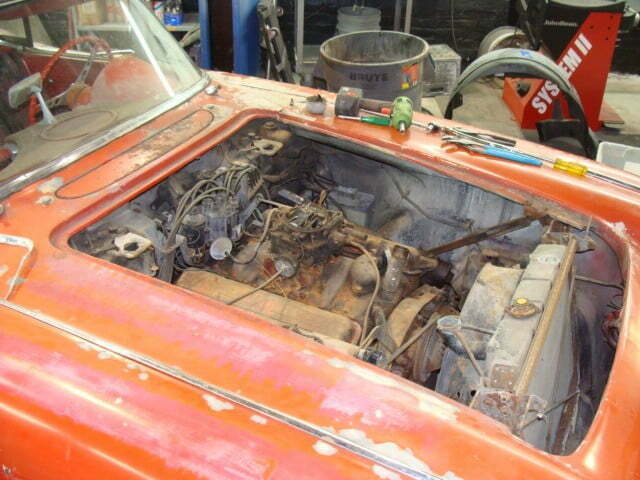 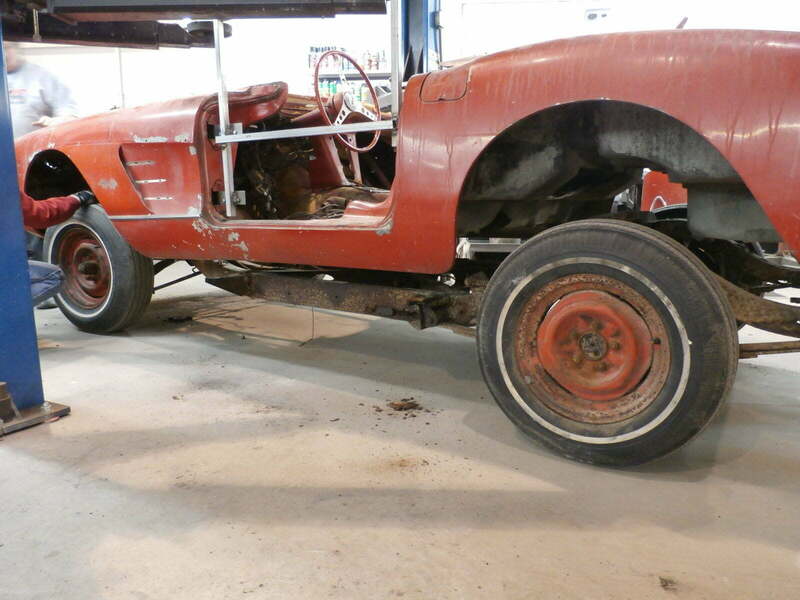 When this 1960 Corvette arrived, not much was holding it together. 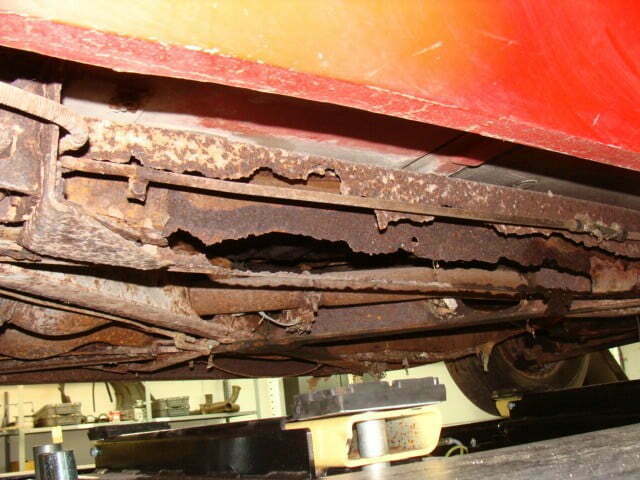 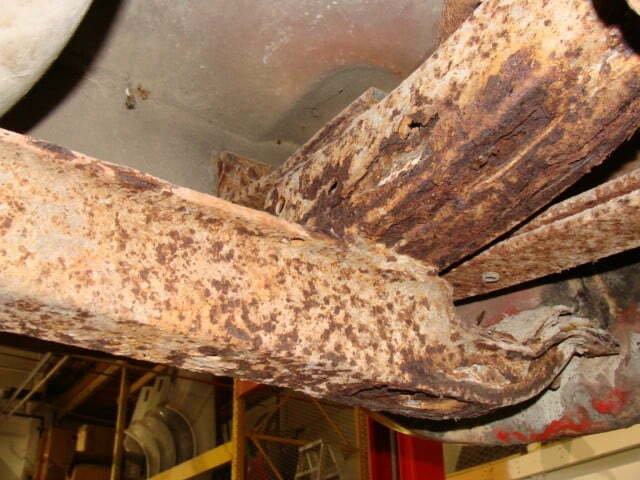 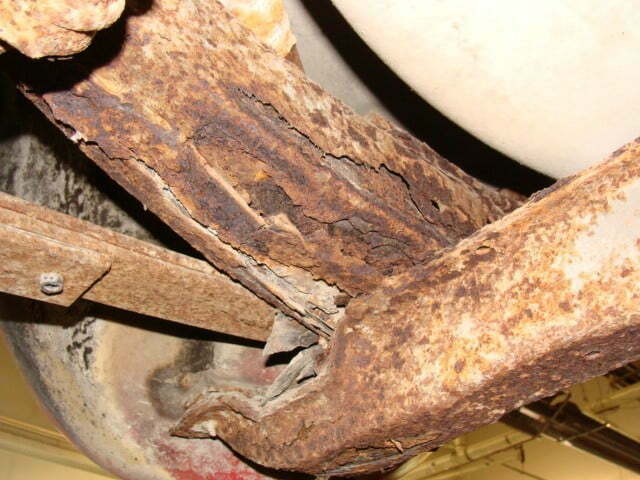 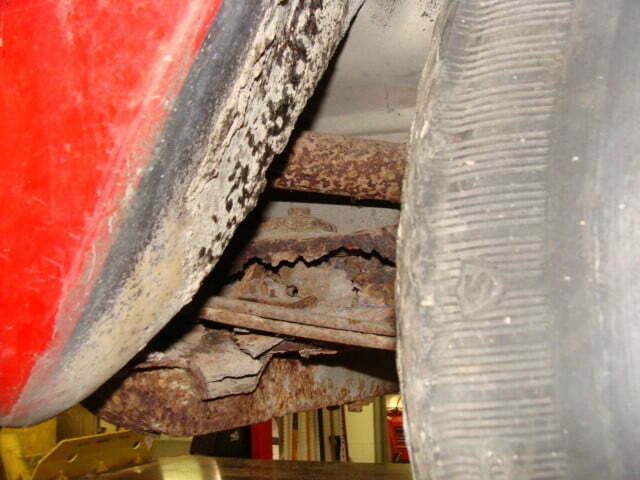 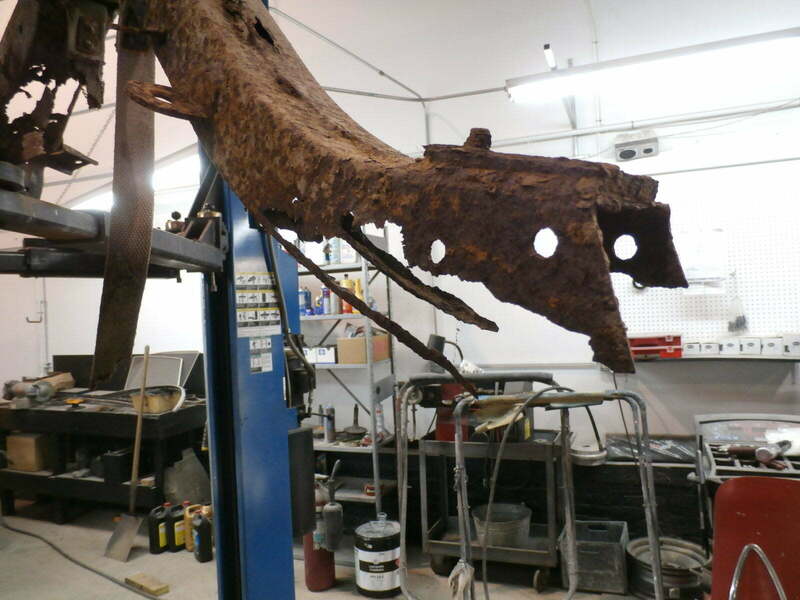 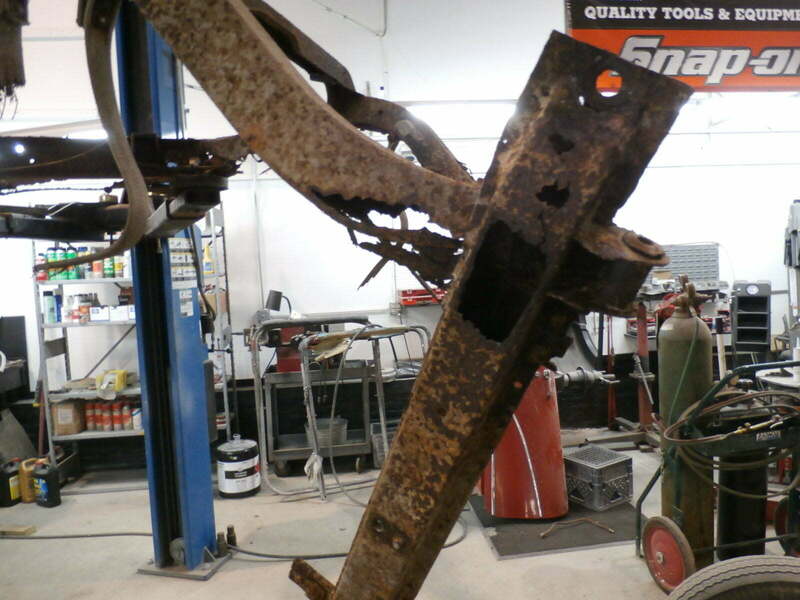 The frame had been eaten away by rust and was being held together by thin strands of rusted steel. 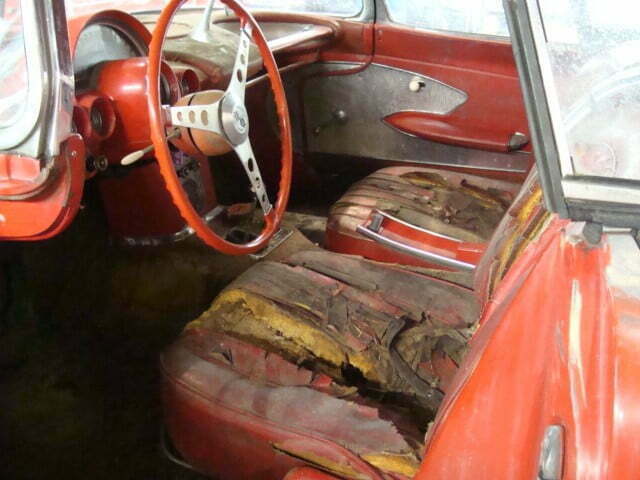 The interior was also in dire shape. 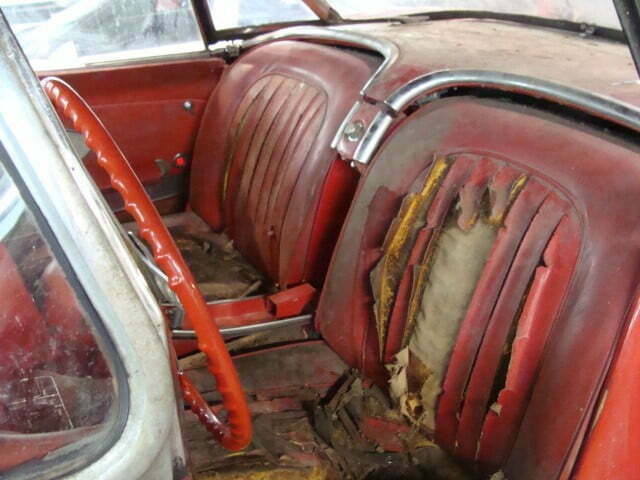 Seat leather was hard, crusty and crunchy and would flake away at the touch. 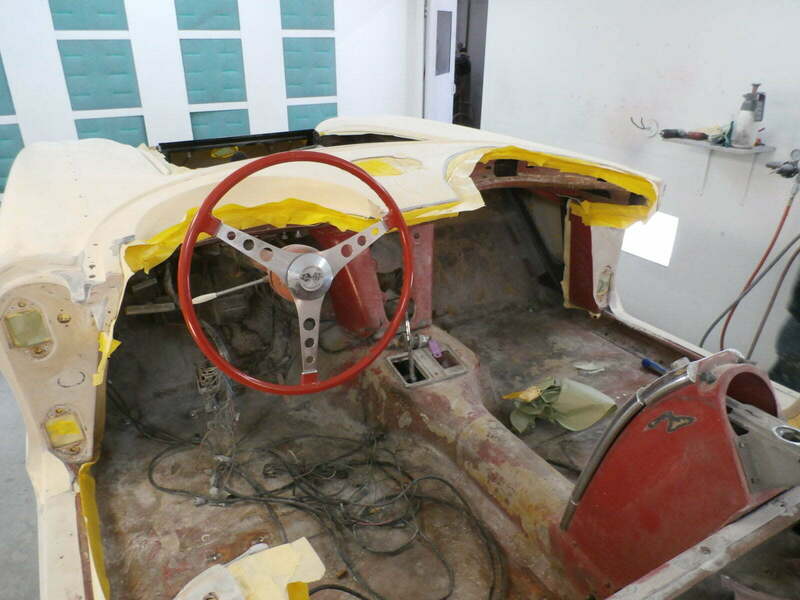 The carpet had deteriorated so much that all was left was some loose fibers scattered on the fiberglass floor. 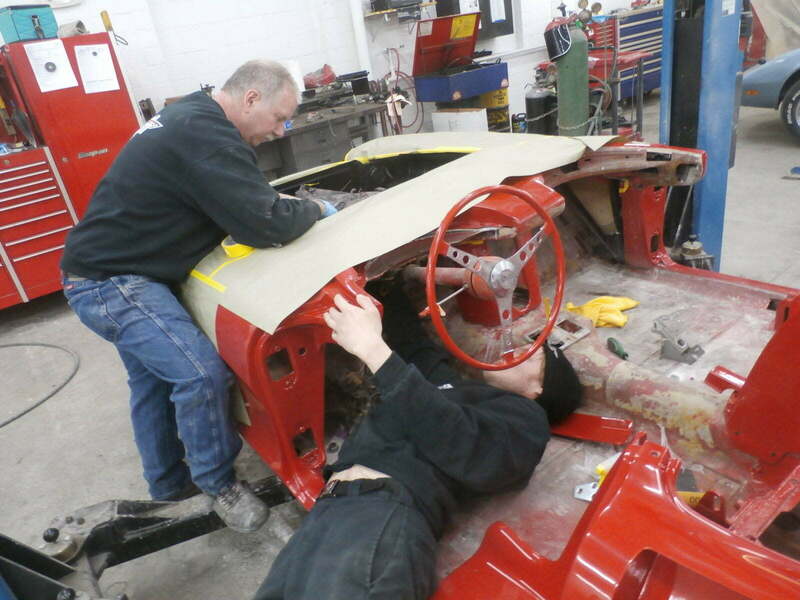 Like all projects, you have to start somewhere, our guys started to disassemble the exterior body trim pieces, the engine wiring connections and hoses, and the interior. 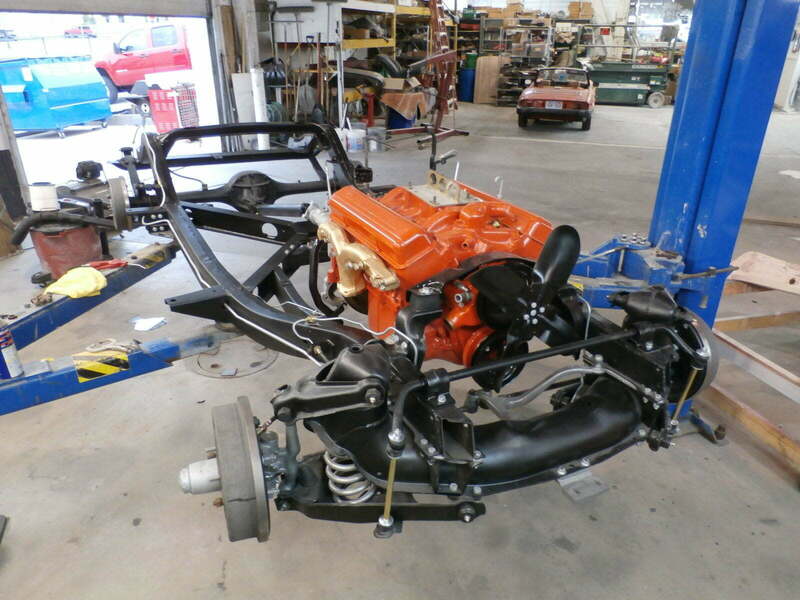 The engine was removed and sent to a local machine shop, where it was completely disassembled and rebuilt with new components. 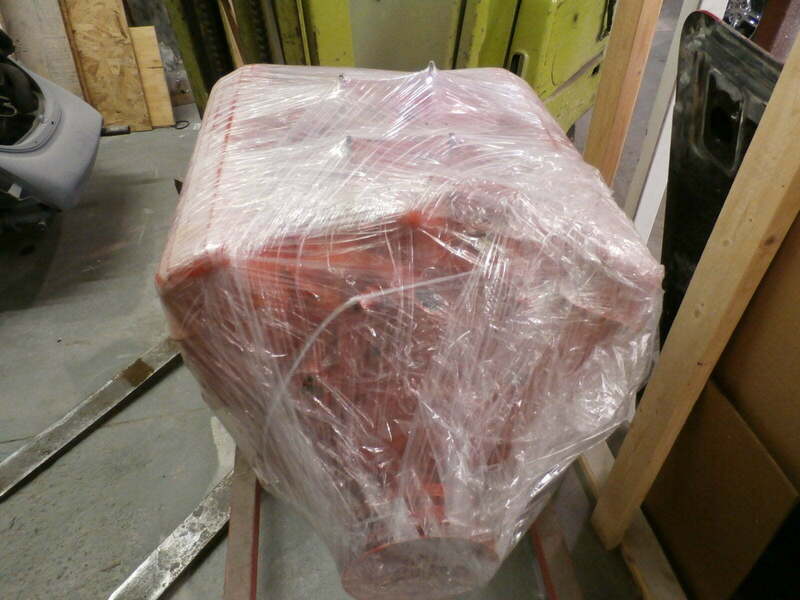 Upon return of the engine, we wrapped it up in plastic sheeting to protect it from any dust within the shop. 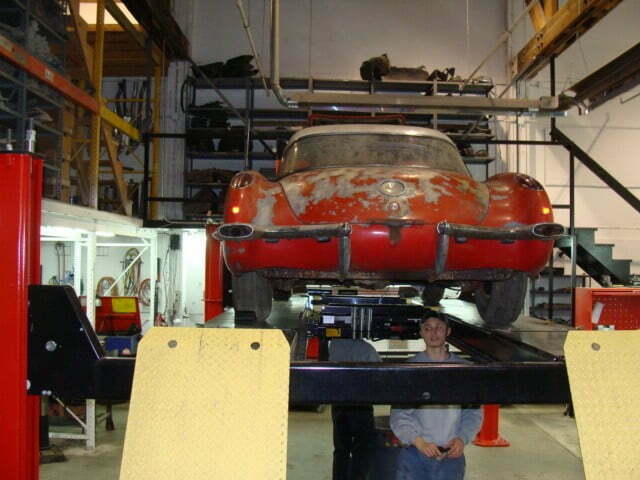 The body was raised by our twin-post hoist and then placed on a body cart to properly support the body and for ease of mobility. 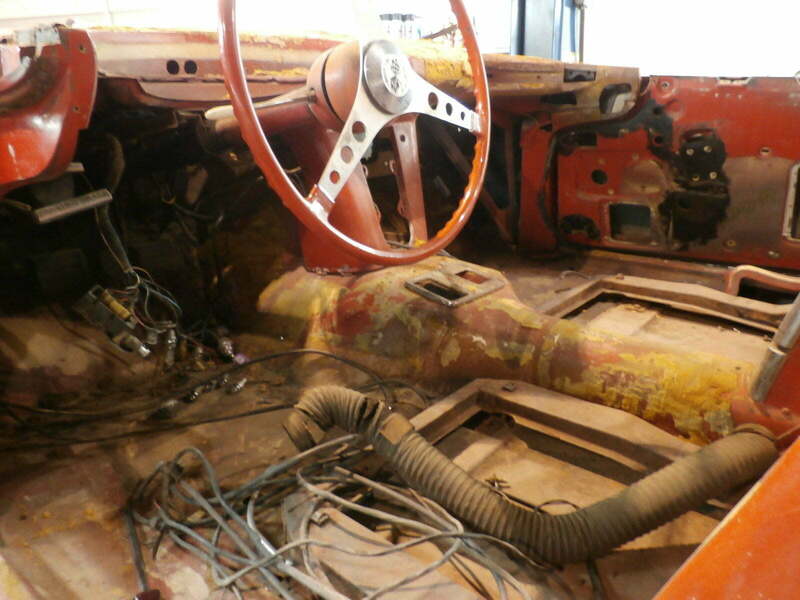 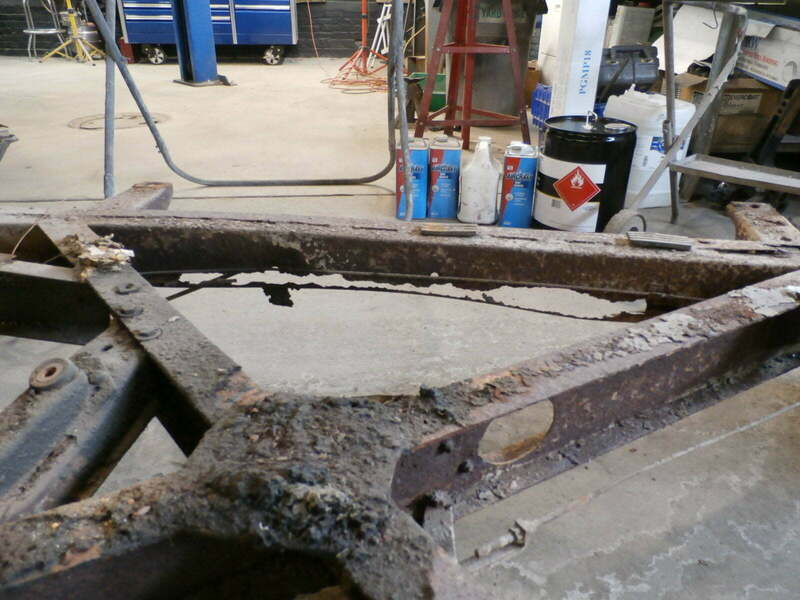 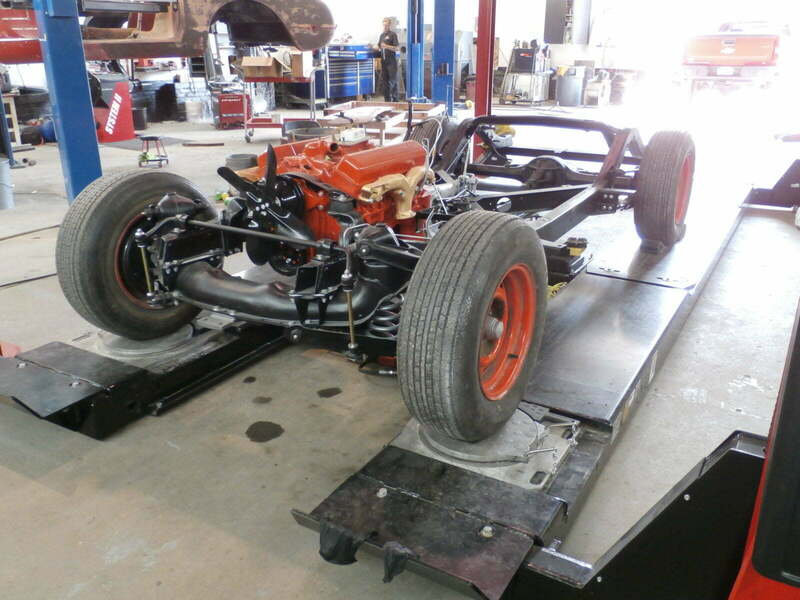 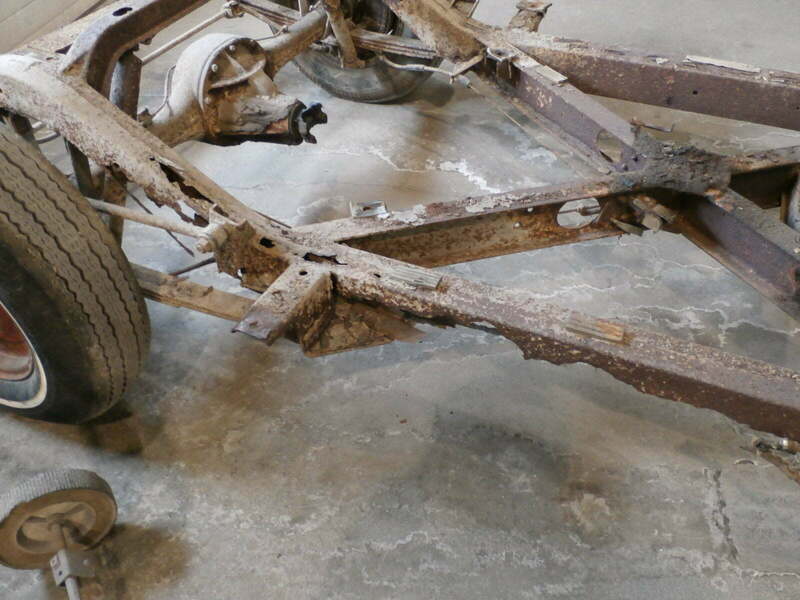 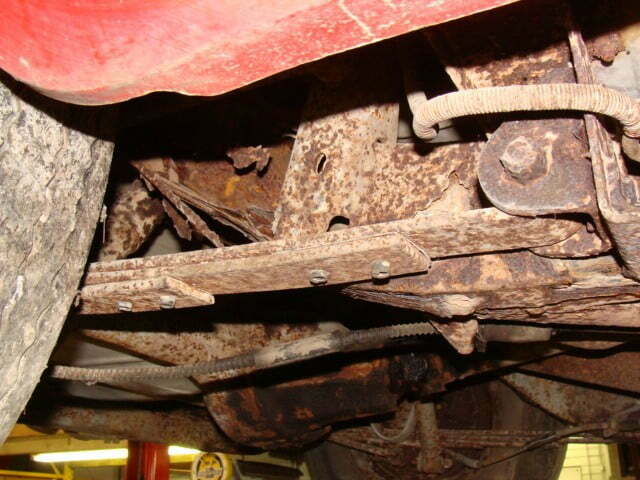 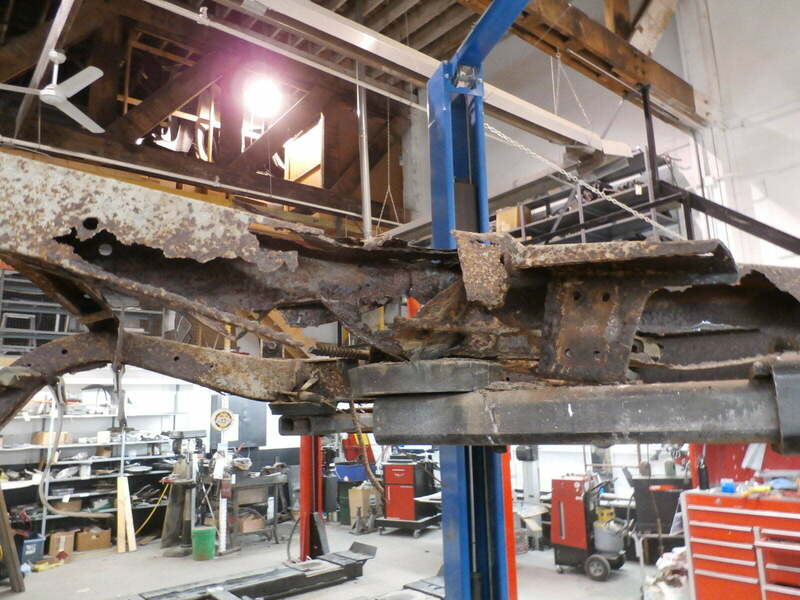 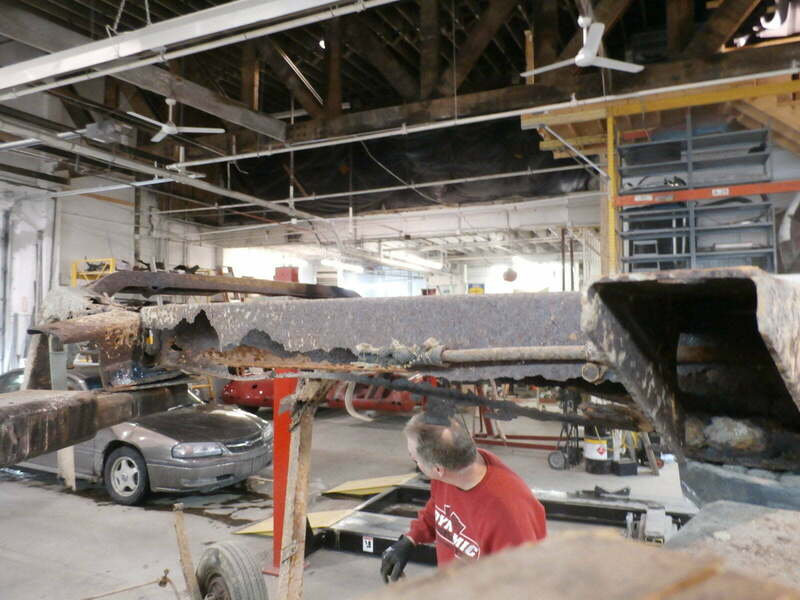 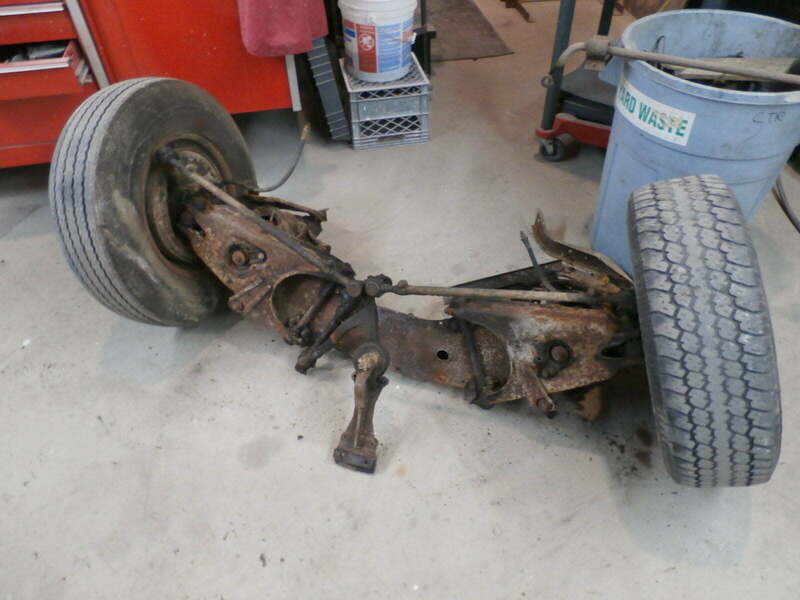 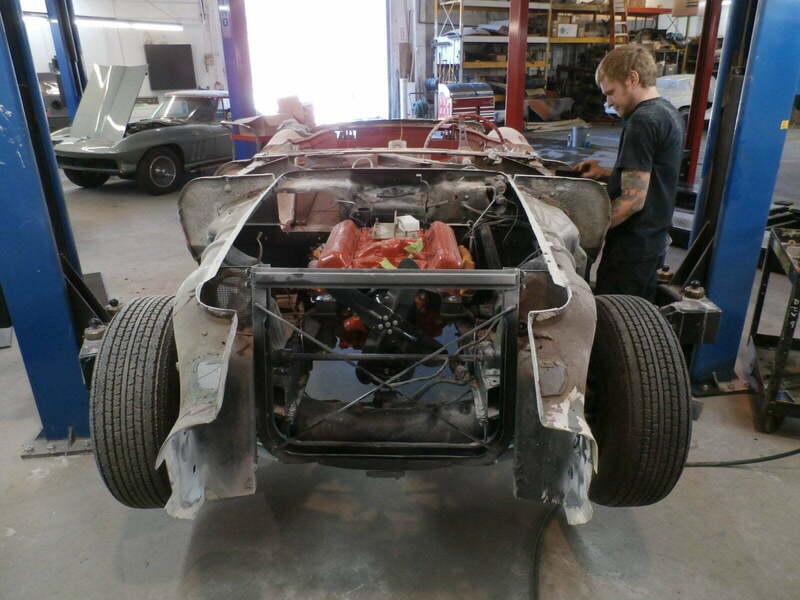 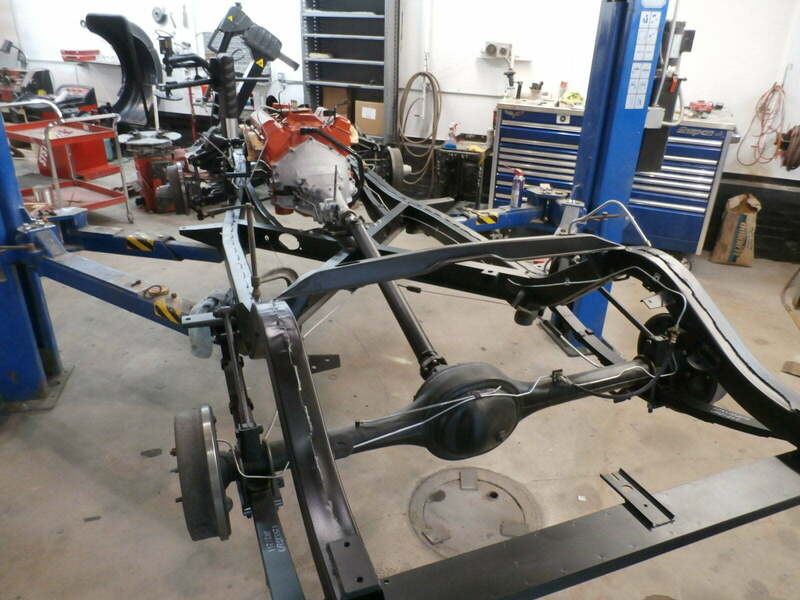 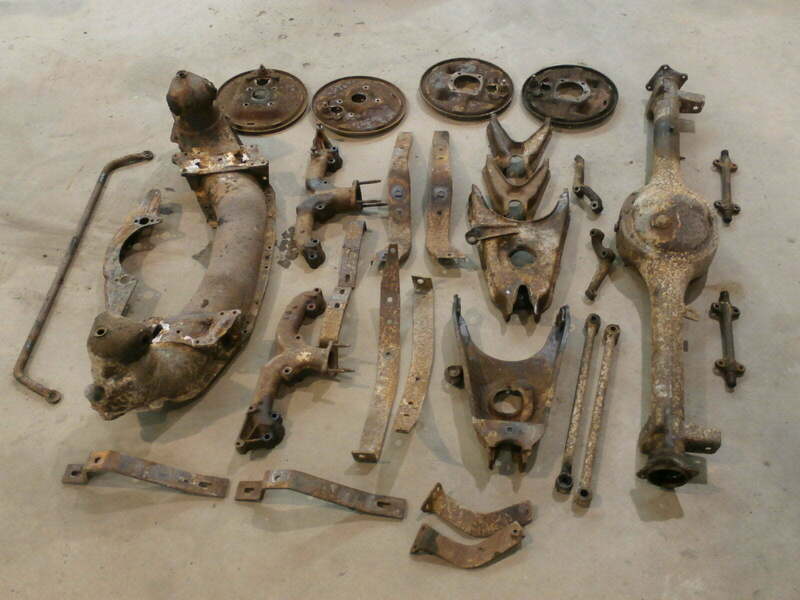 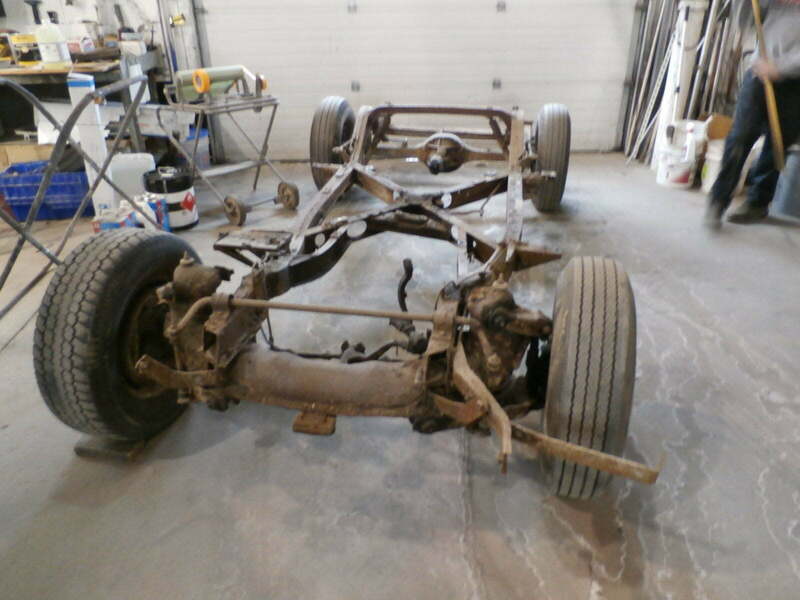 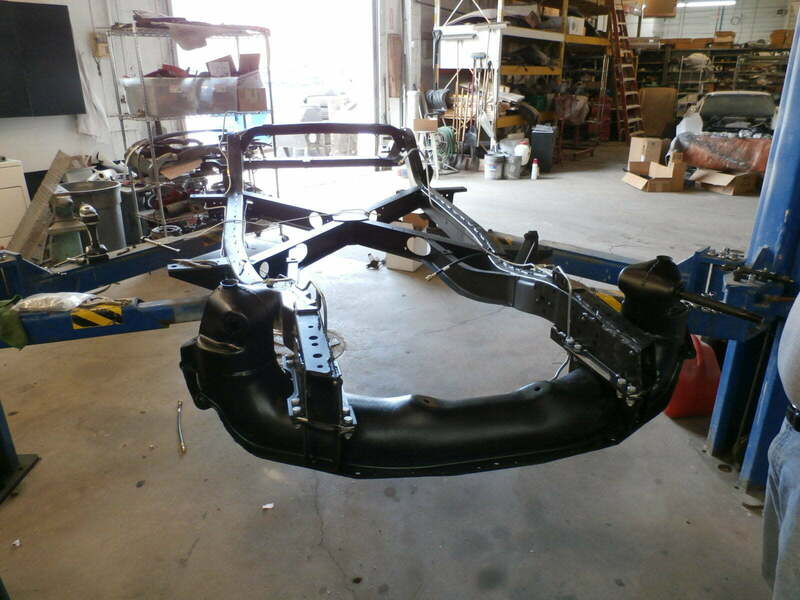 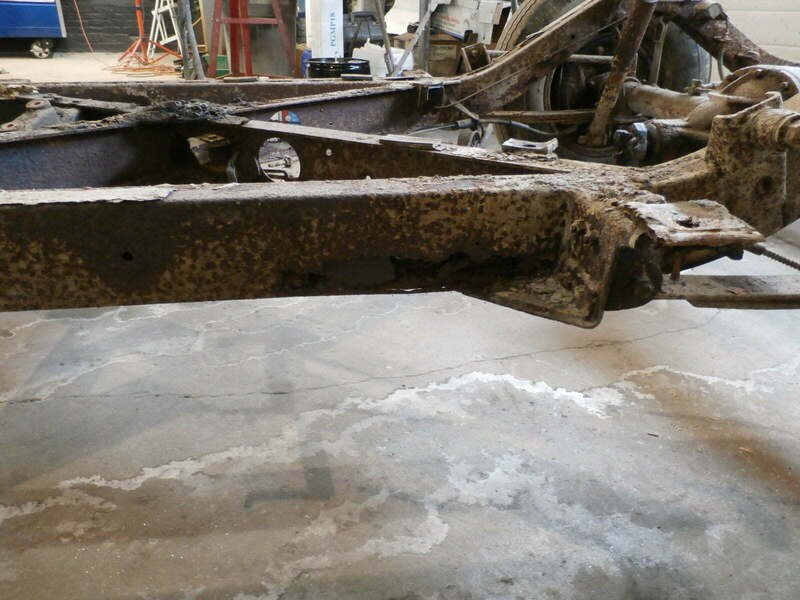 After the body was removed, the chassis was disassembled, the suspension removed, and the frame cut down for scrap. 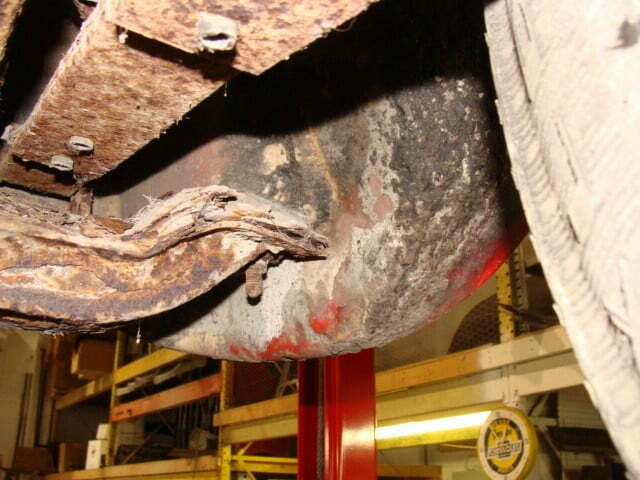 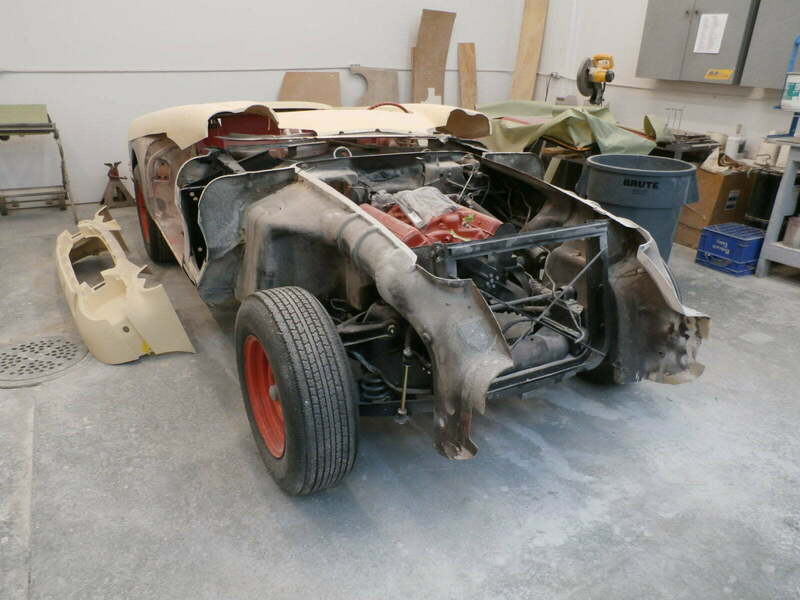 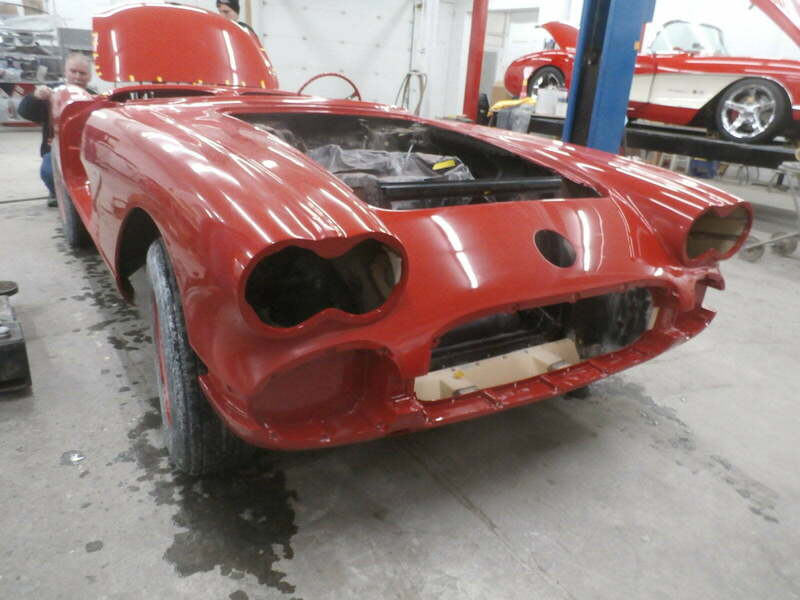 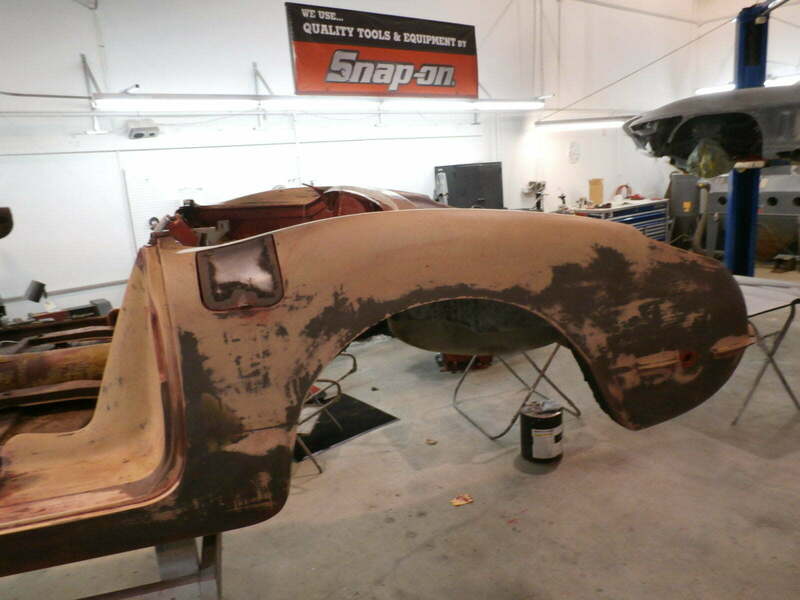 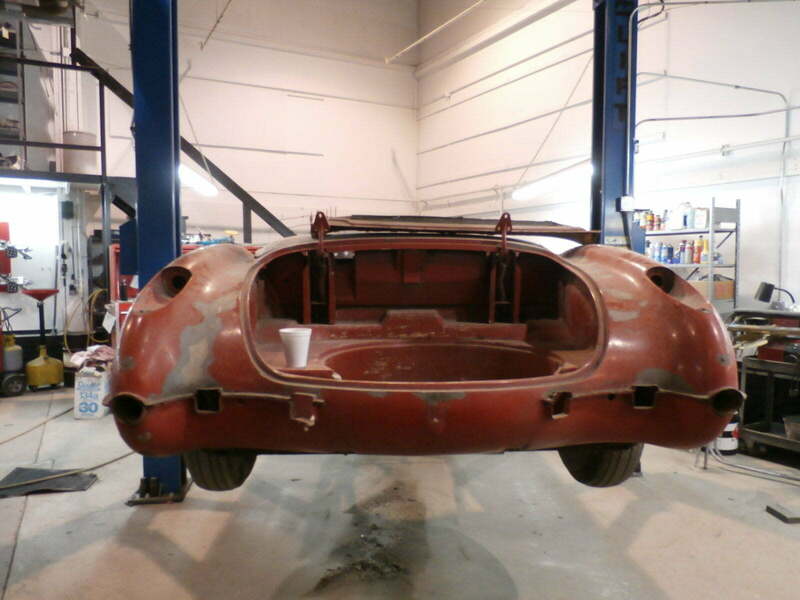 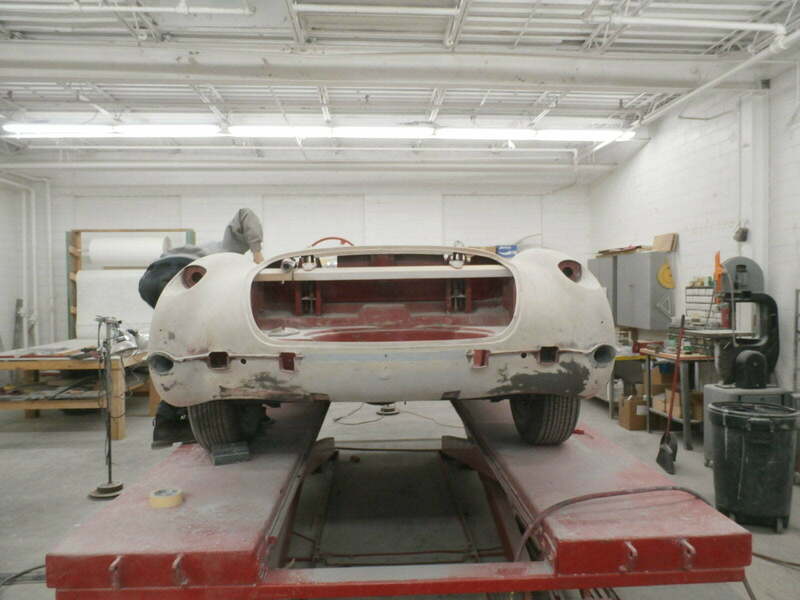 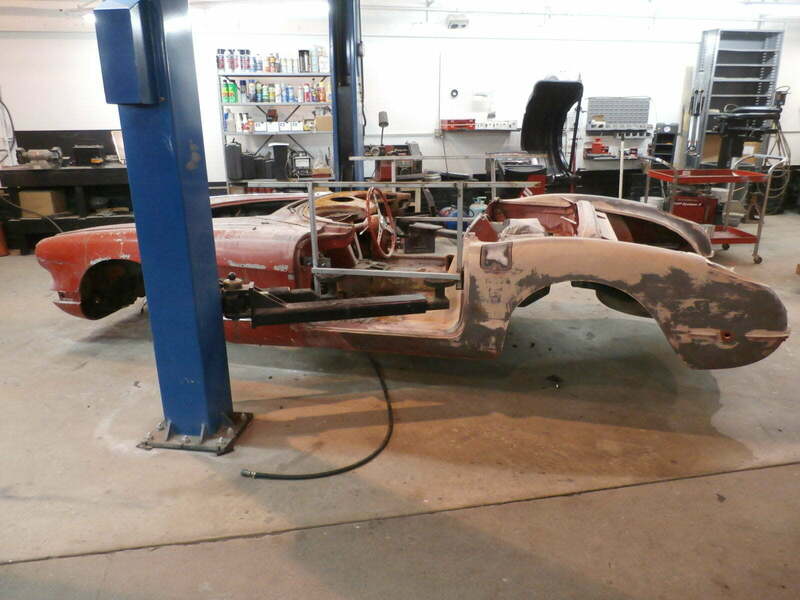 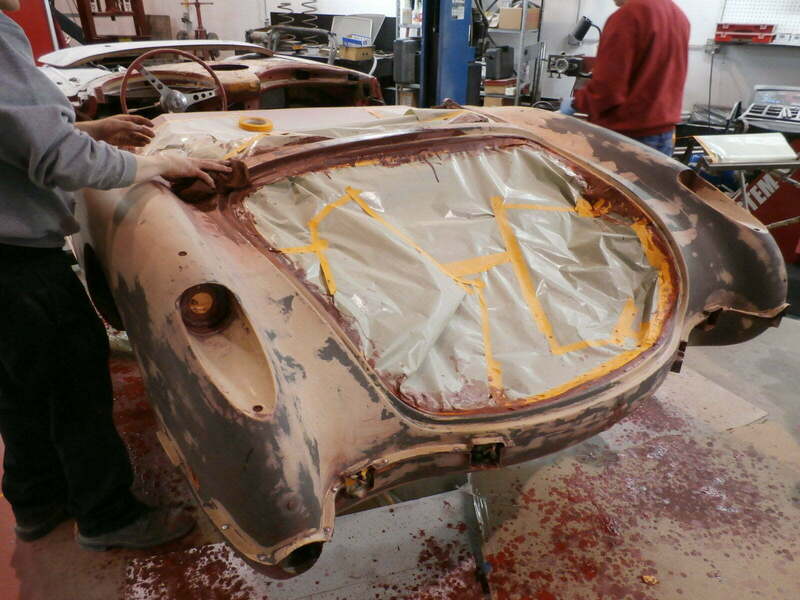 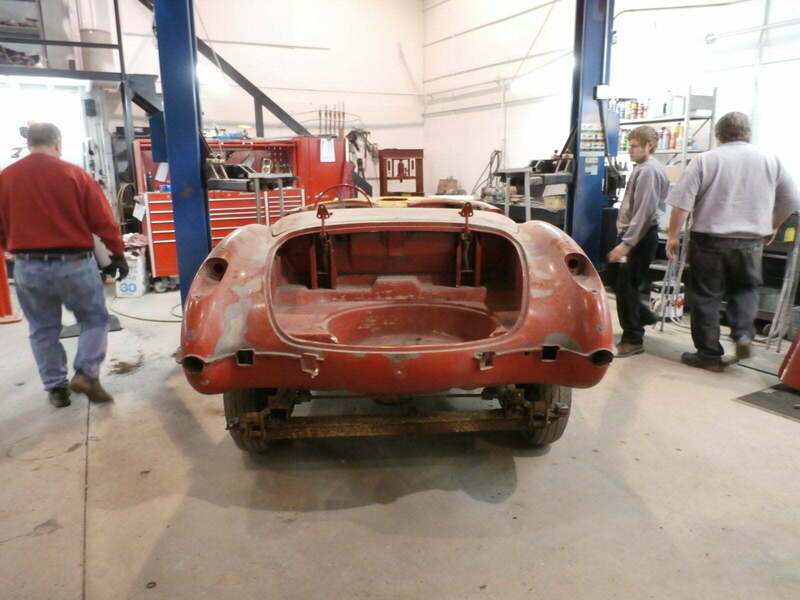 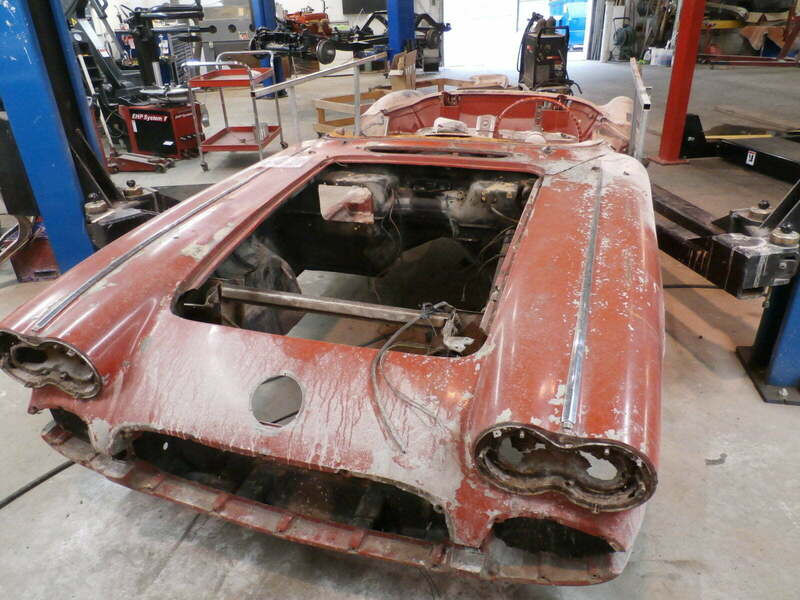 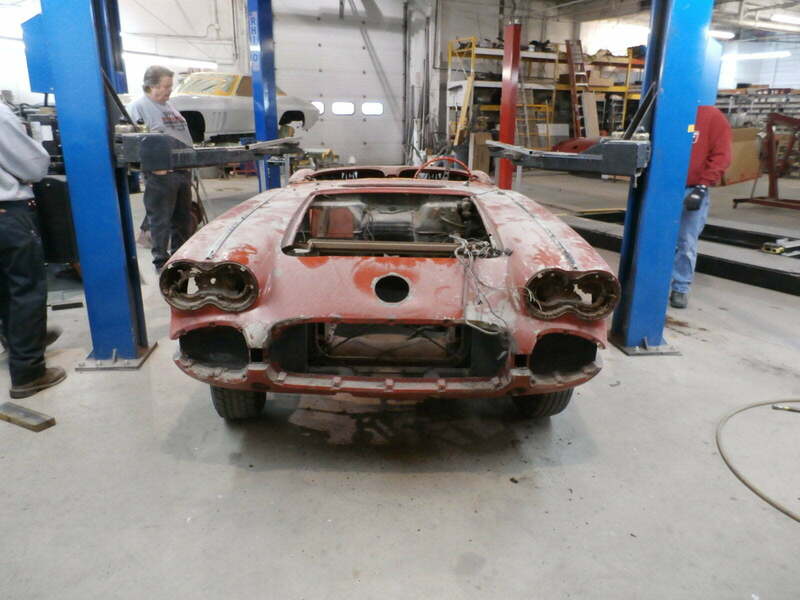 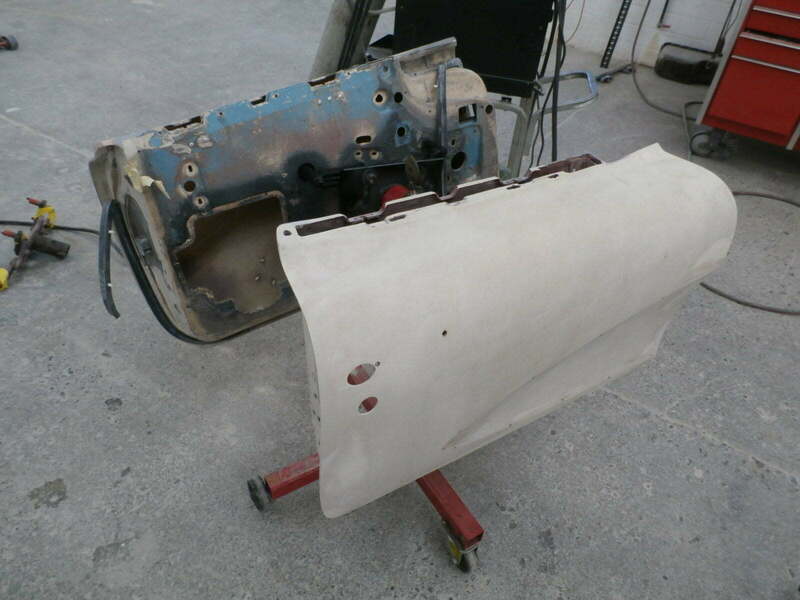 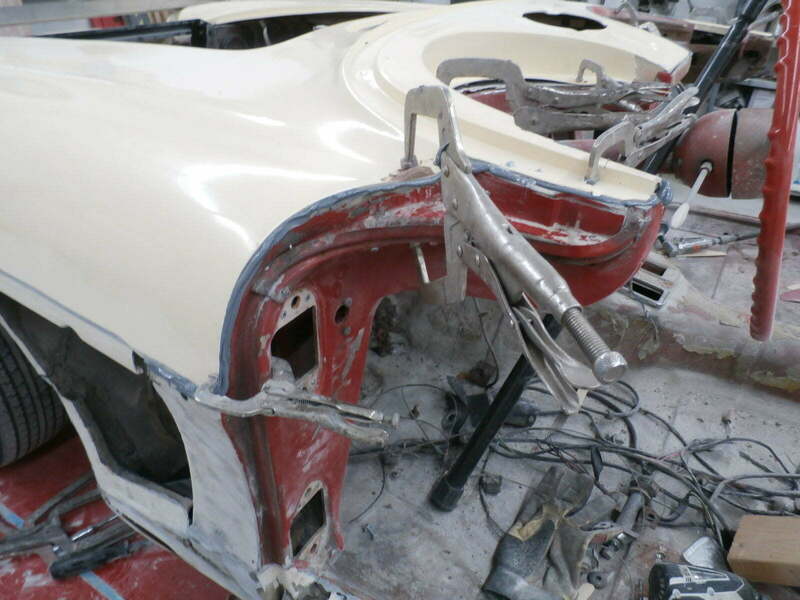 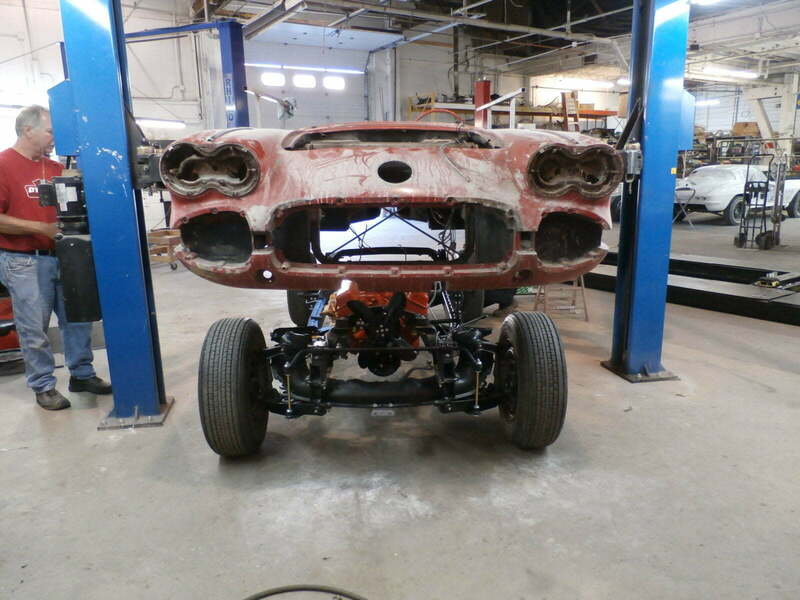 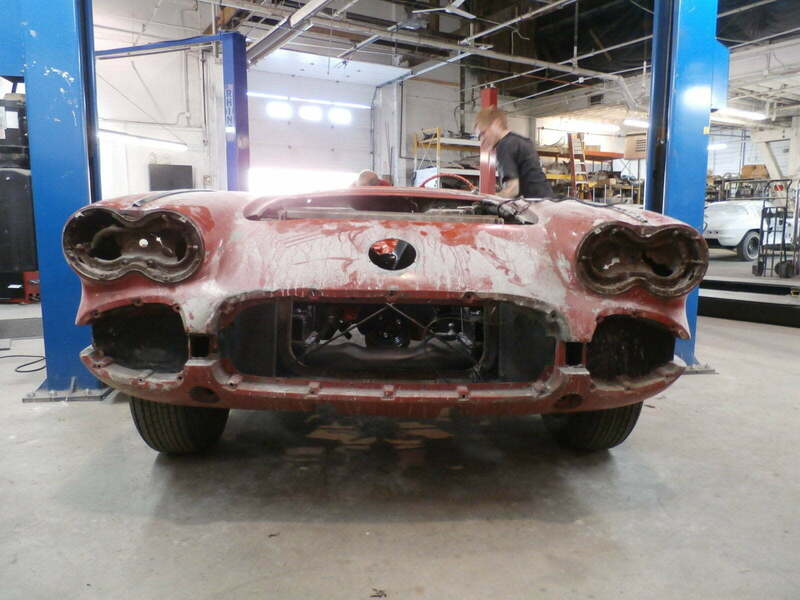 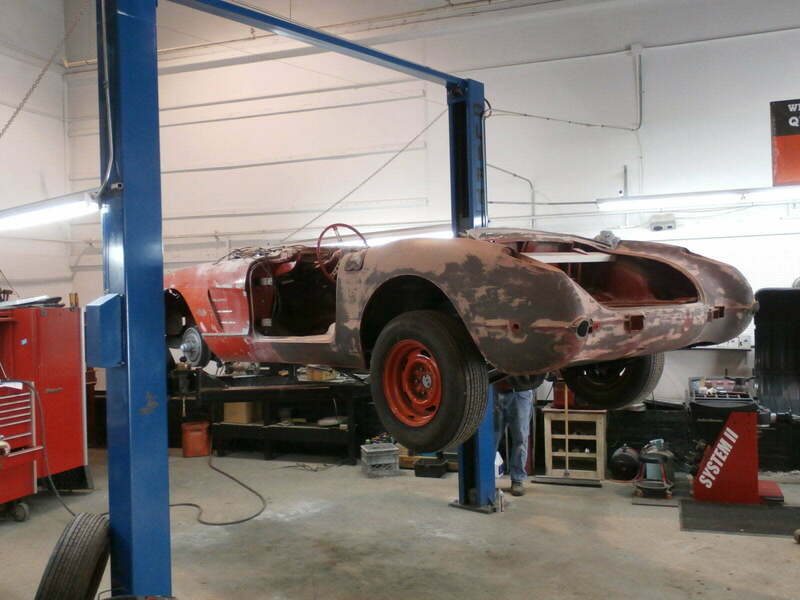 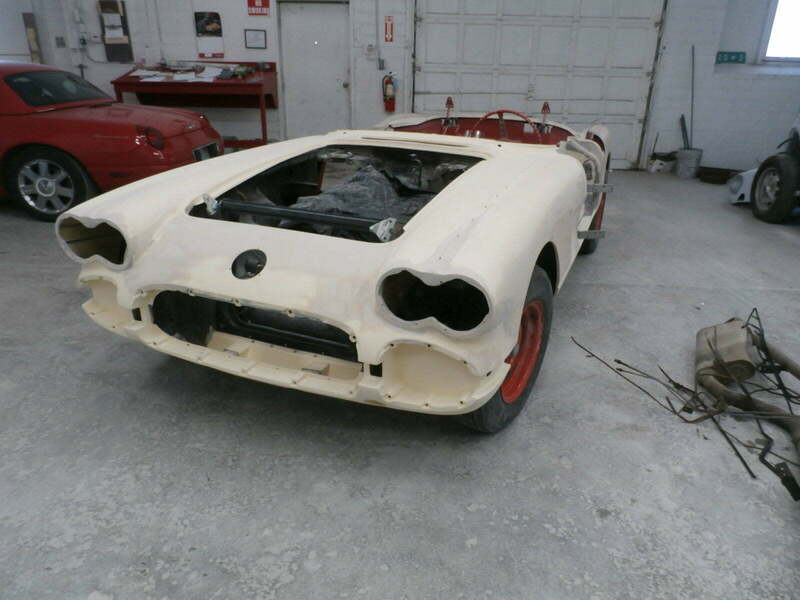 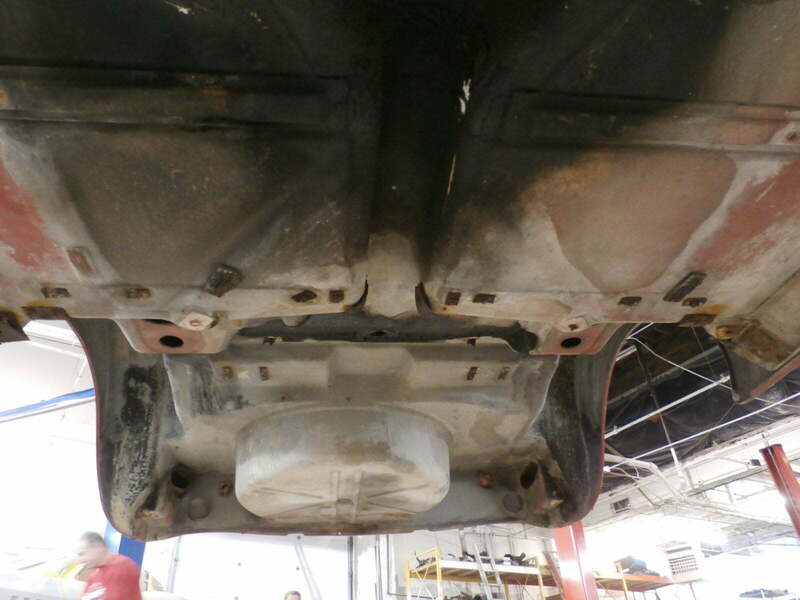 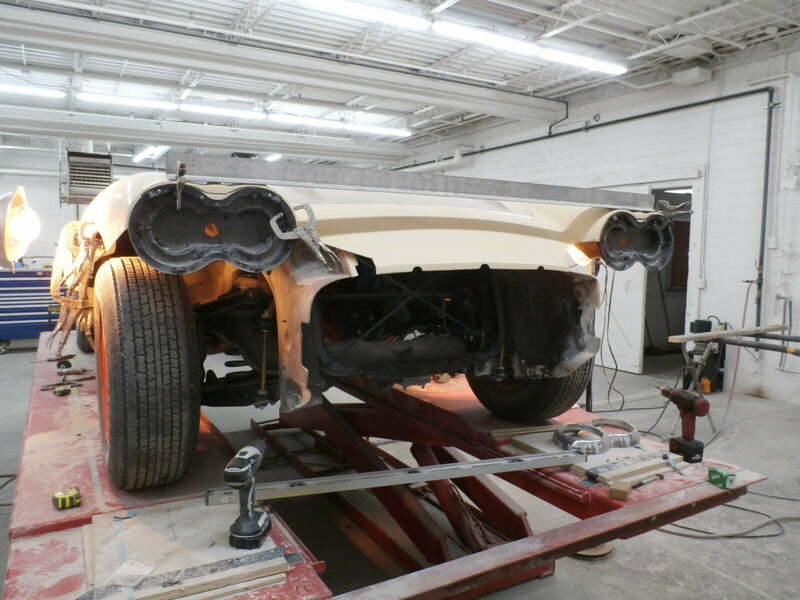 Now that the body has been removed, they masked off the rear end of the body and begun to strip the paint chemically. 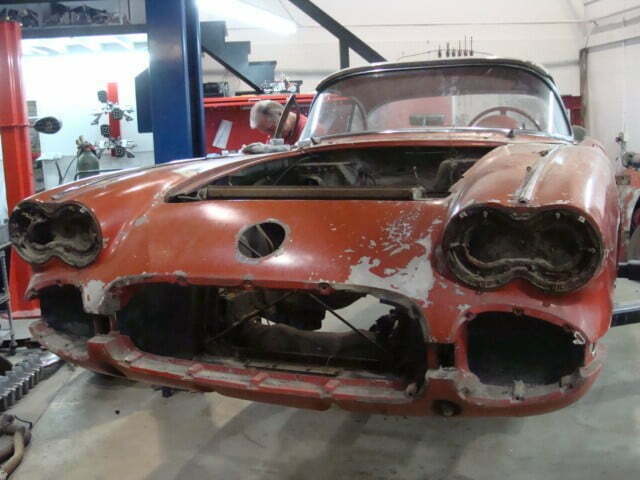 We did not strip the paint on the front end because we were going to replace those fiberglass panels anyway. 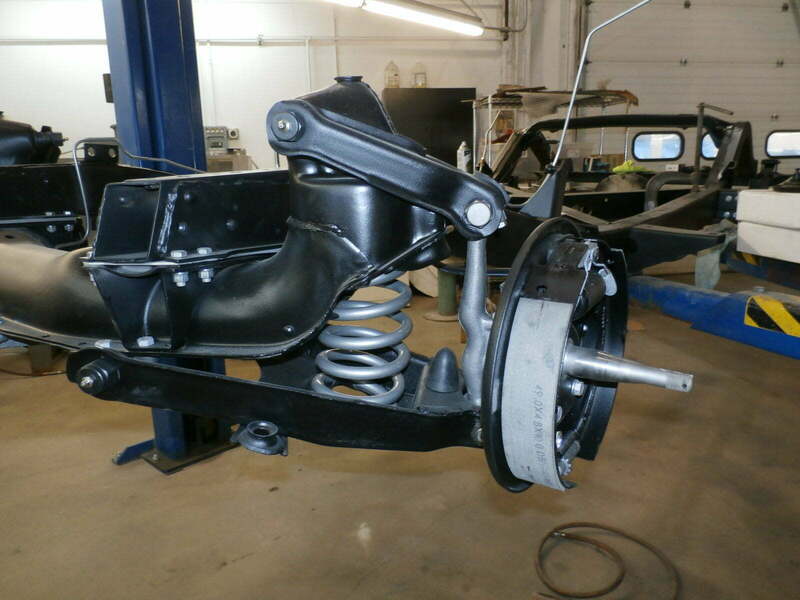 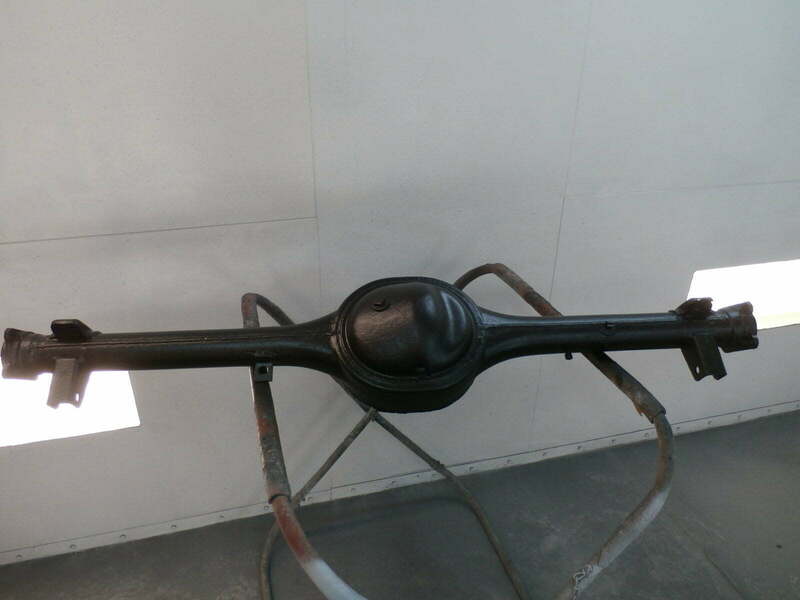 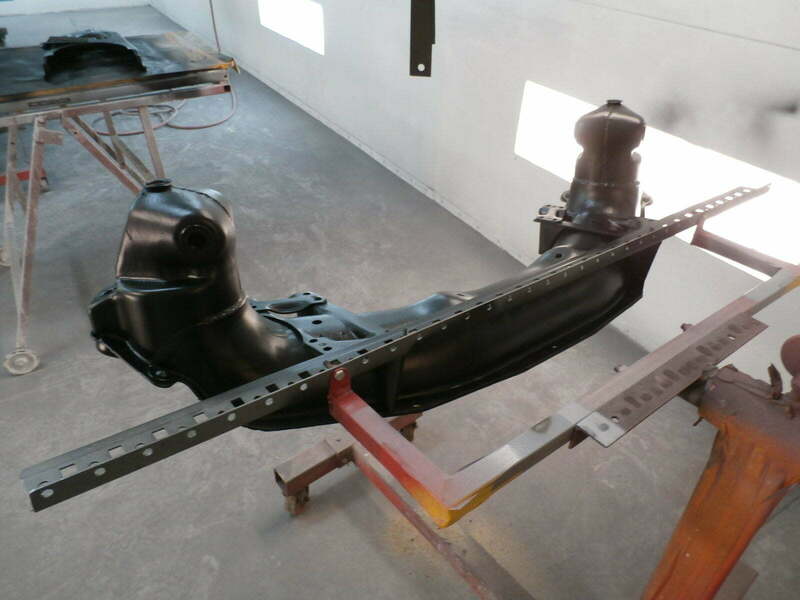 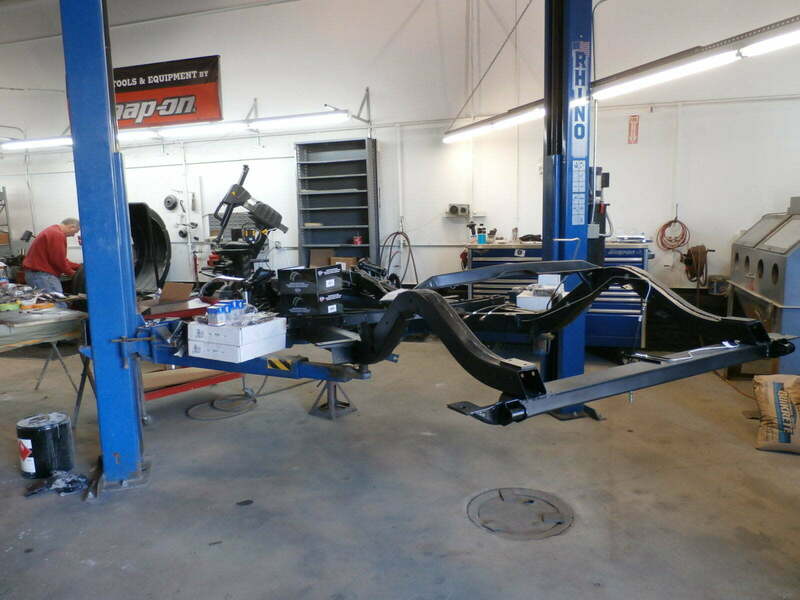 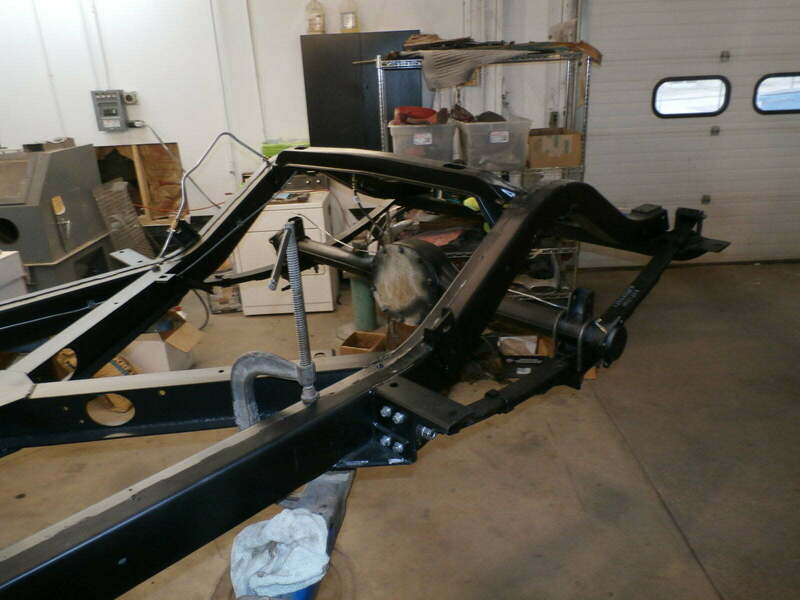 After a new frame was obtained, it was quickly rushed into our paint booth and painted with chassis black along with all of the removed suspension pieces. 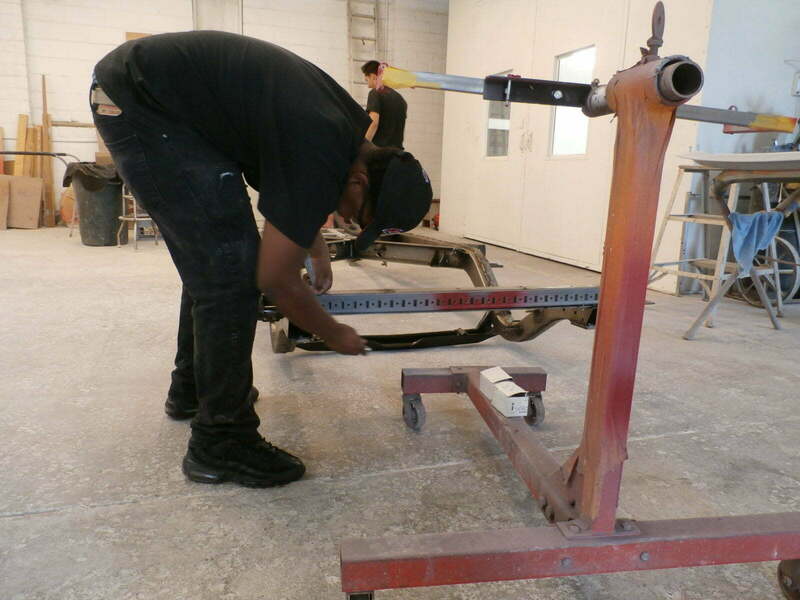 Once the chassis and suspension pieces were ready, we started to build up the chassis by installing the suspension and powertrain. 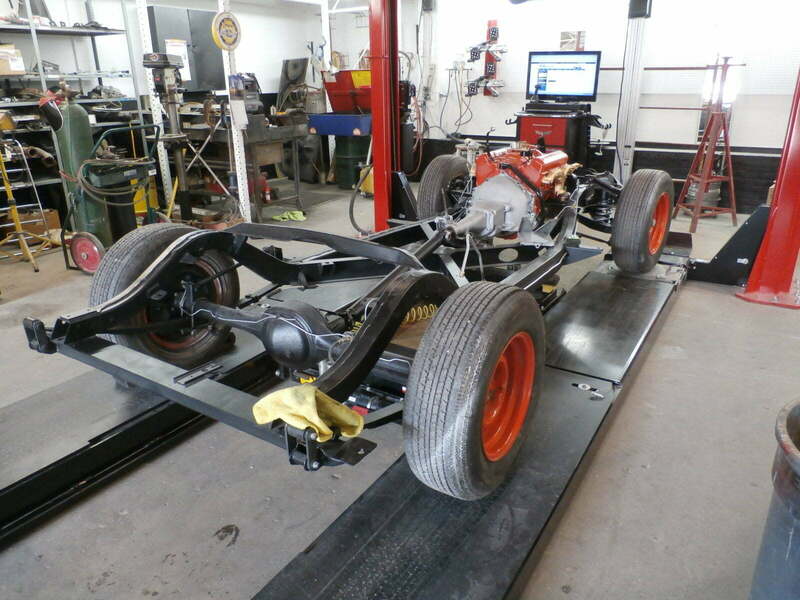 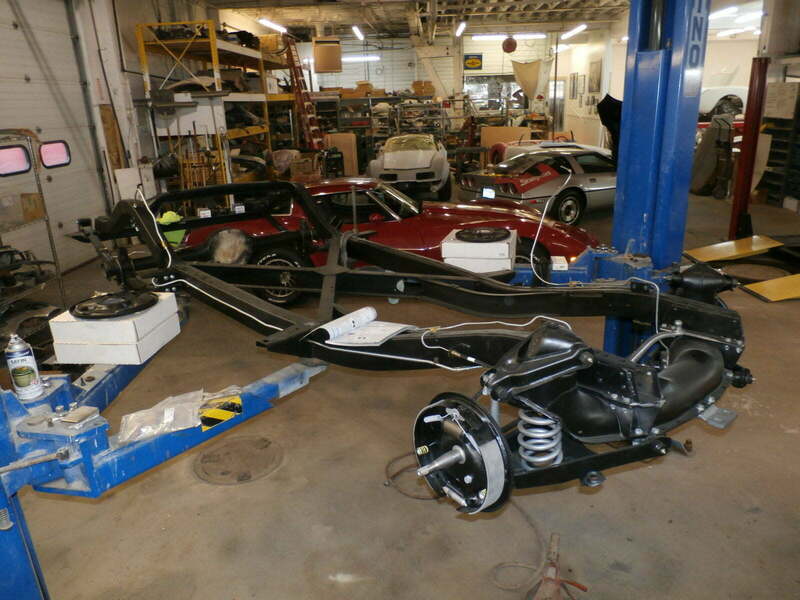 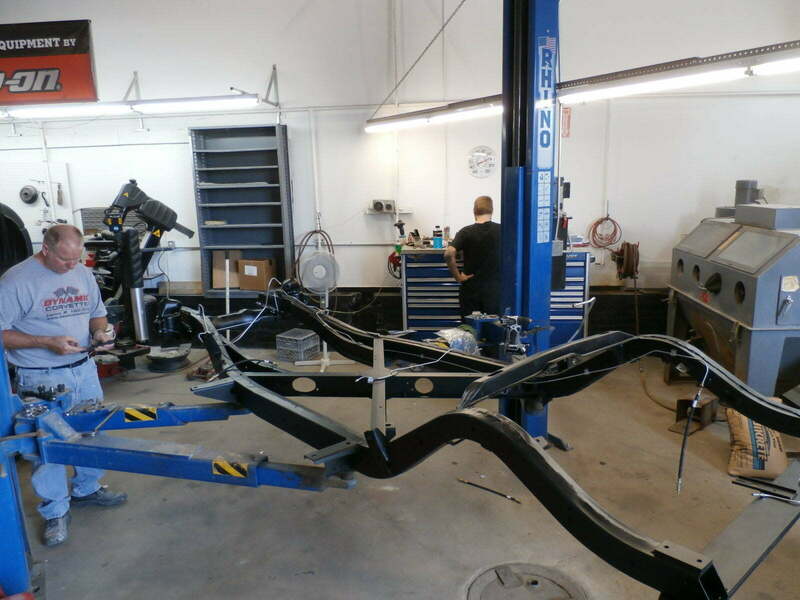 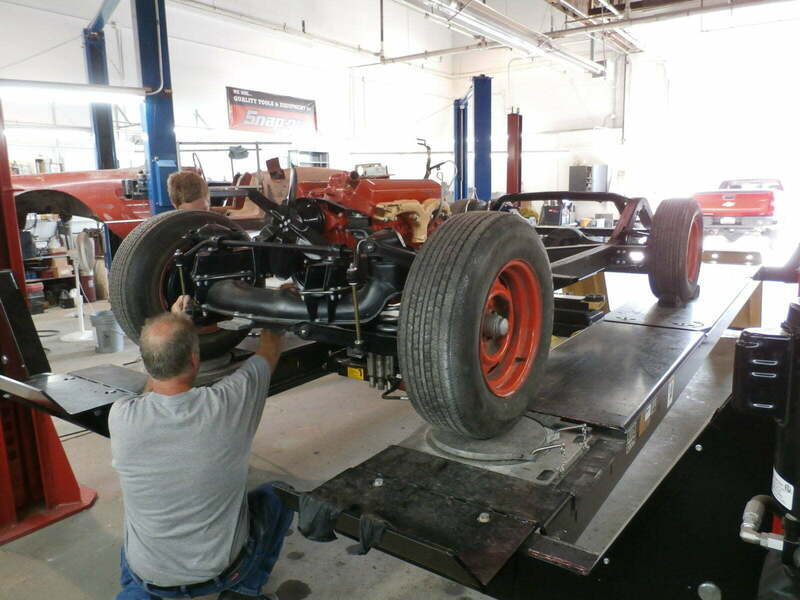 Once the chassis was built and wheels installed, Ed put the chassis on the alignment rack and aligned the suspension before installing the body. 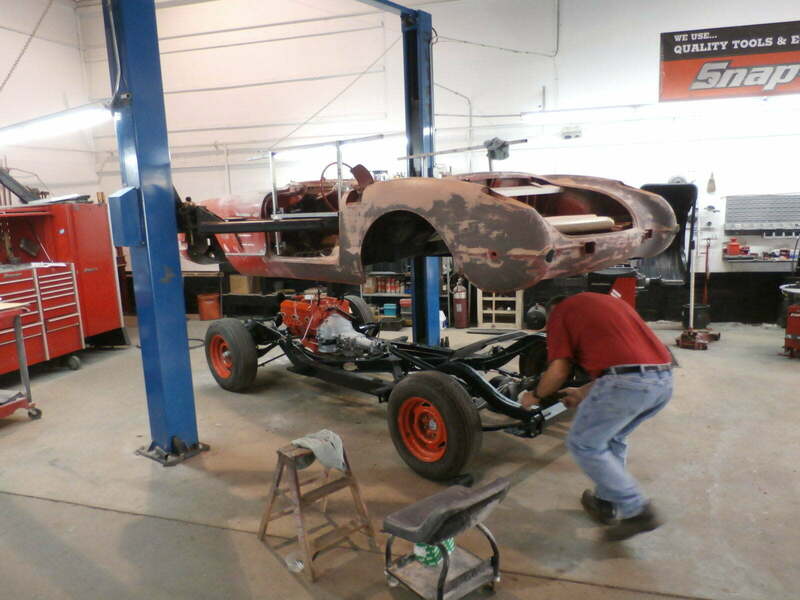 After he was finished, we rolled the body over to the hoist, lifted it, and then rolled the new chassis underneth and slowly lowered the body back down. 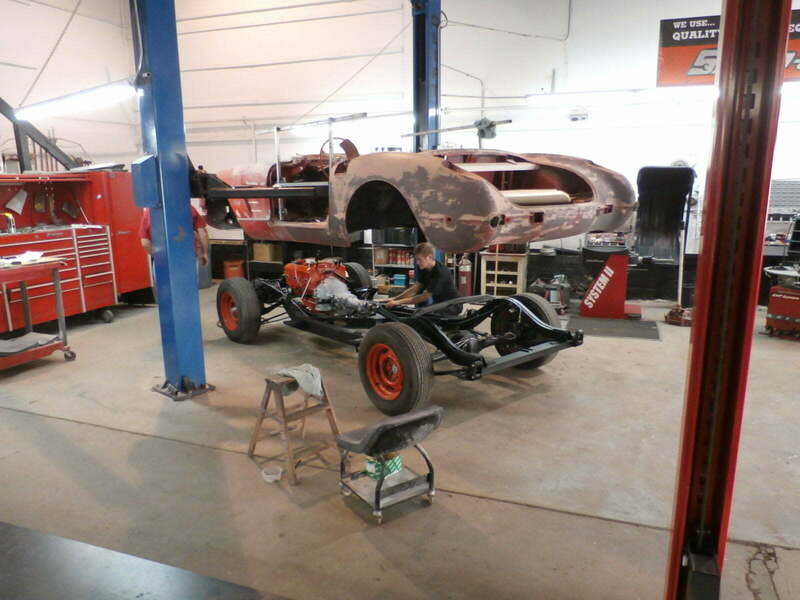 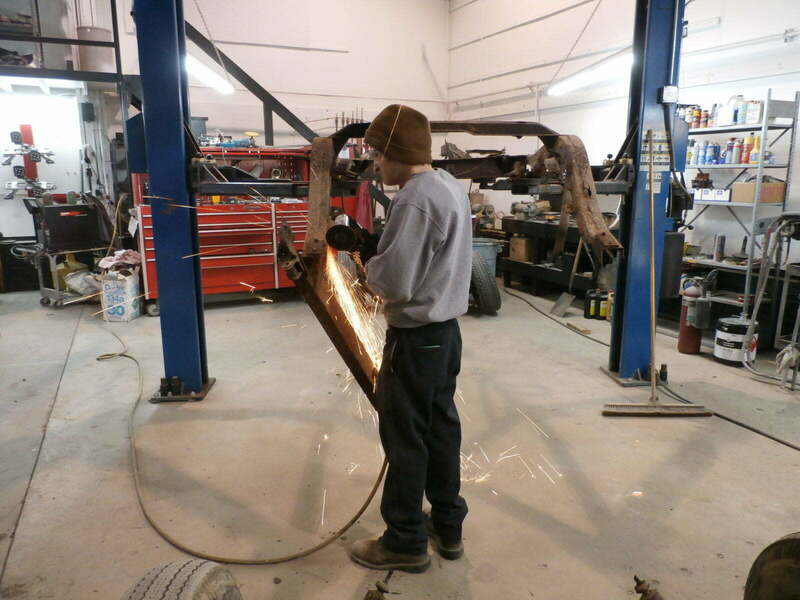 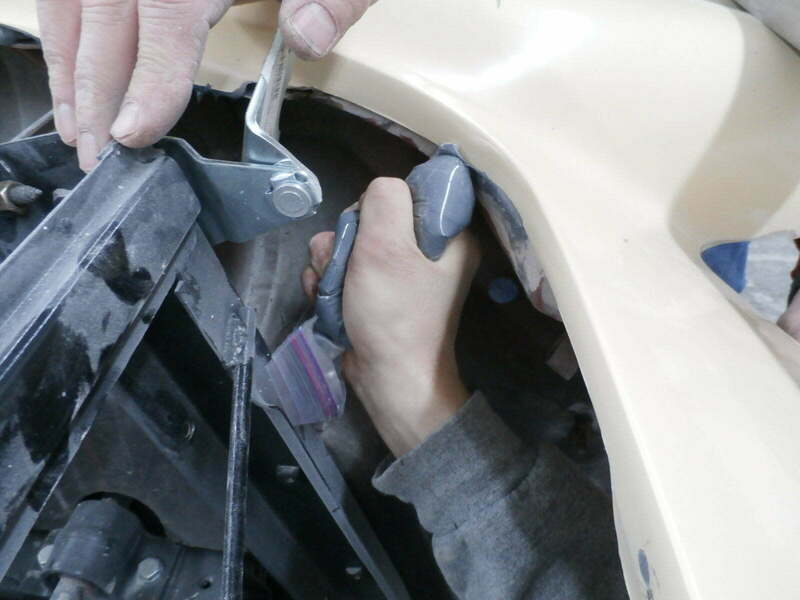 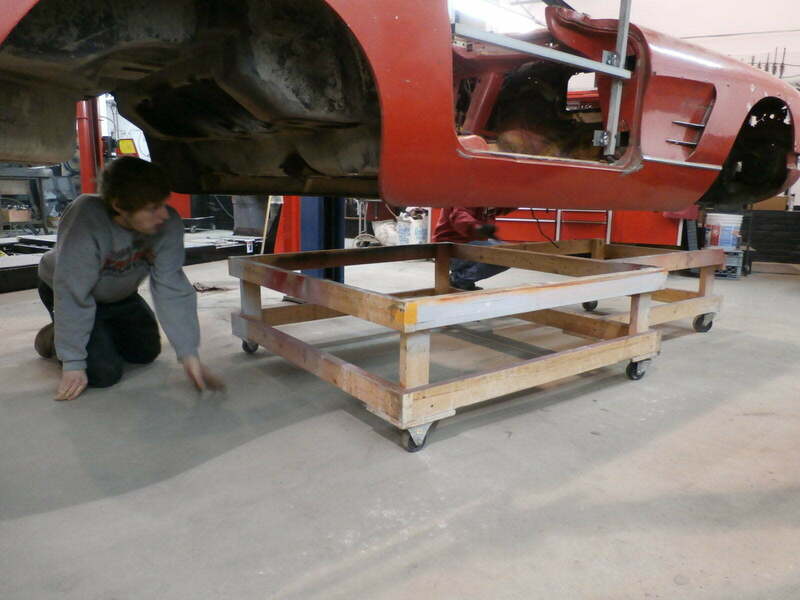 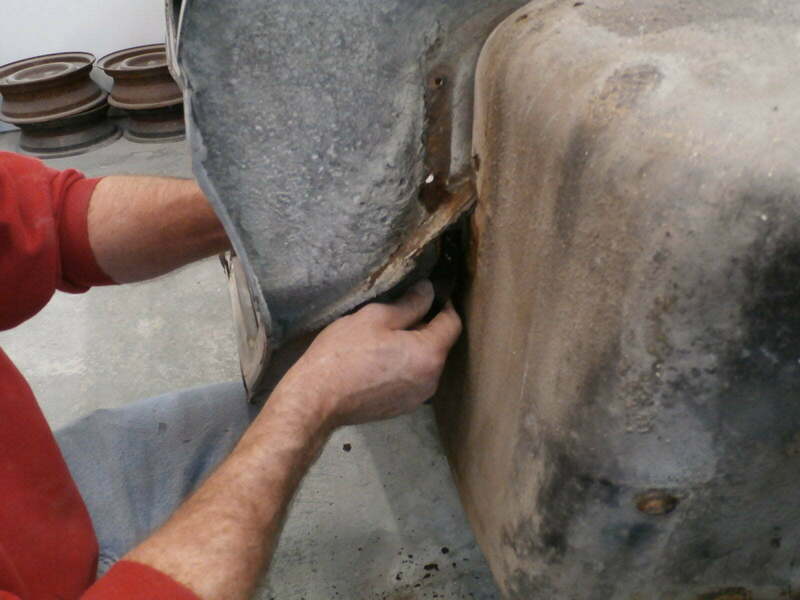 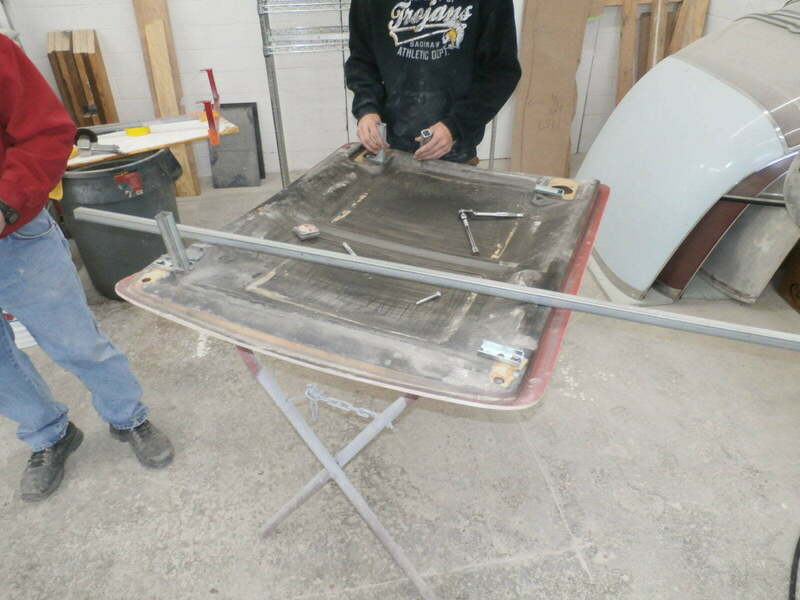 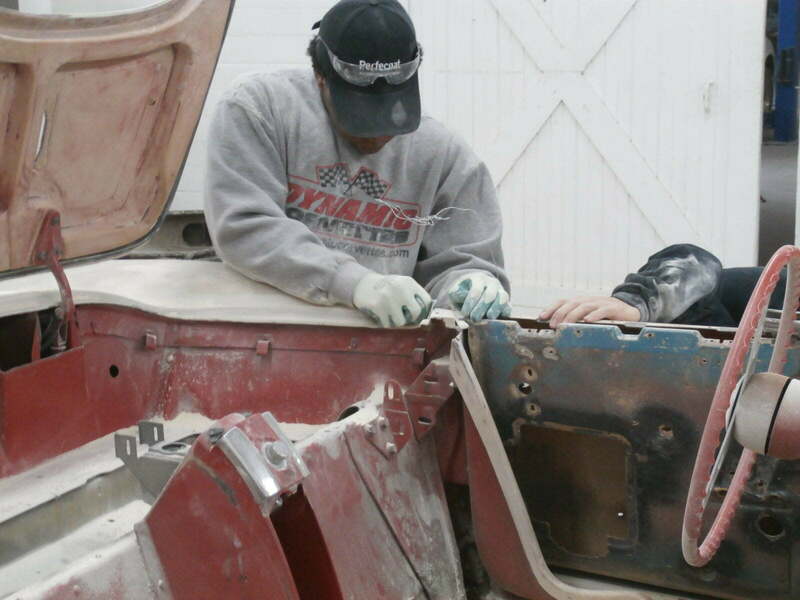 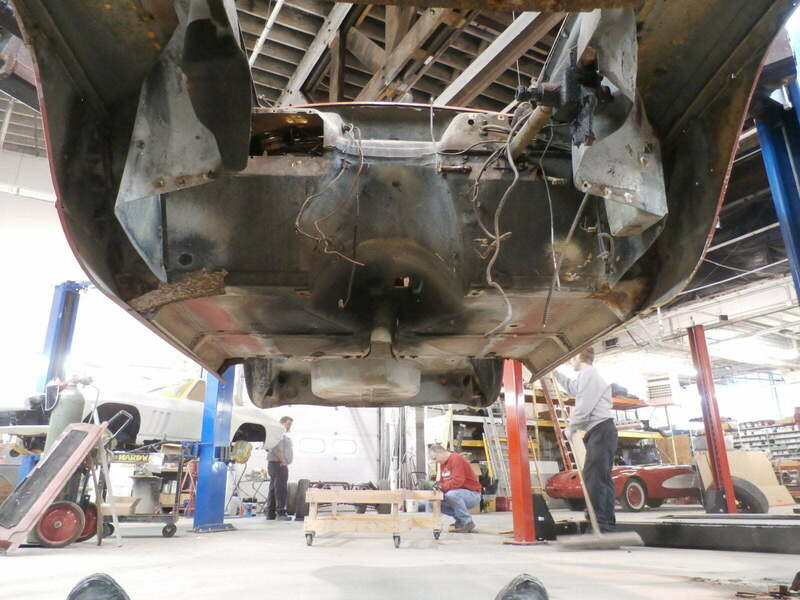 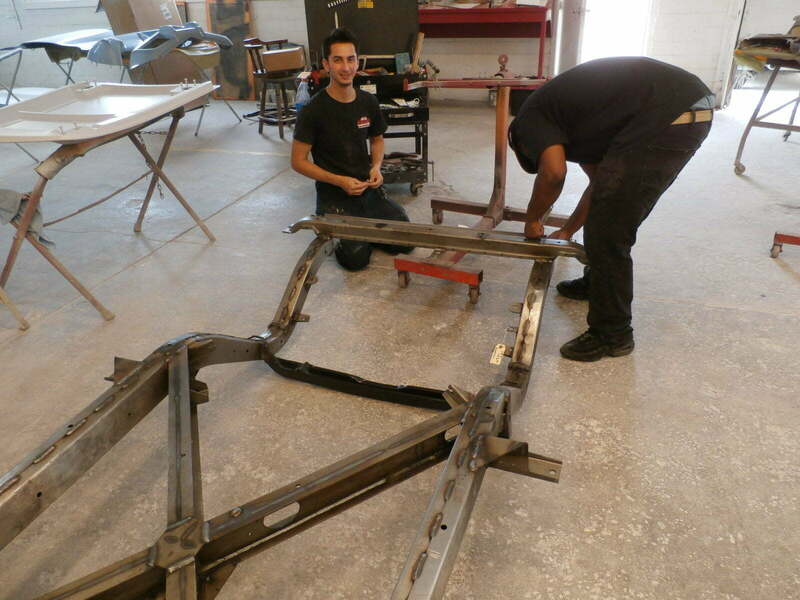 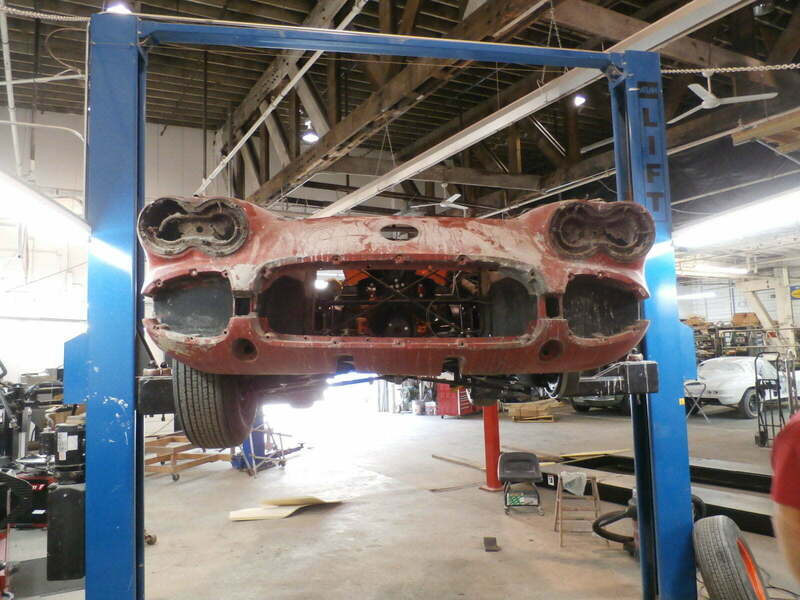 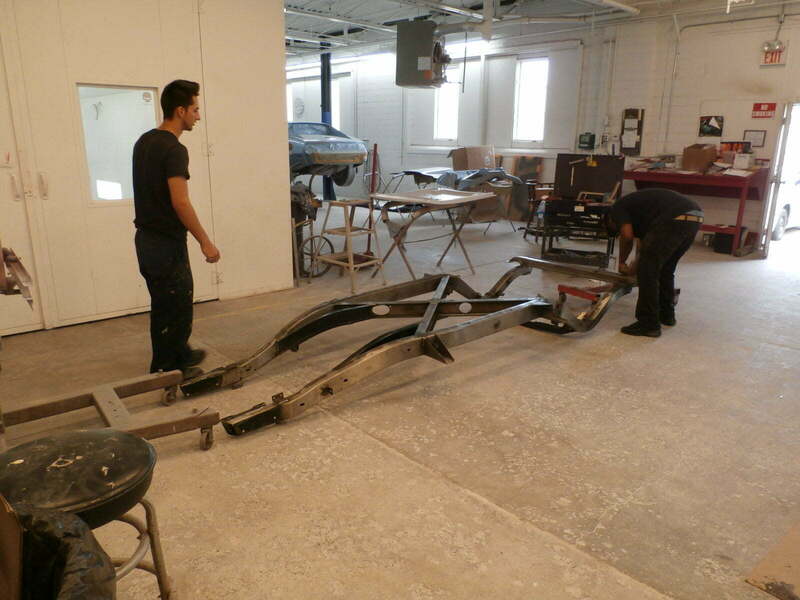 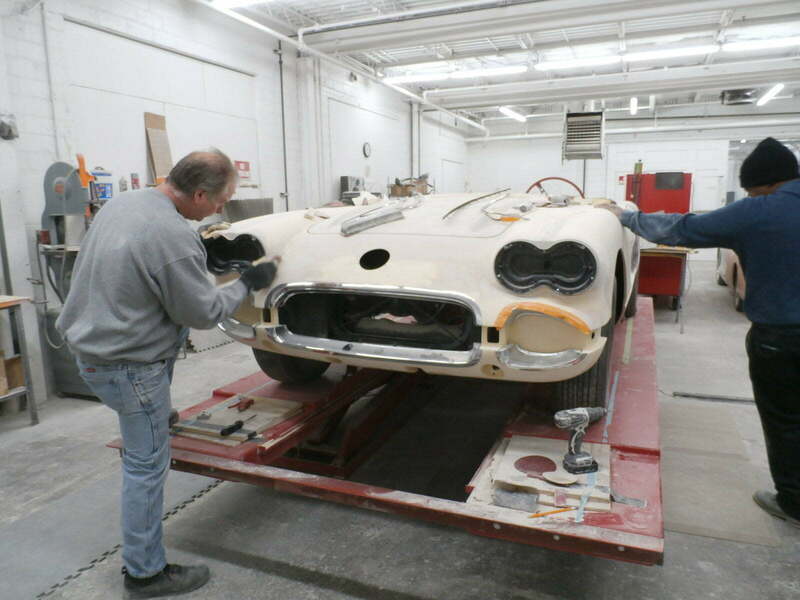 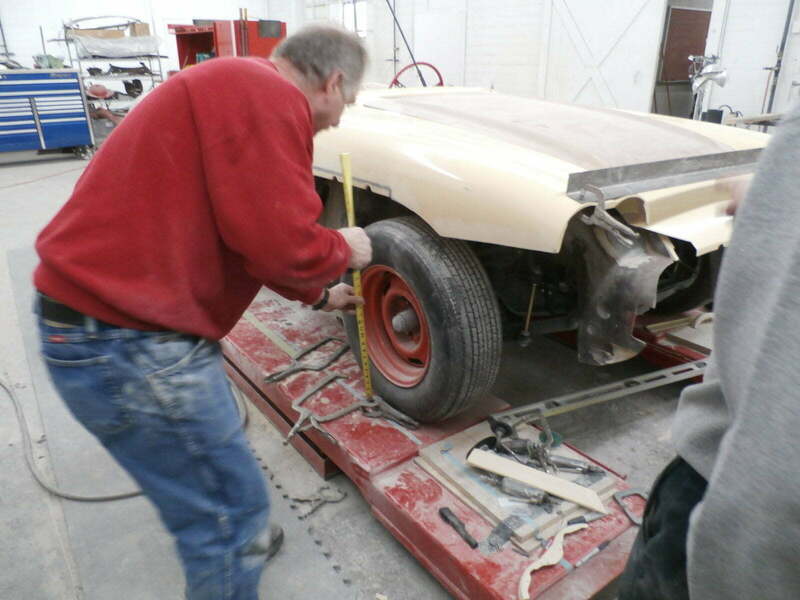 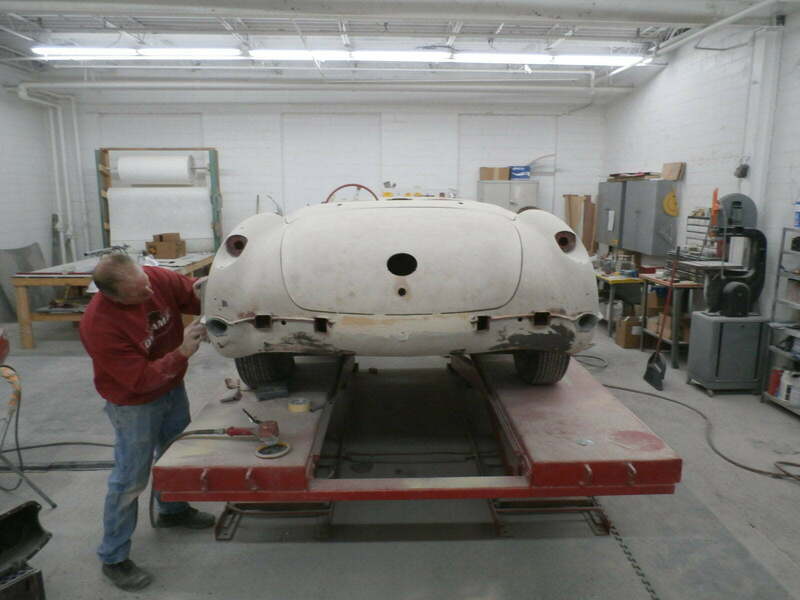 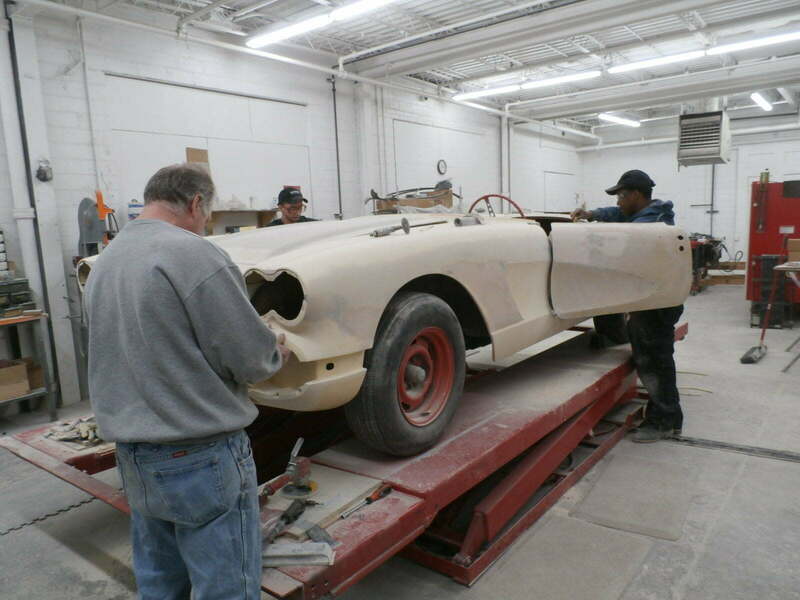 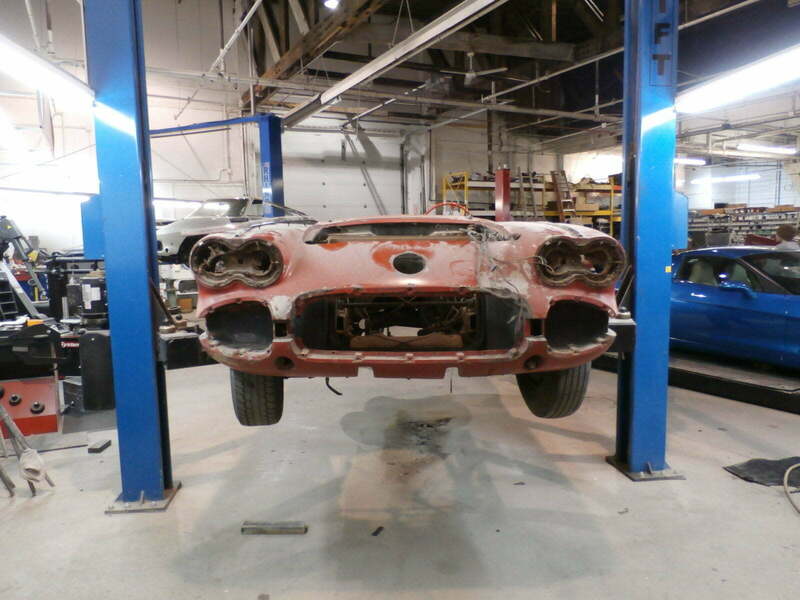 With the body firmly planted on the new chassis, they started to remove and repair the front end. 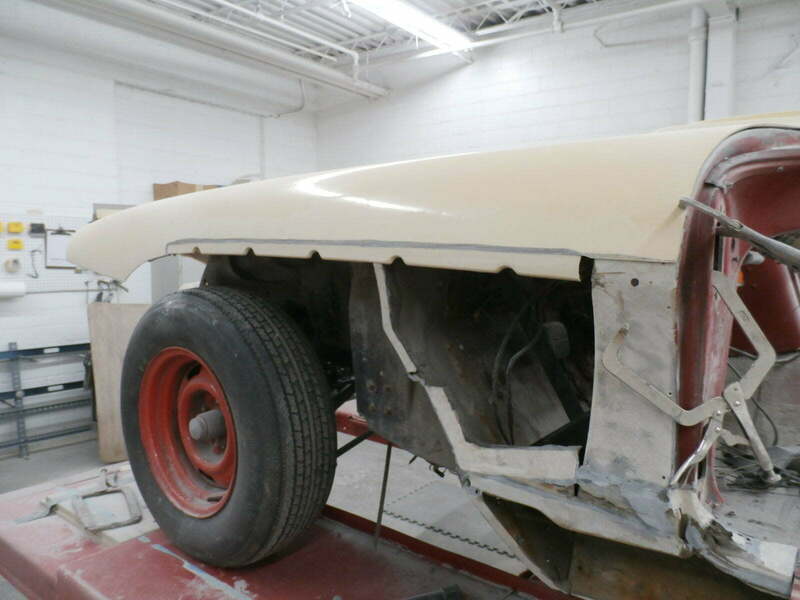 First the old hood surround and lower fenders were removed, followed by Ed prepping and dry fitting the new panels multiple times to insure they will fit perfectly. 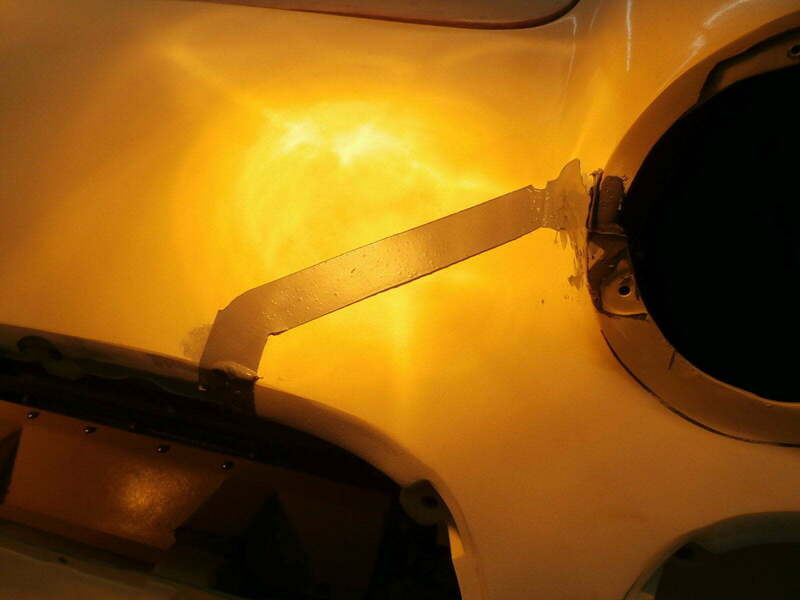 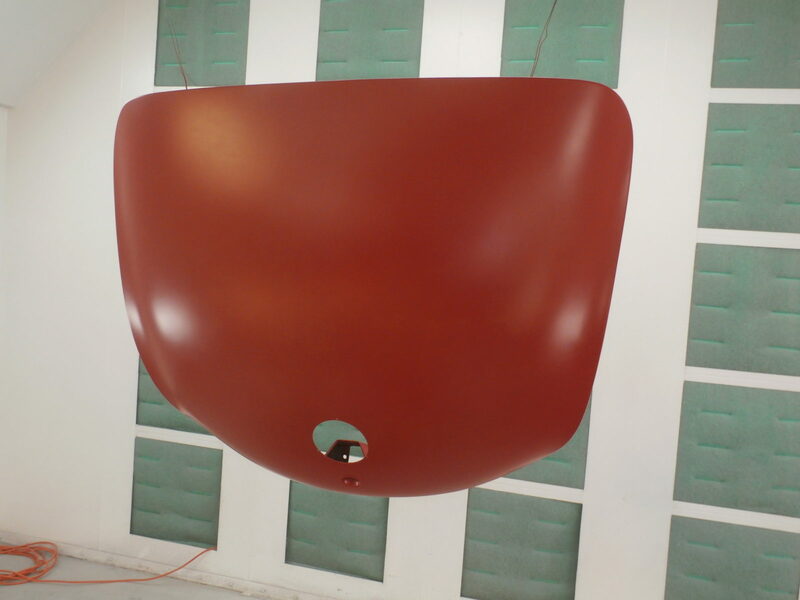 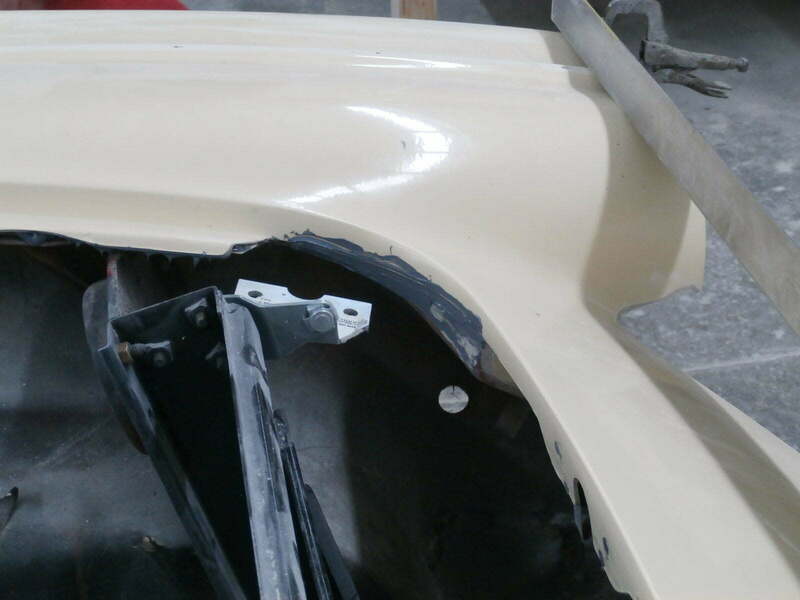 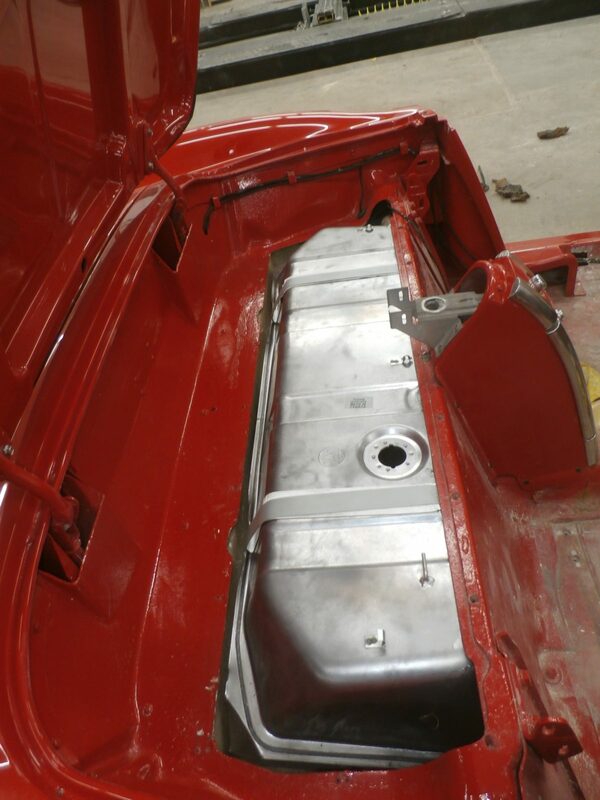 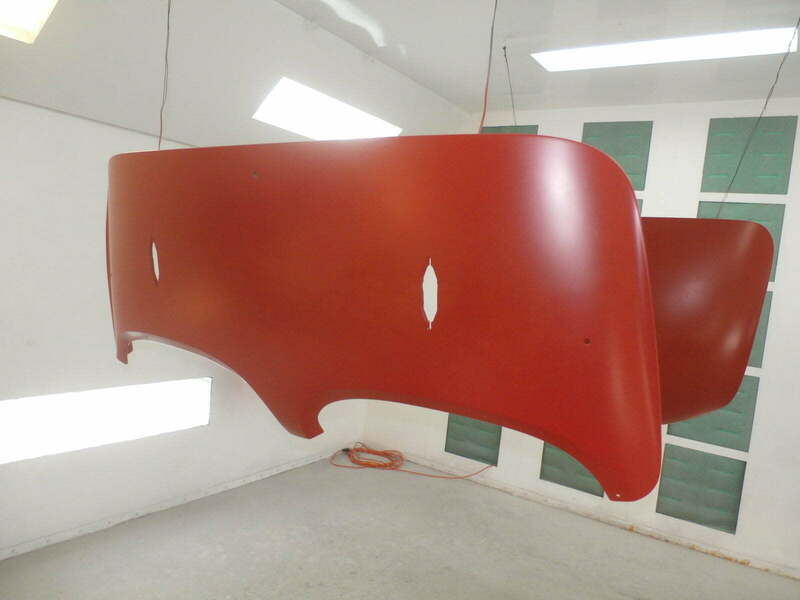 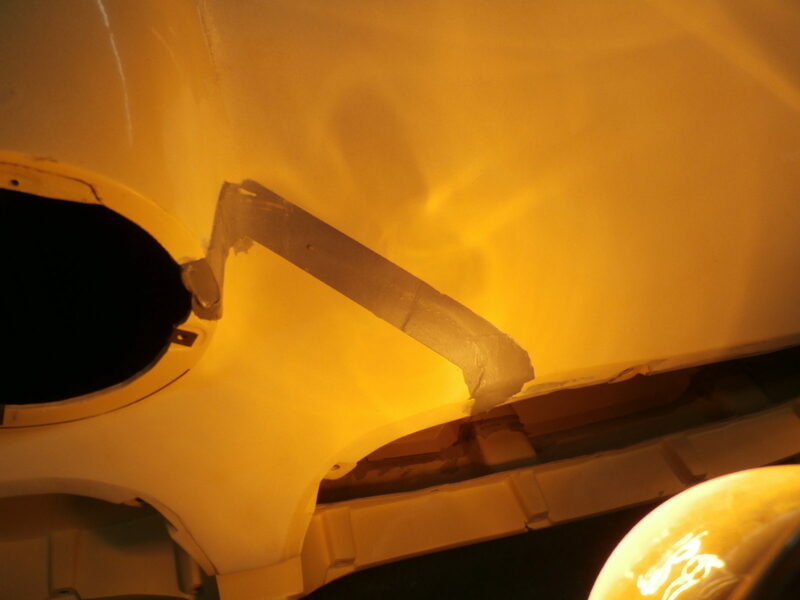 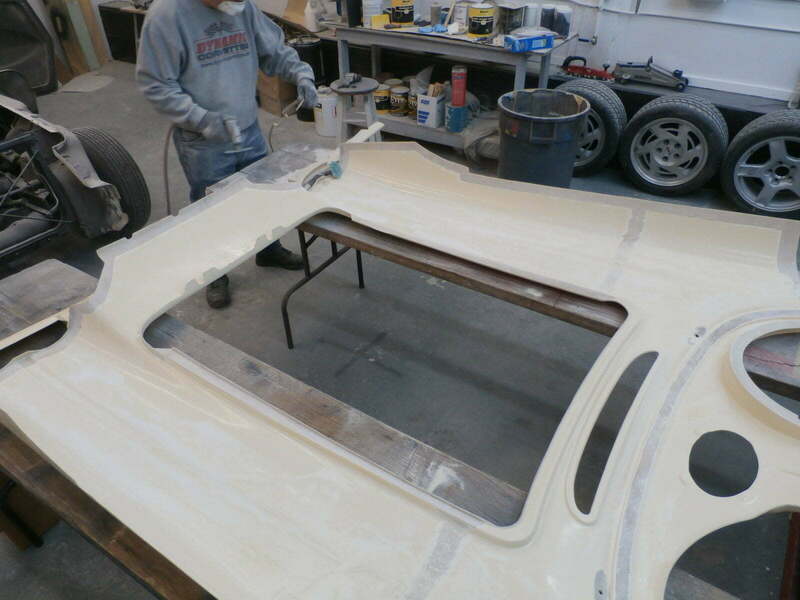 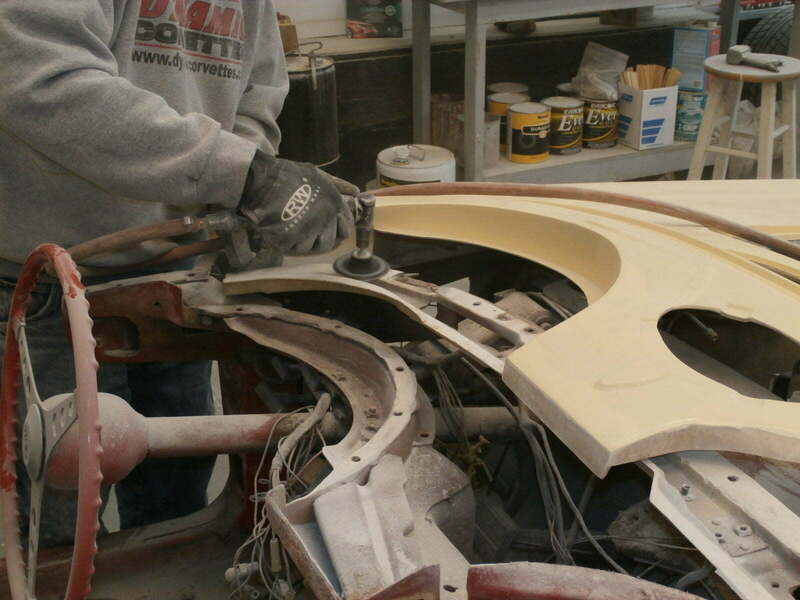 After making adjustments and installing supports under the hood surround, he applied epoxy at all of the bonding points and installed the hood surround. 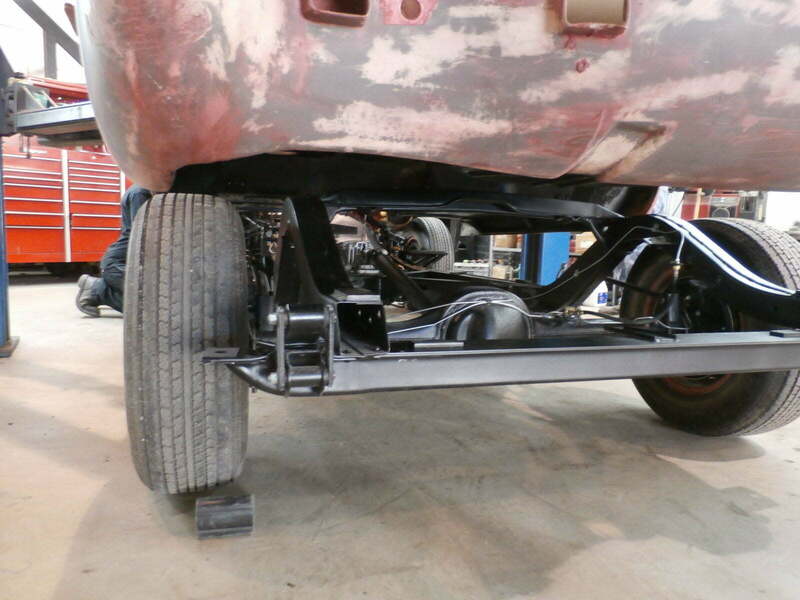 Shortly thereafter, the lower fenders and lower front end was installed and bonded in. 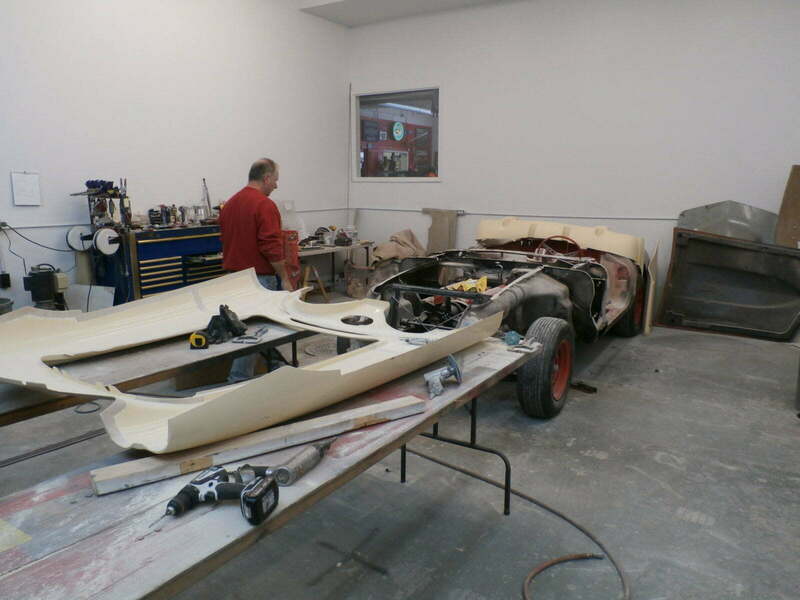 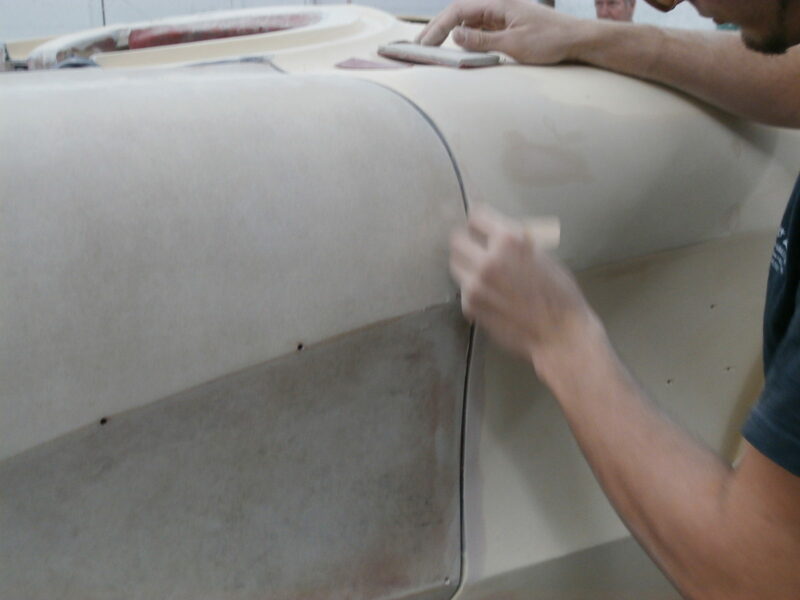 Now that the fiberglass panels have been replaced, they moved onto filling and sanding the body to insure all the body lines are absolutely perfect. 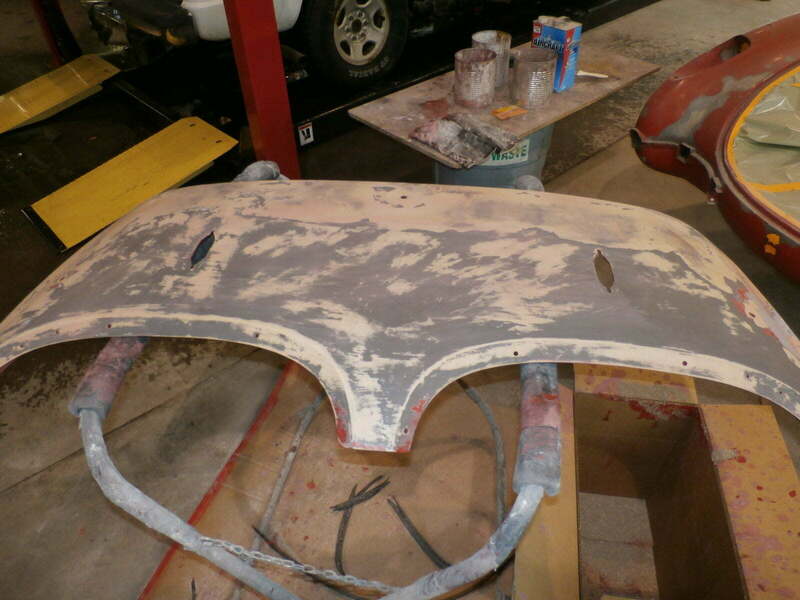 Now that the first stage of filling and sanding is complete. 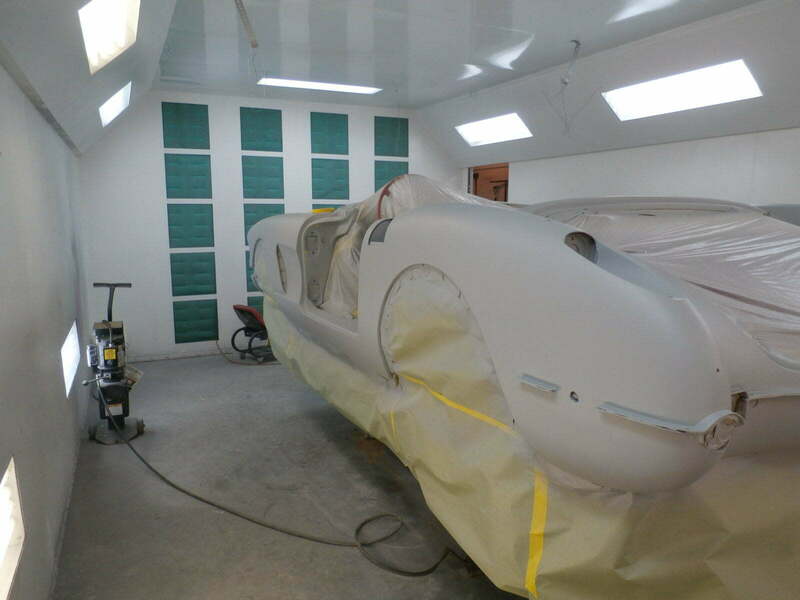 They mask off the entire vehicle in preparation for the first coat of primer. 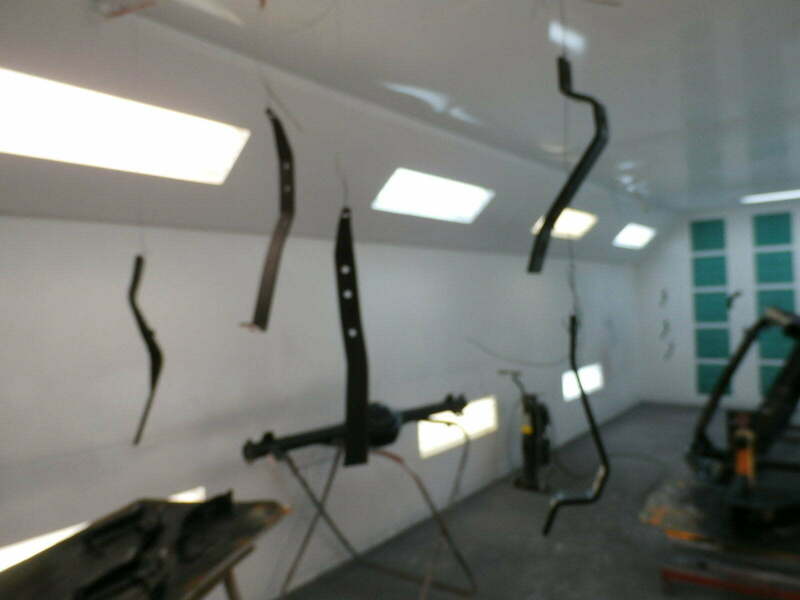 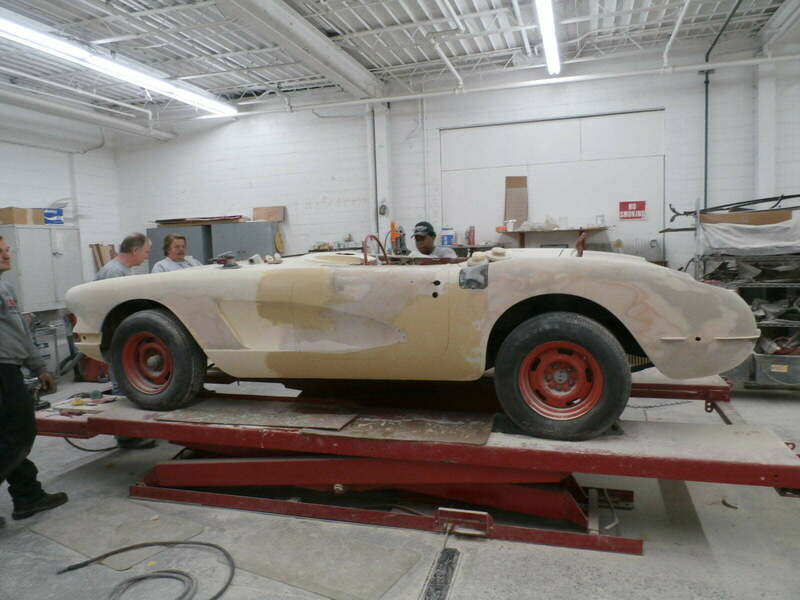 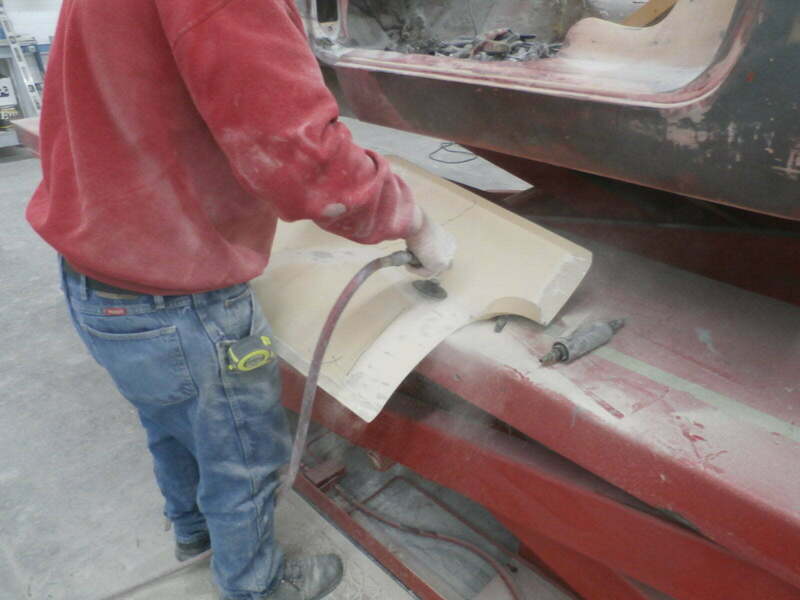 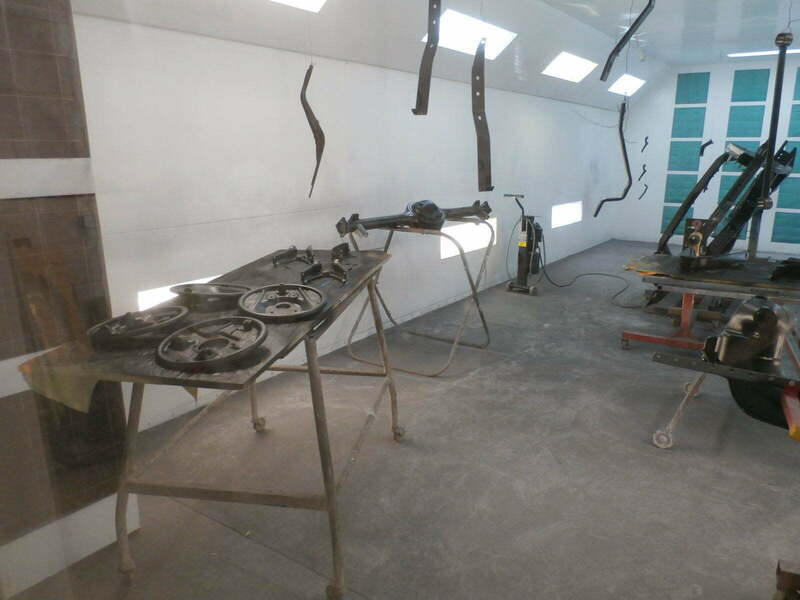 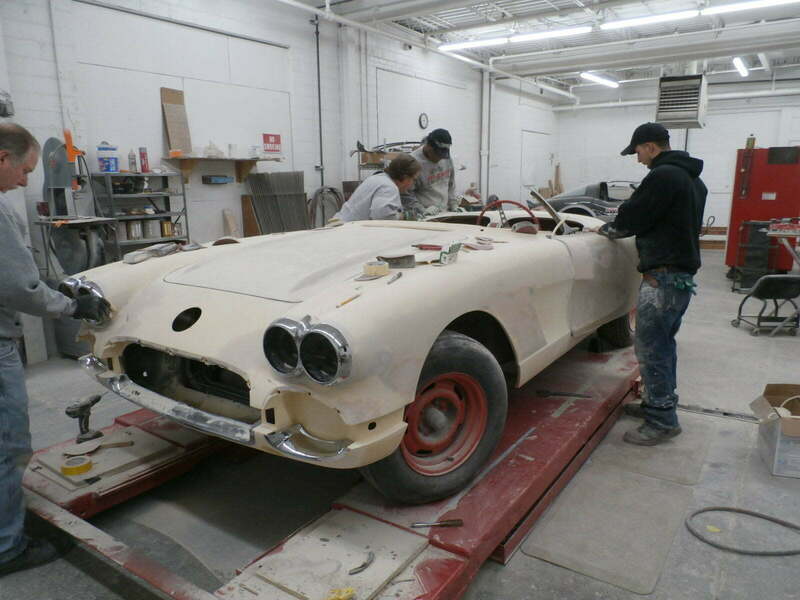 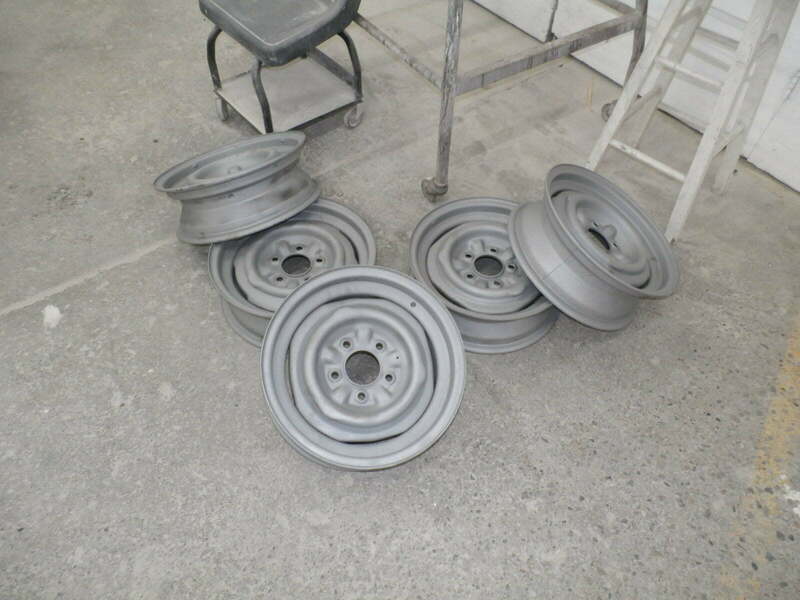 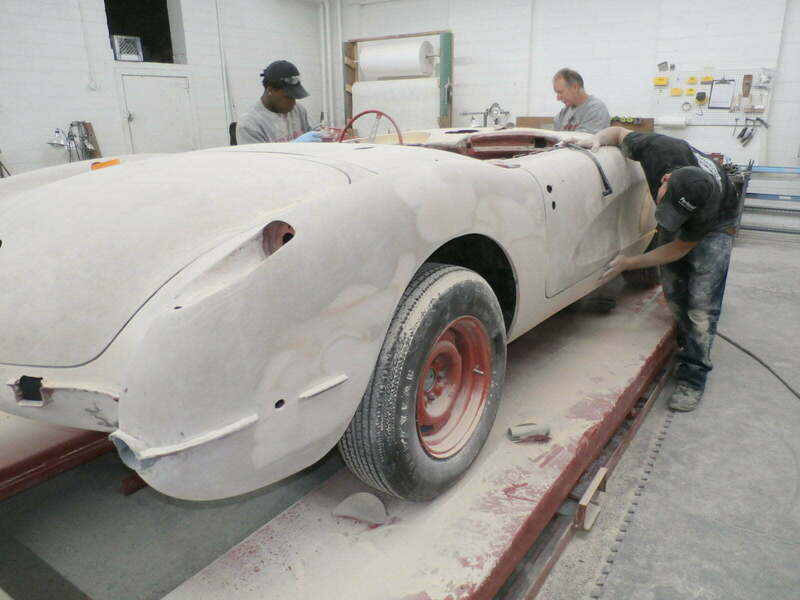 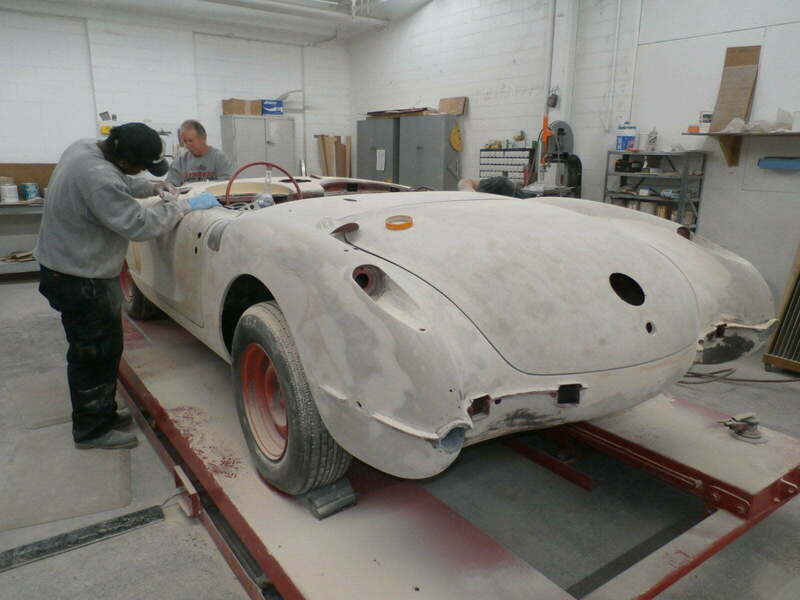 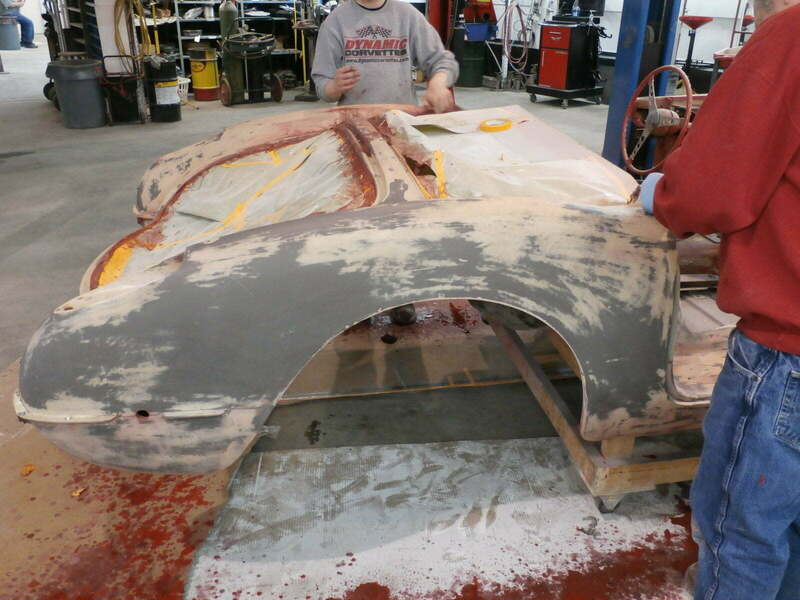 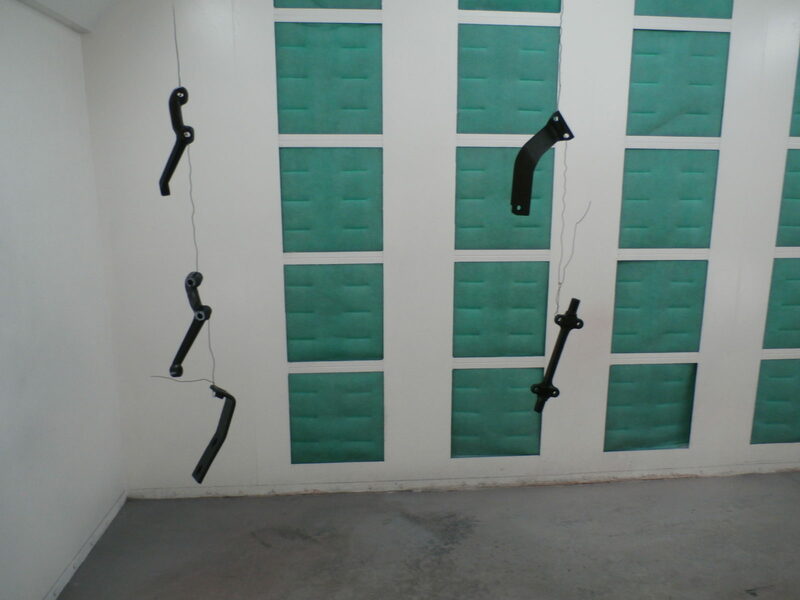 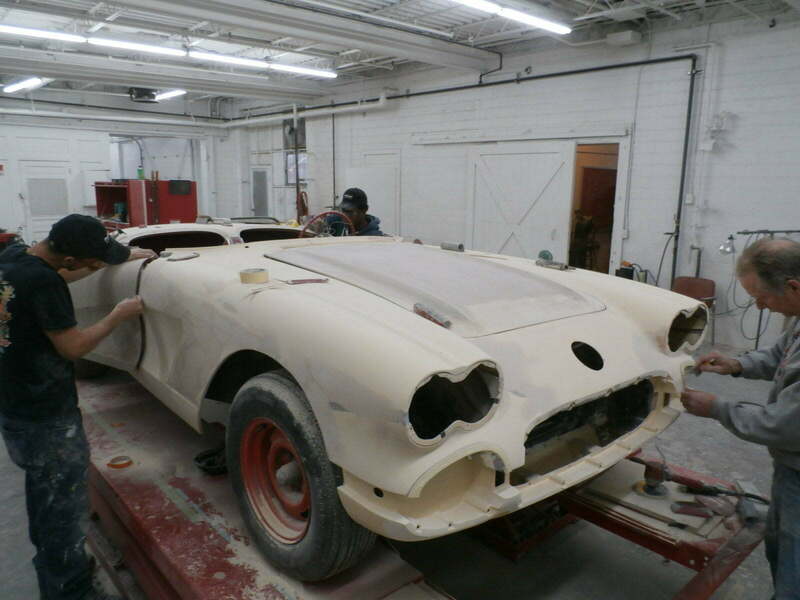 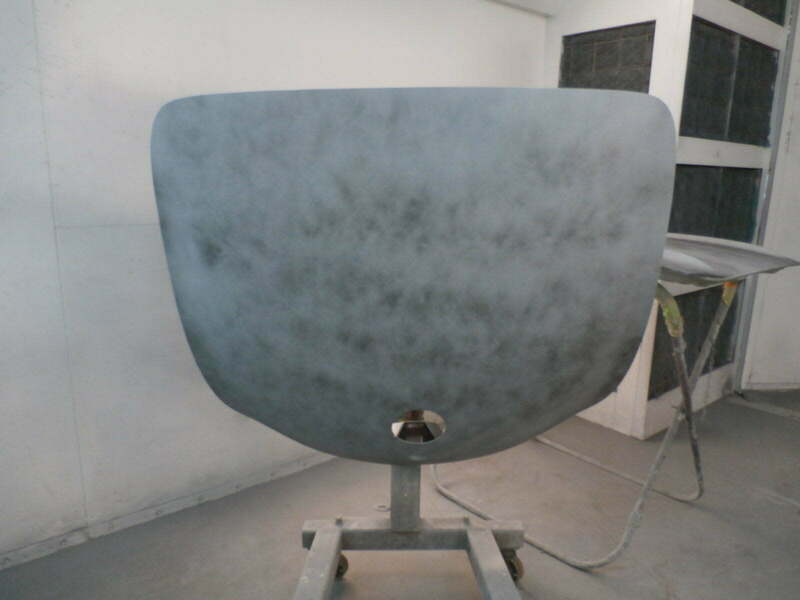 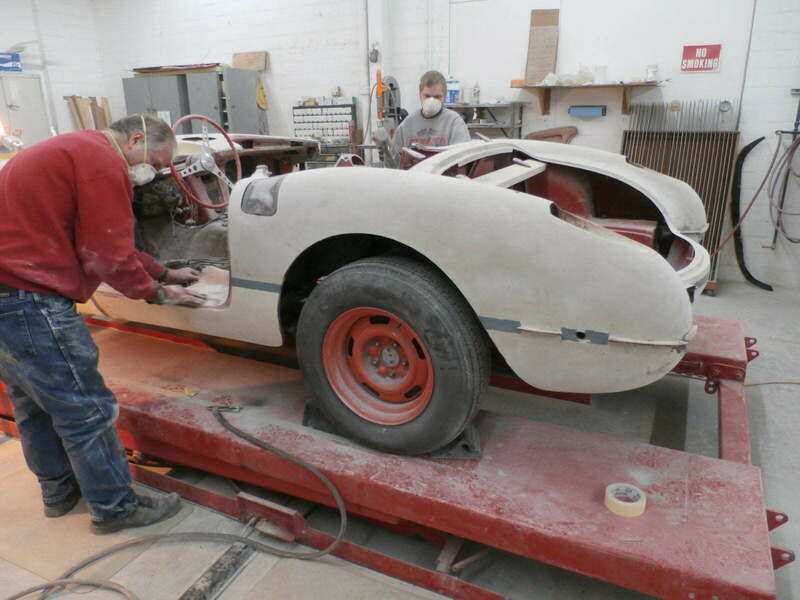 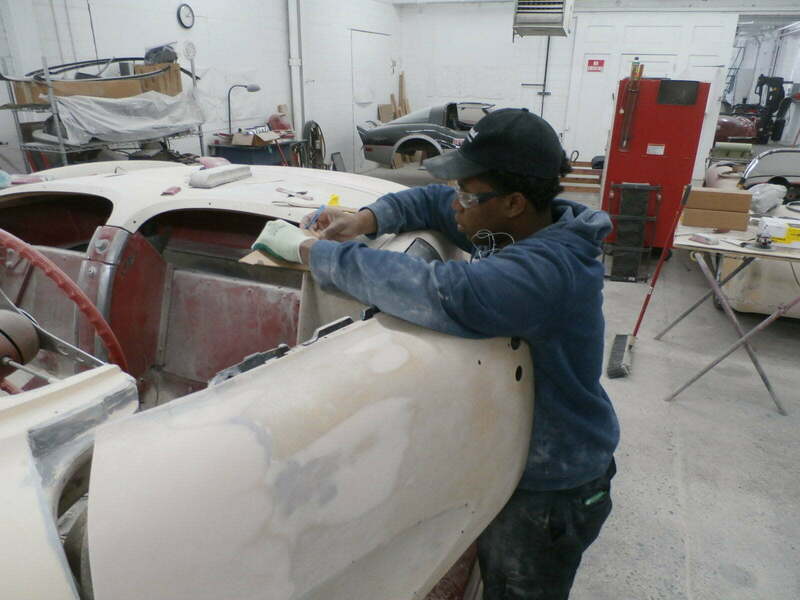 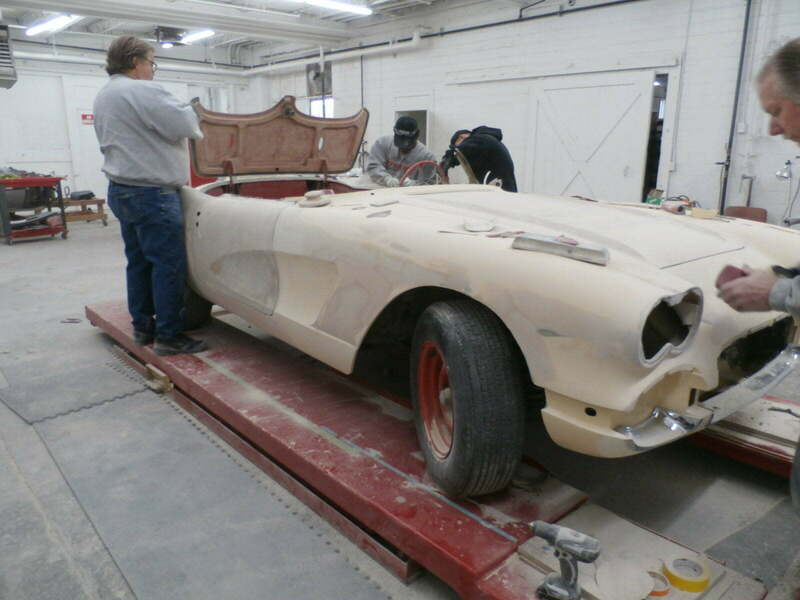 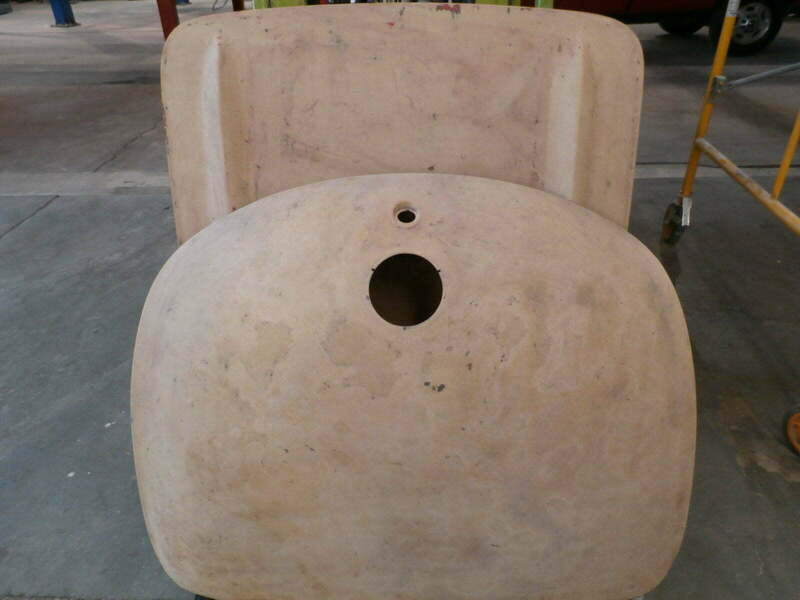 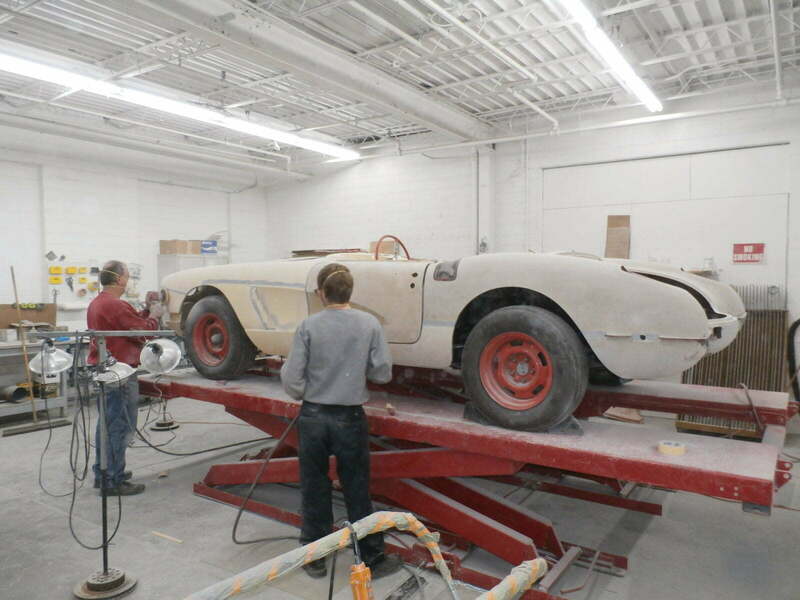 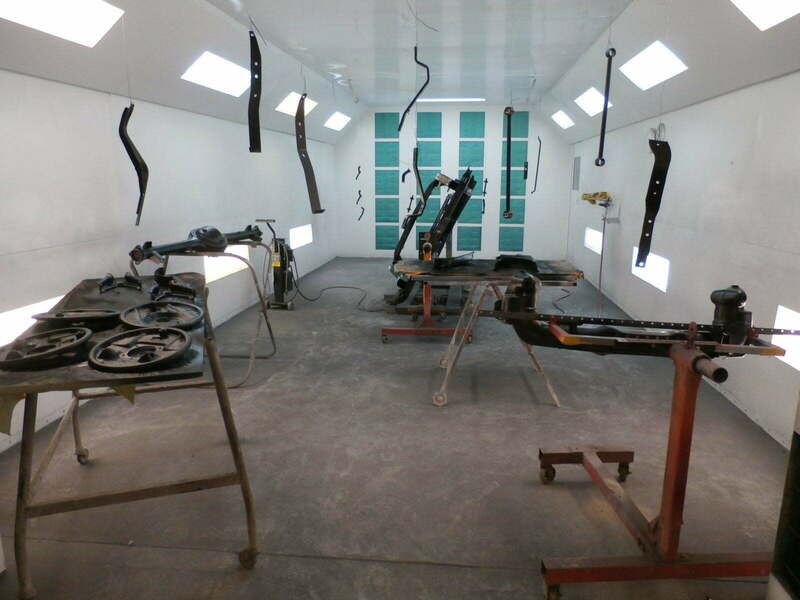 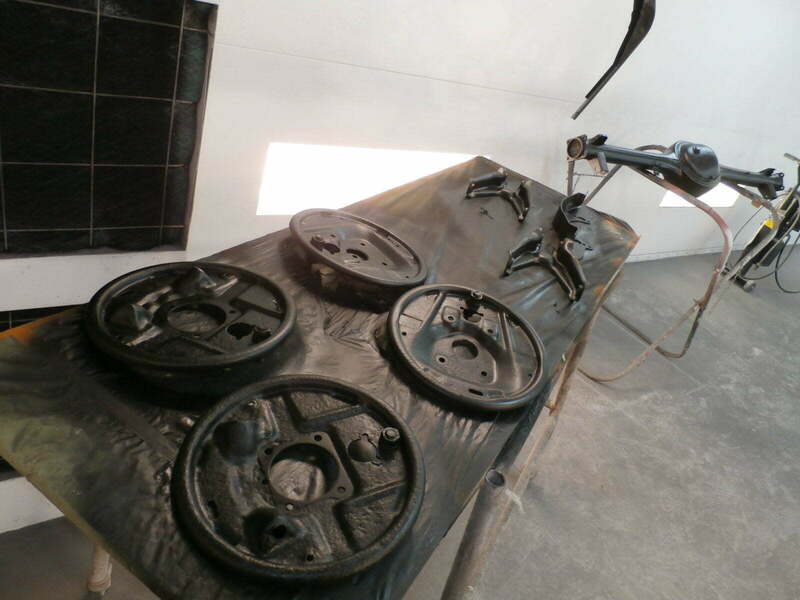 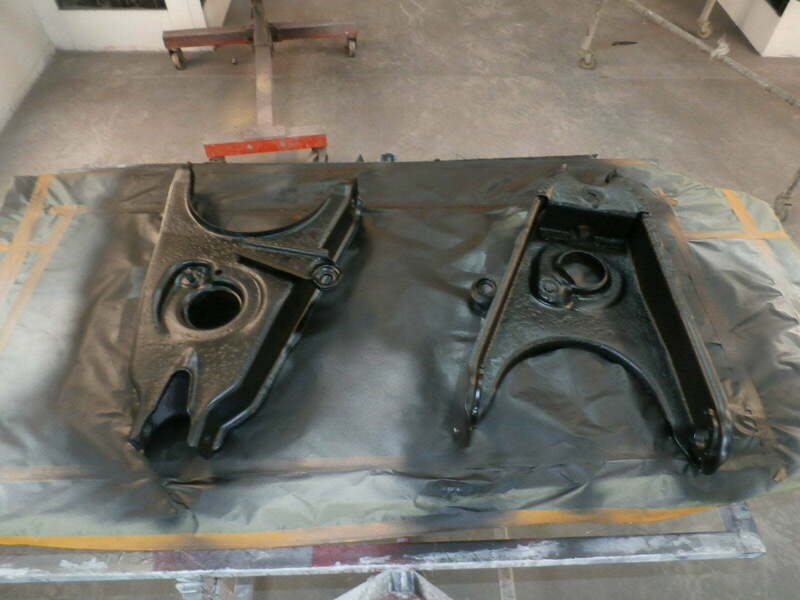 Following the first coat of primer, they began to block sand the entire body and prep for the second coat of primer. 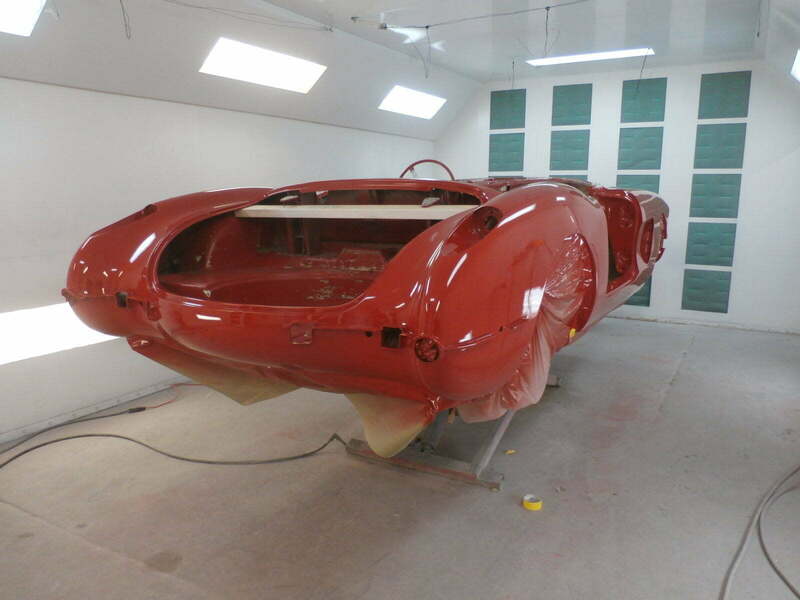 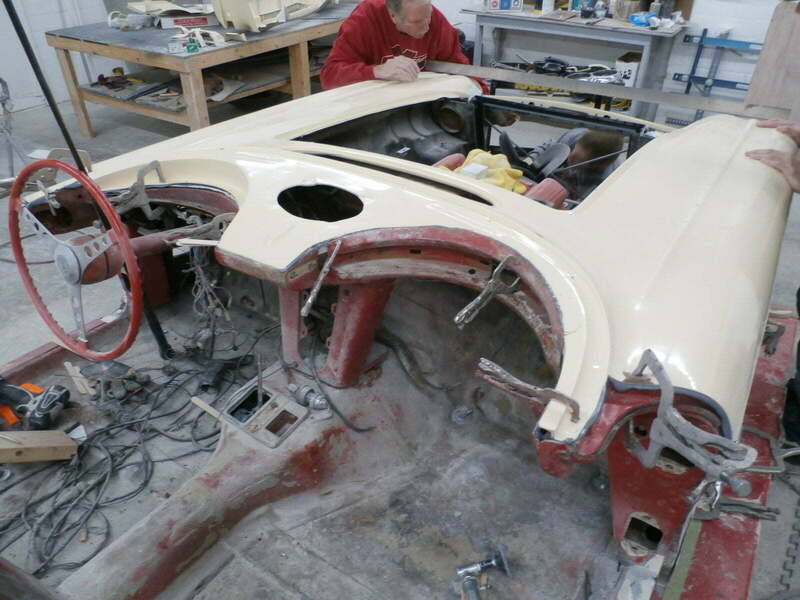 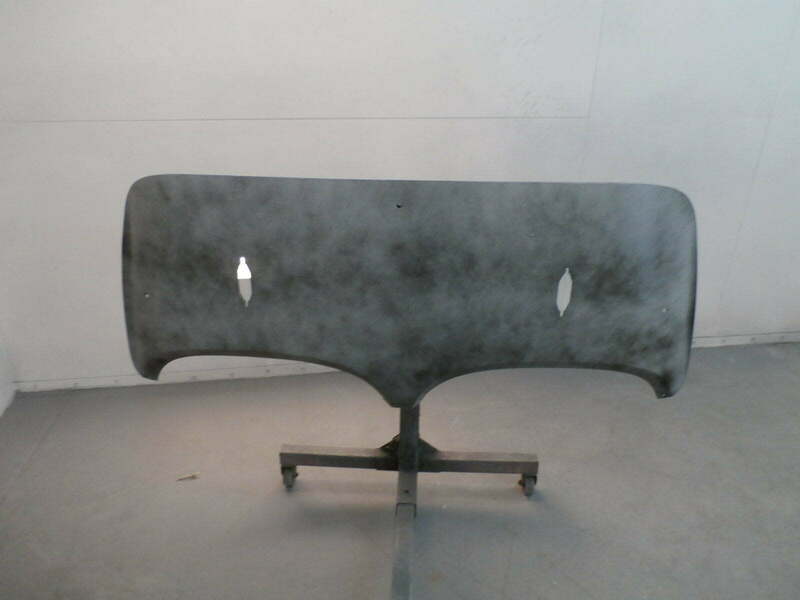 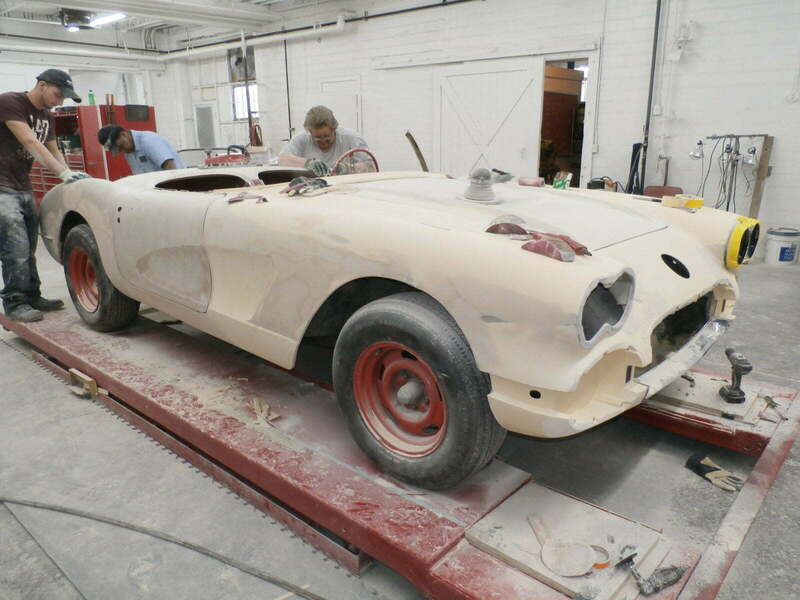 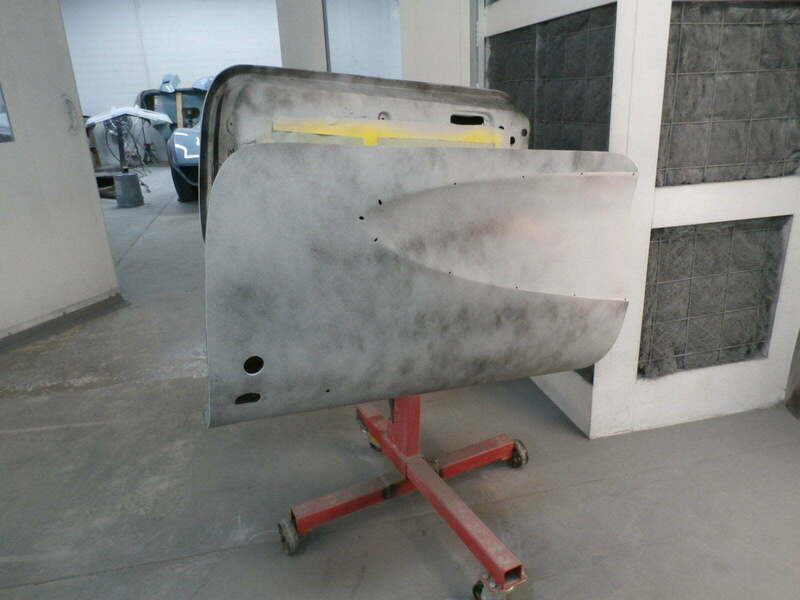 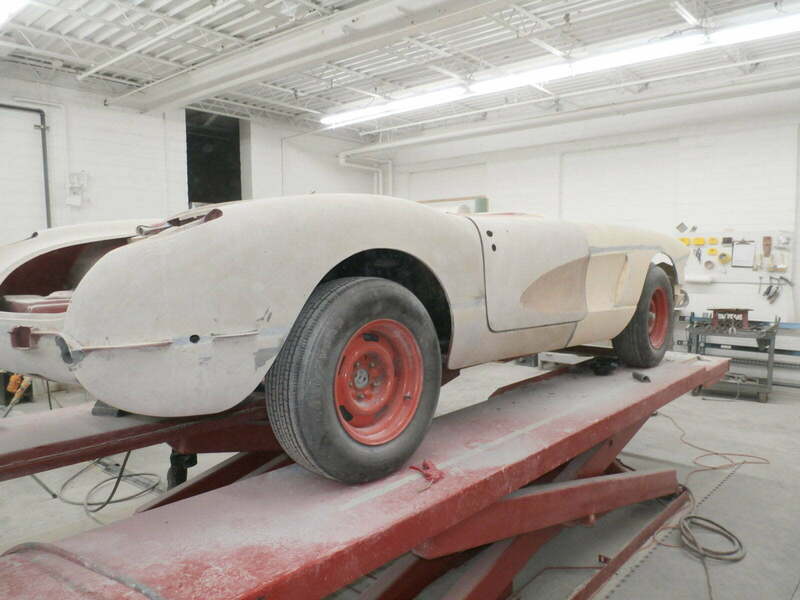 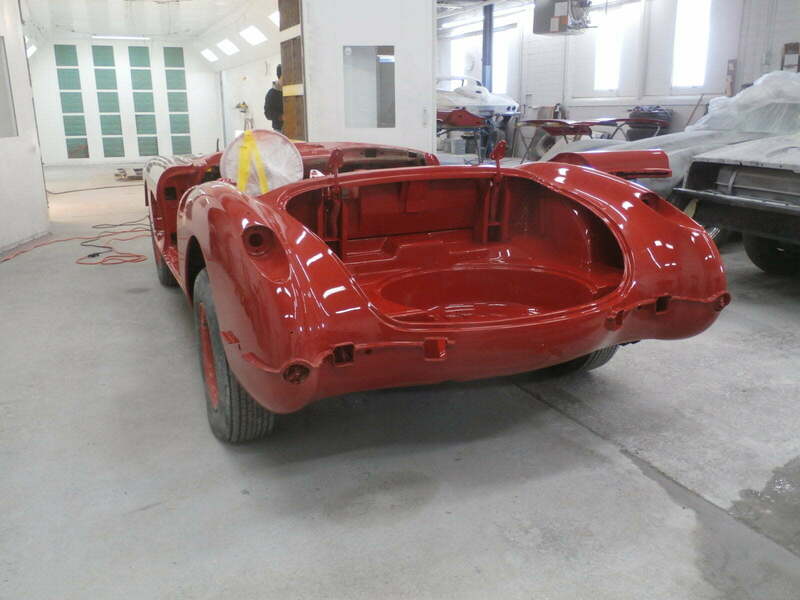 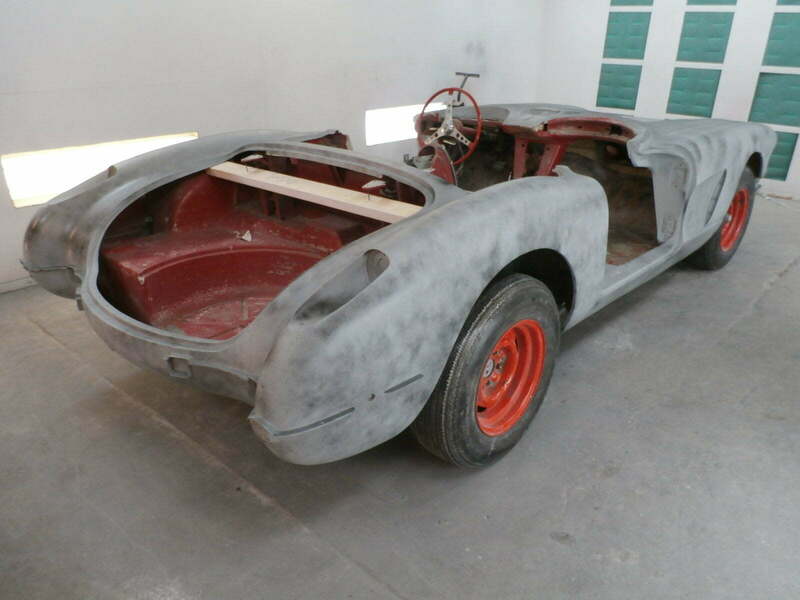 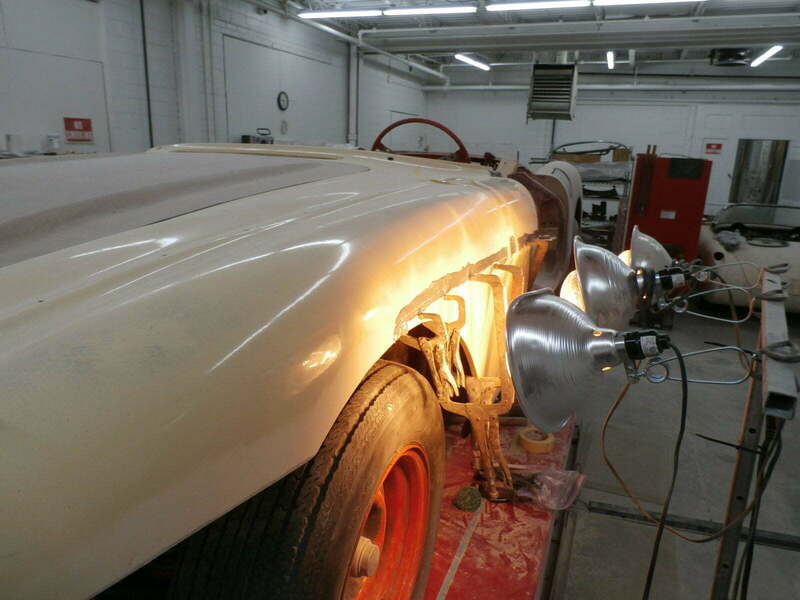 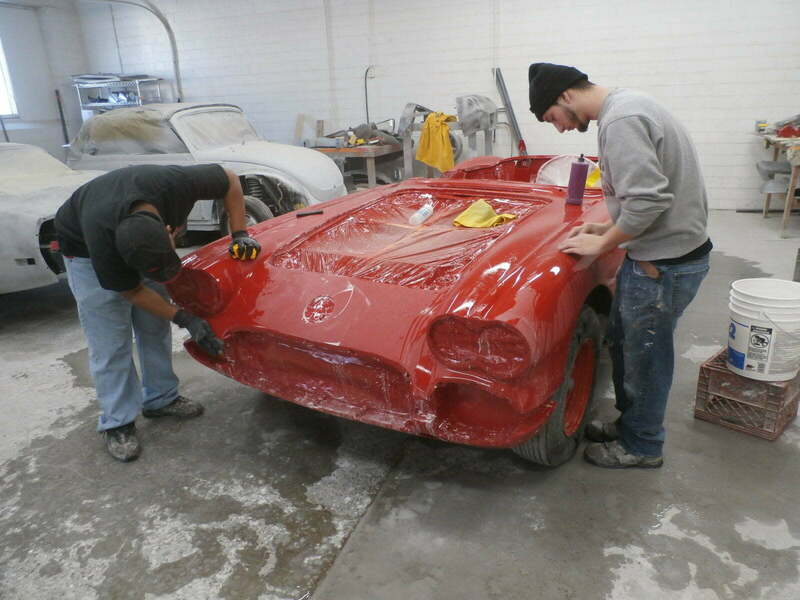 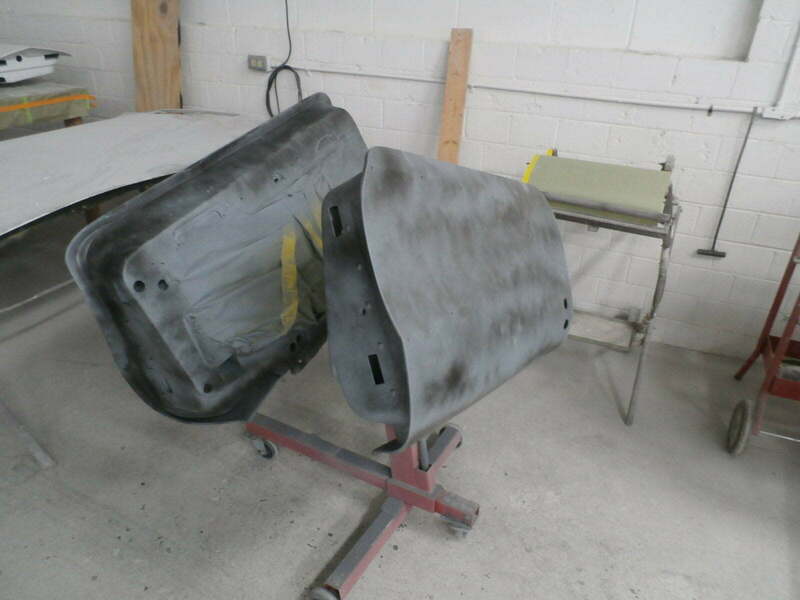 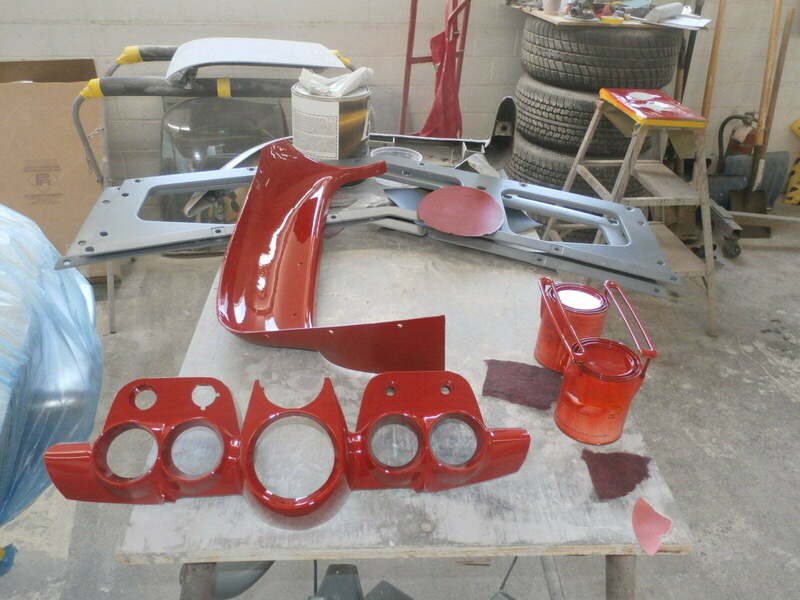 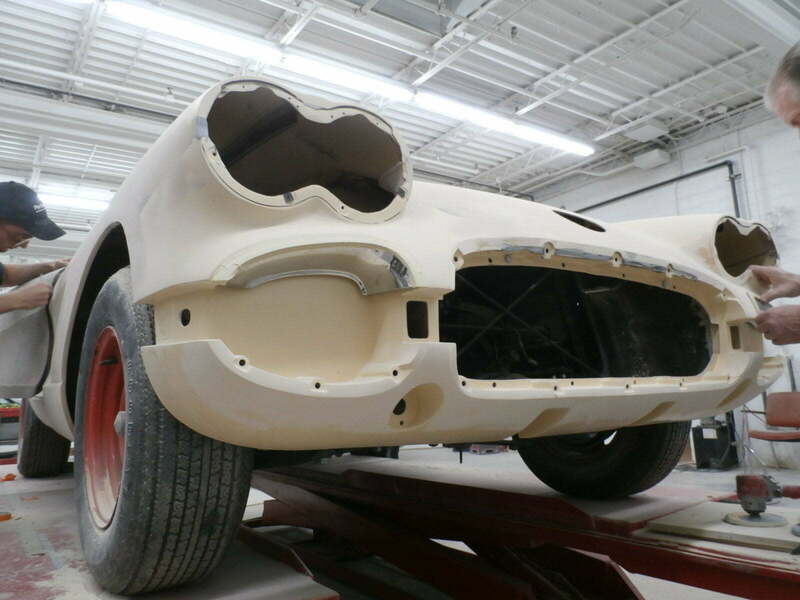 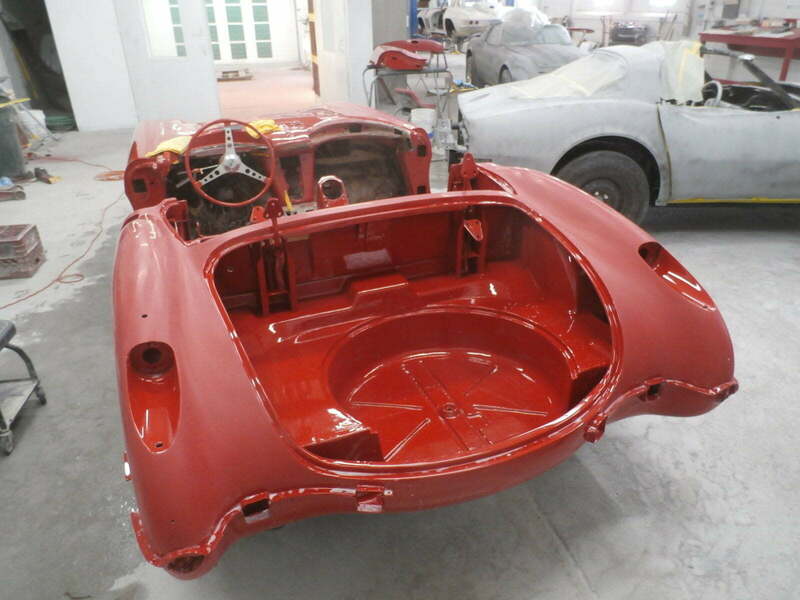 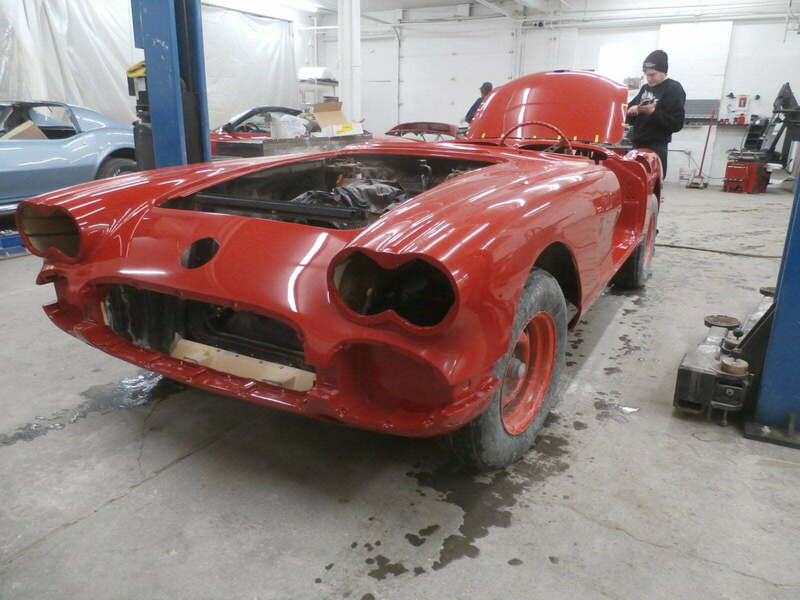 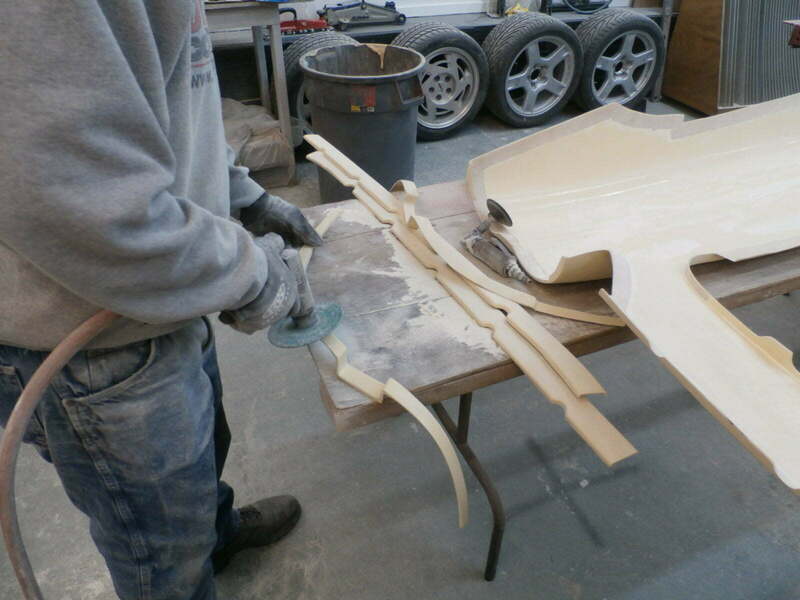 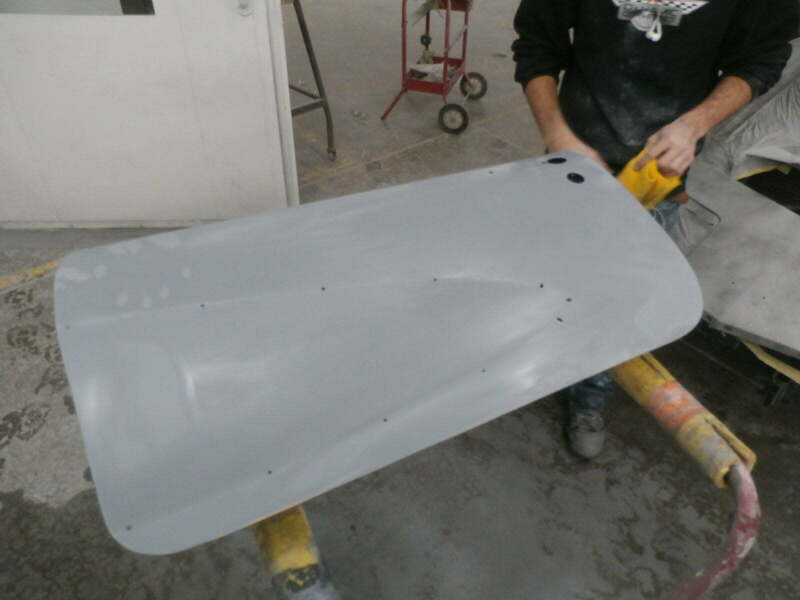 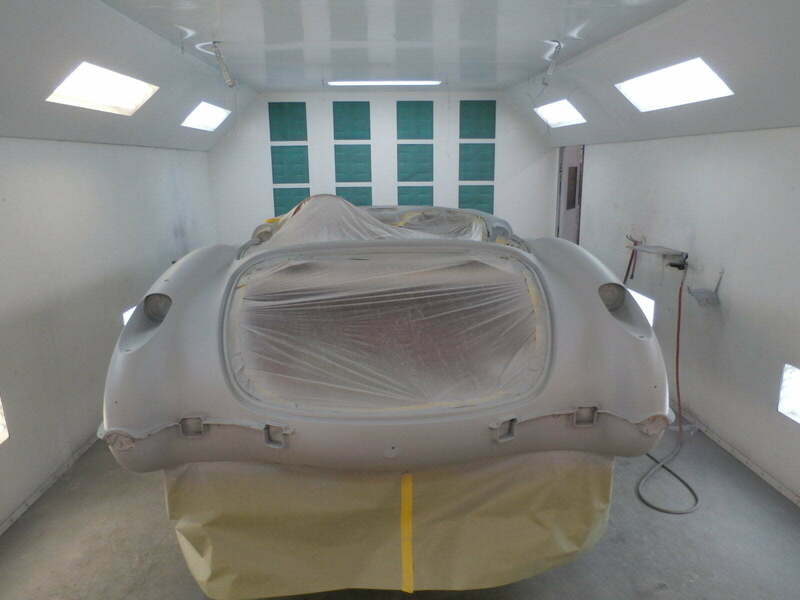 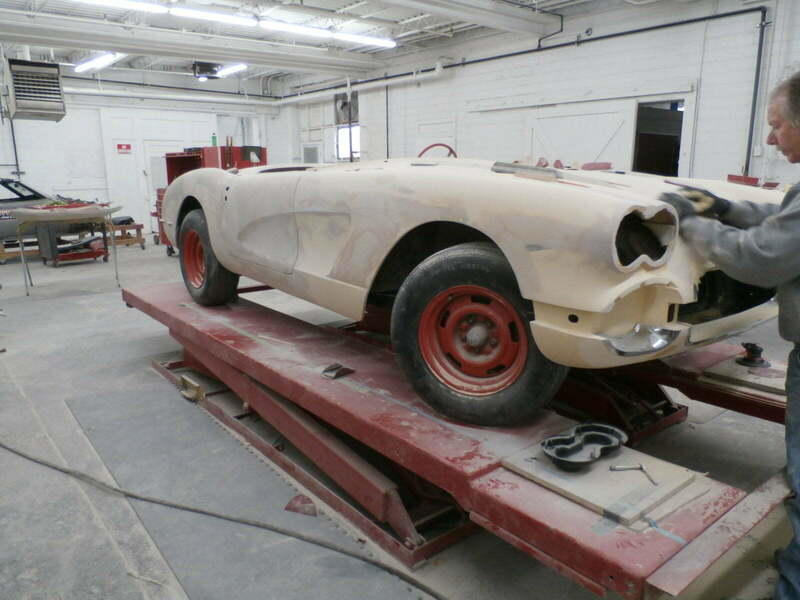 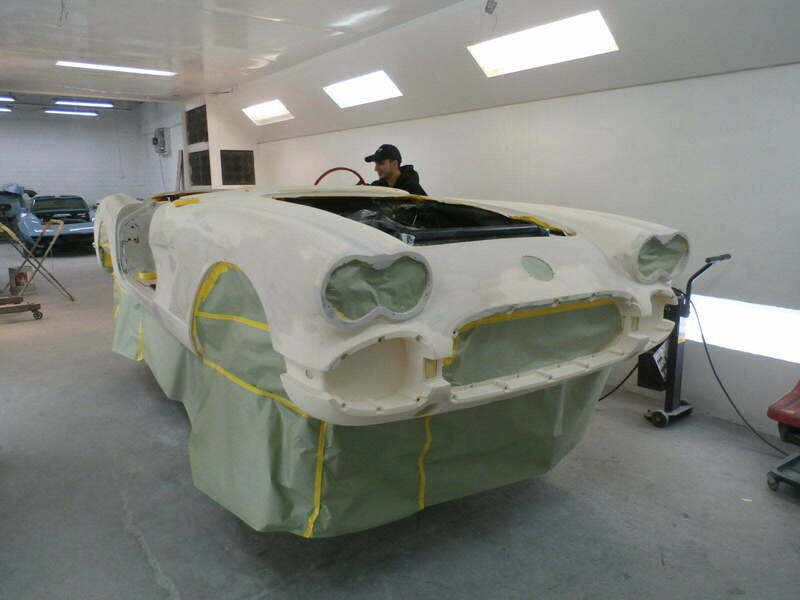 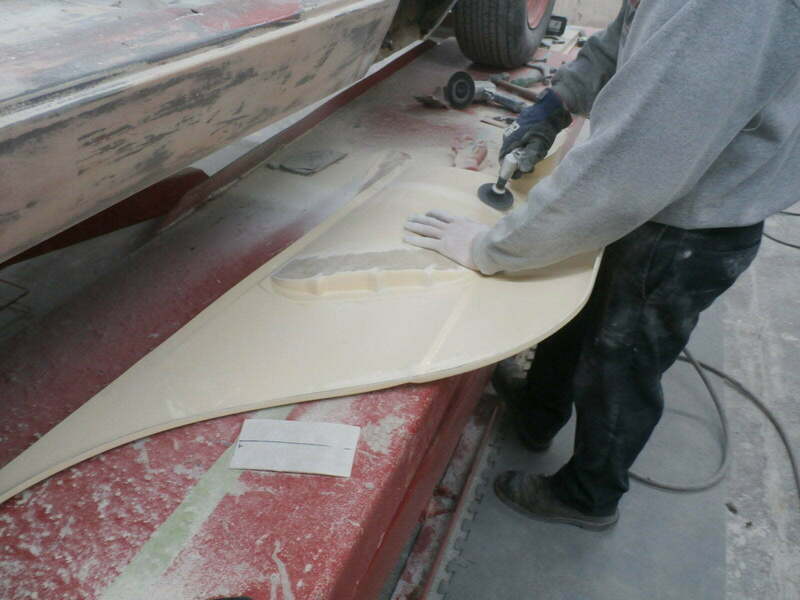 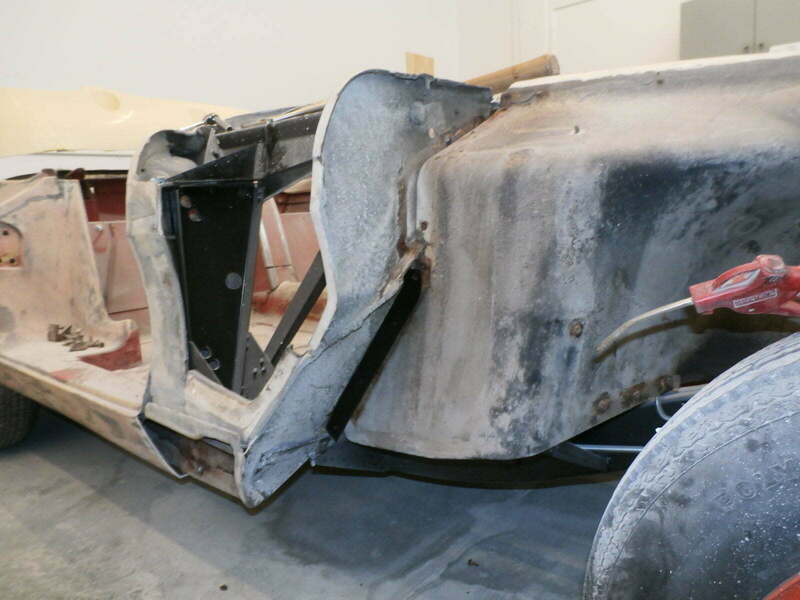 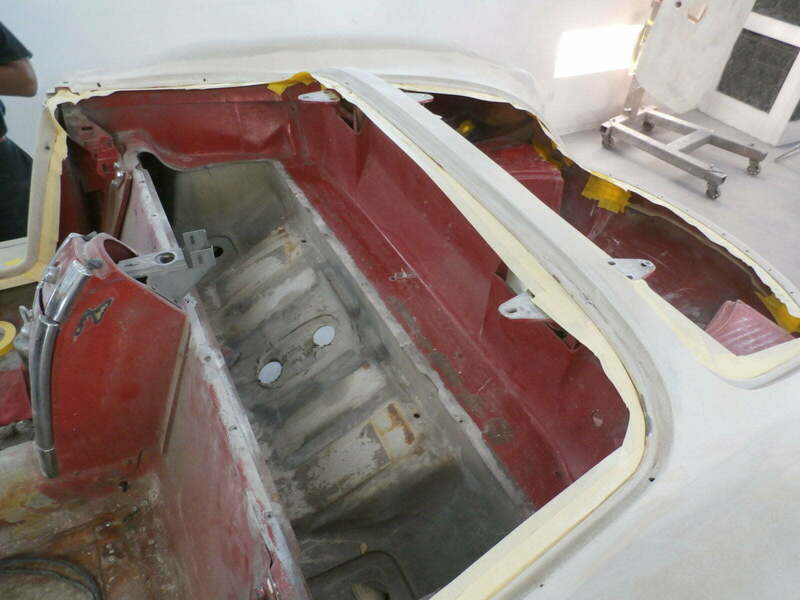 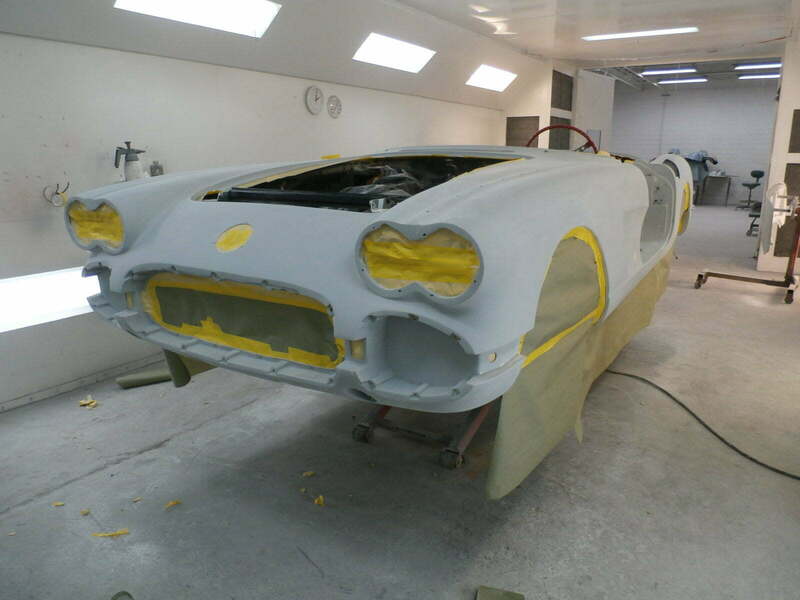 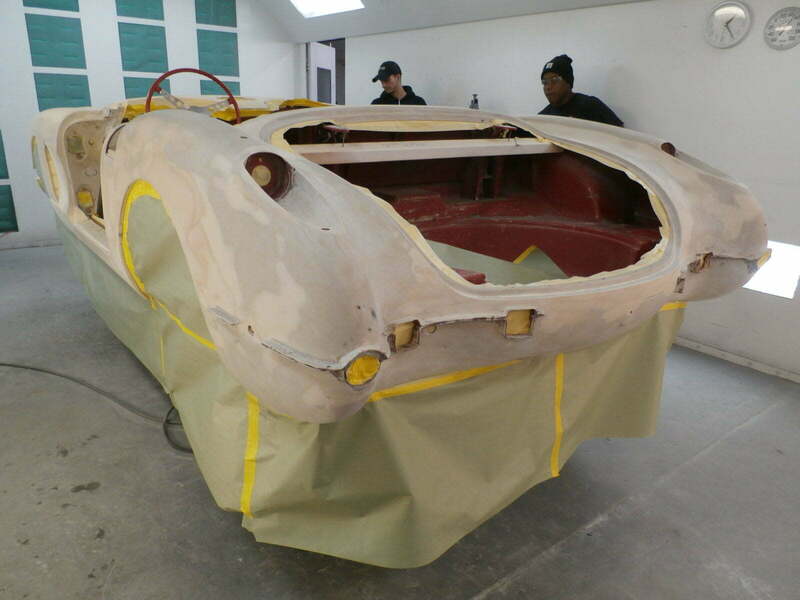 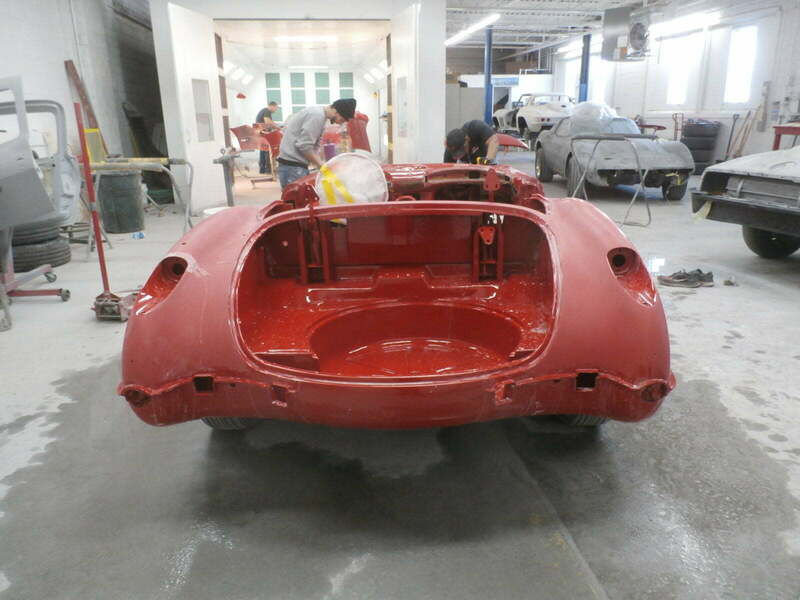 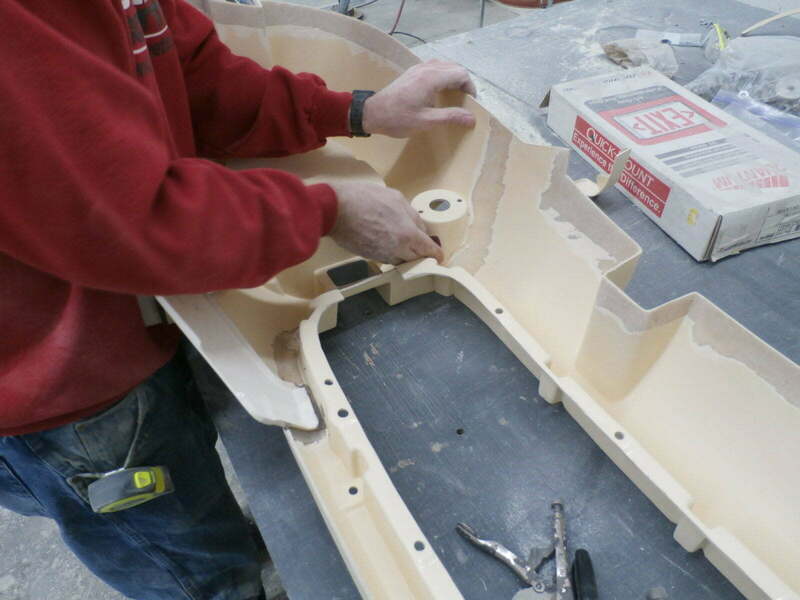 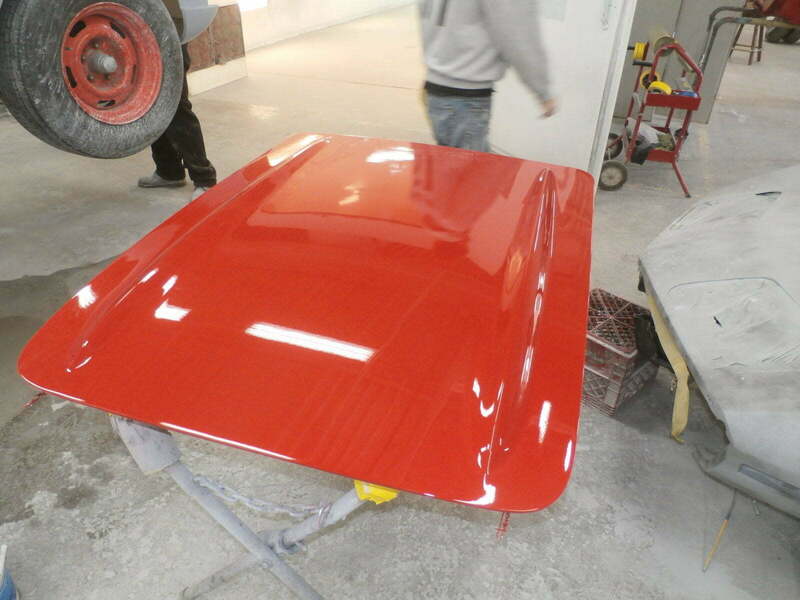 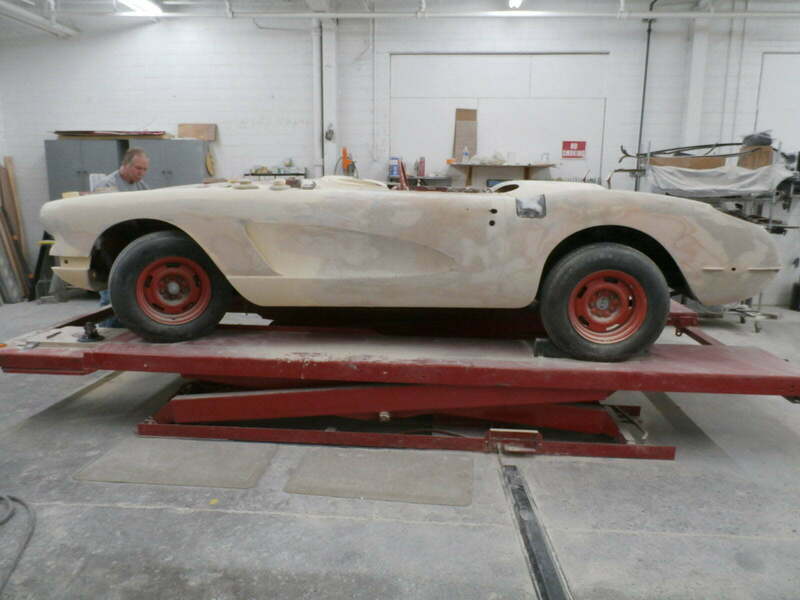 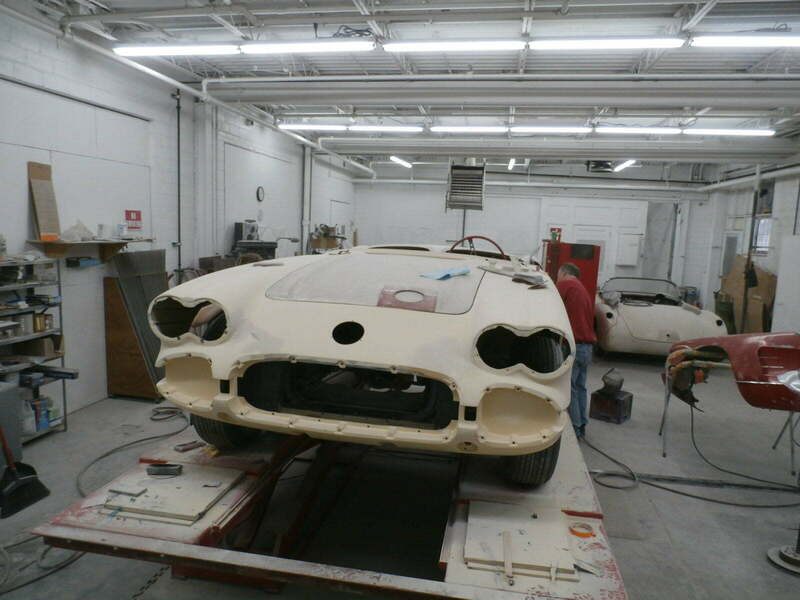 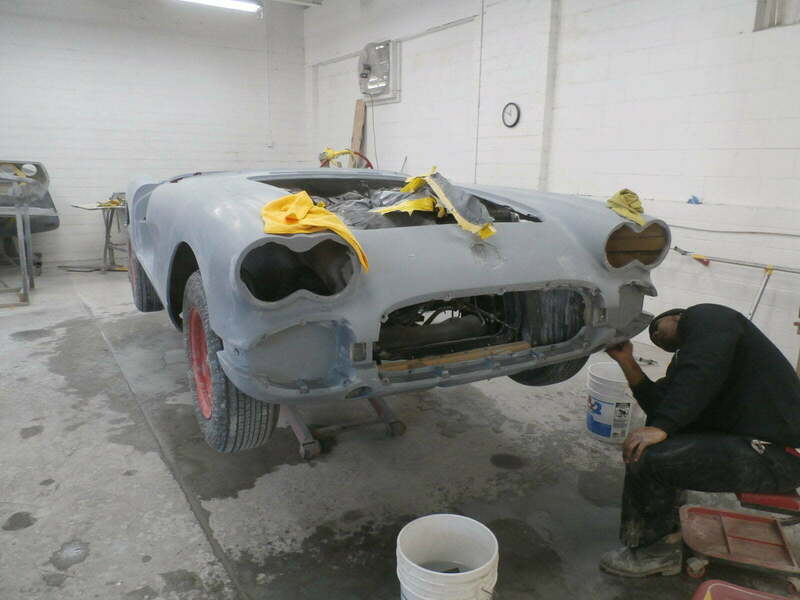 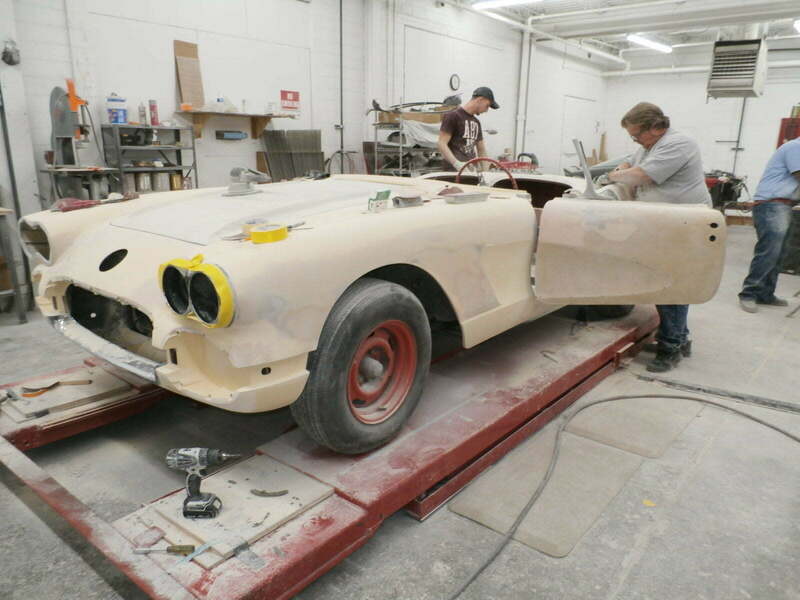 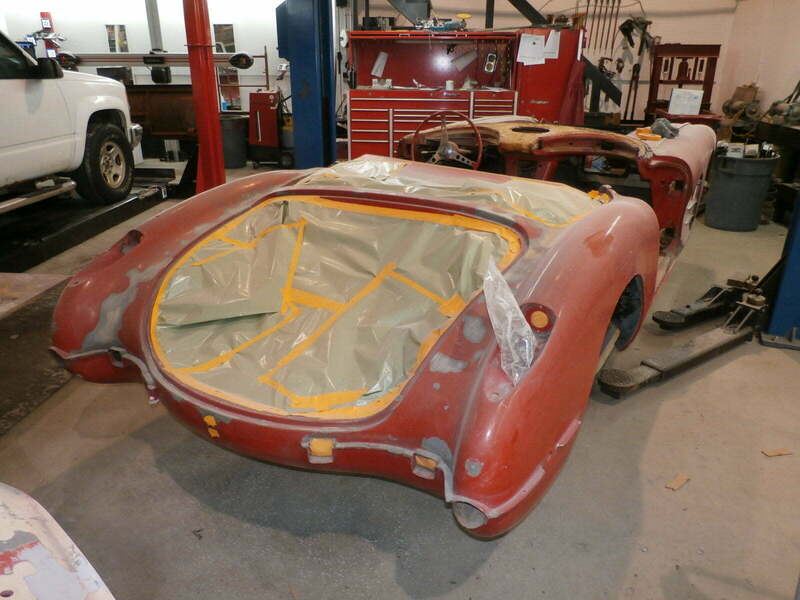 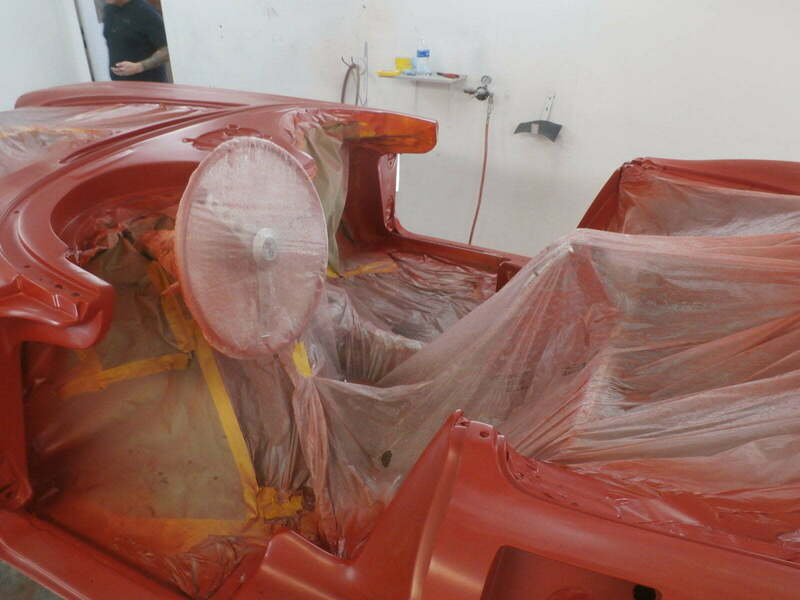 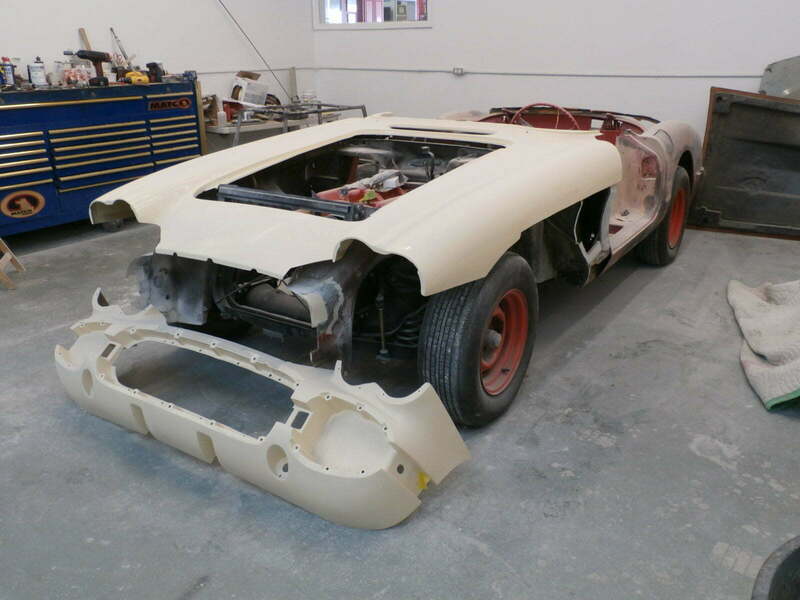 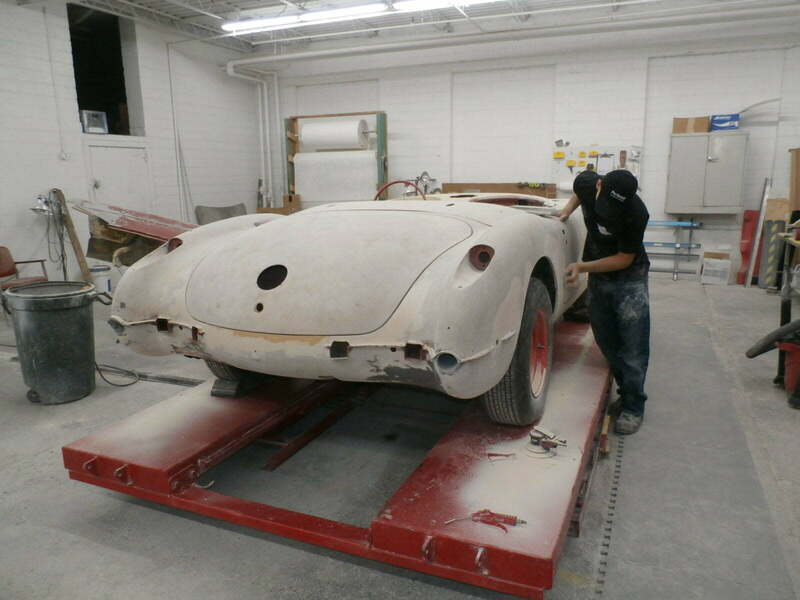 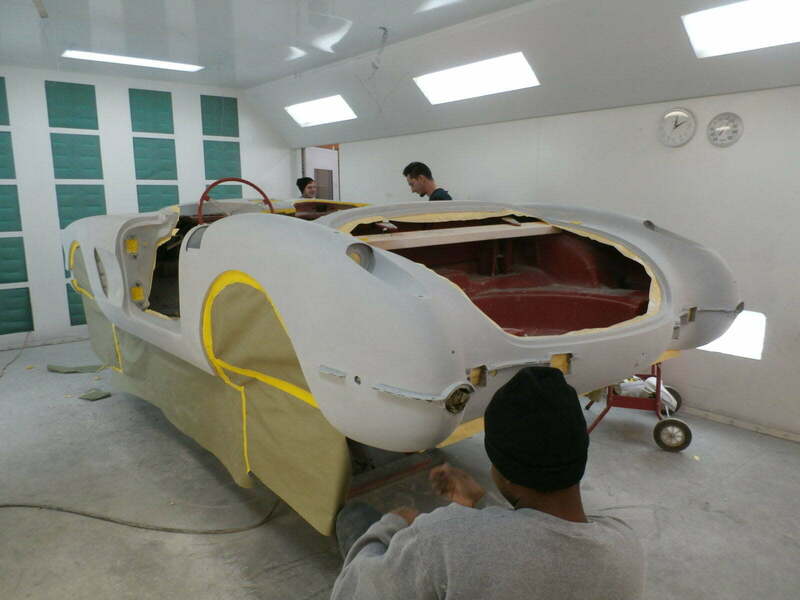 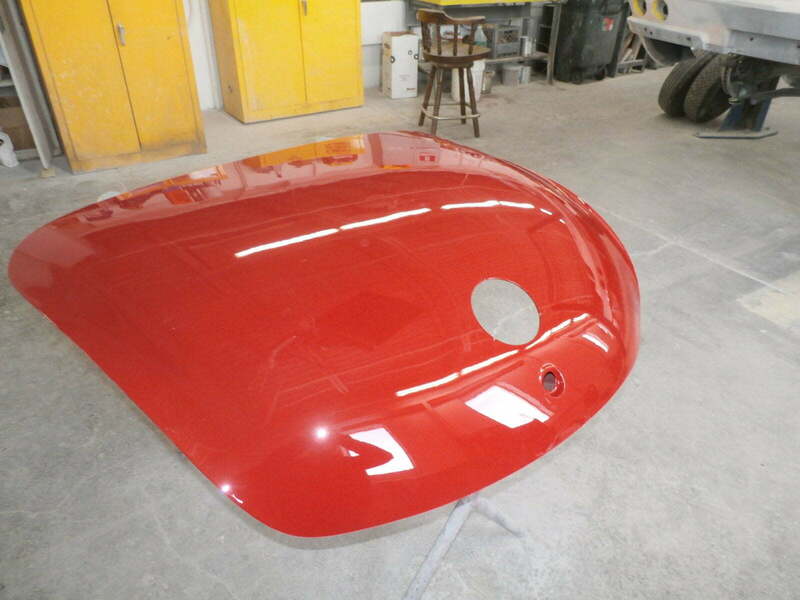 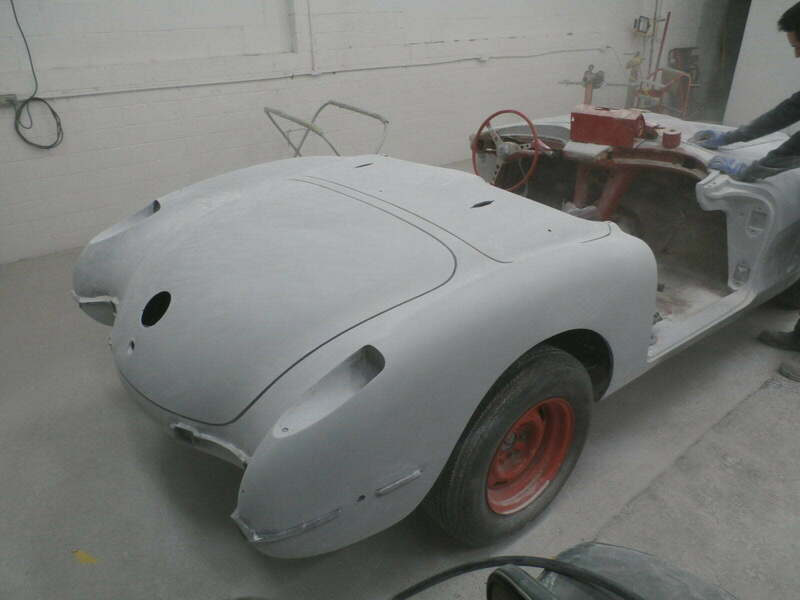 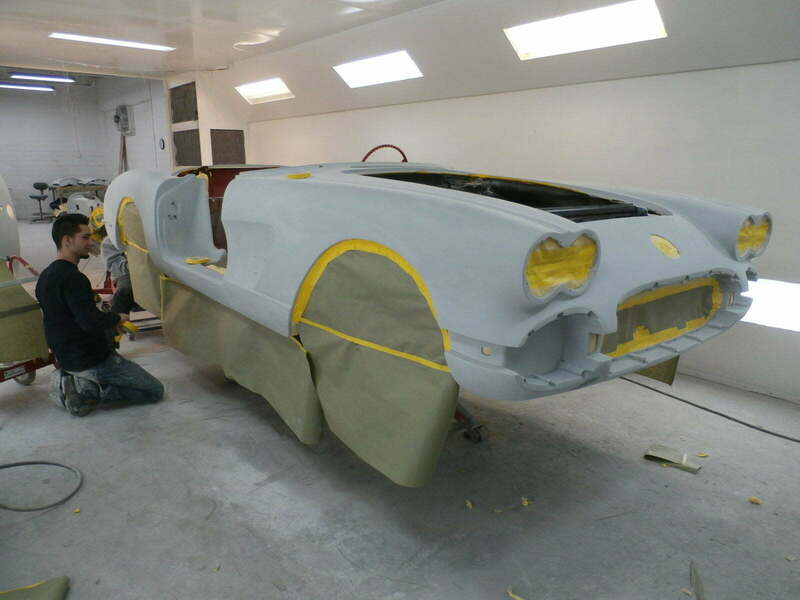 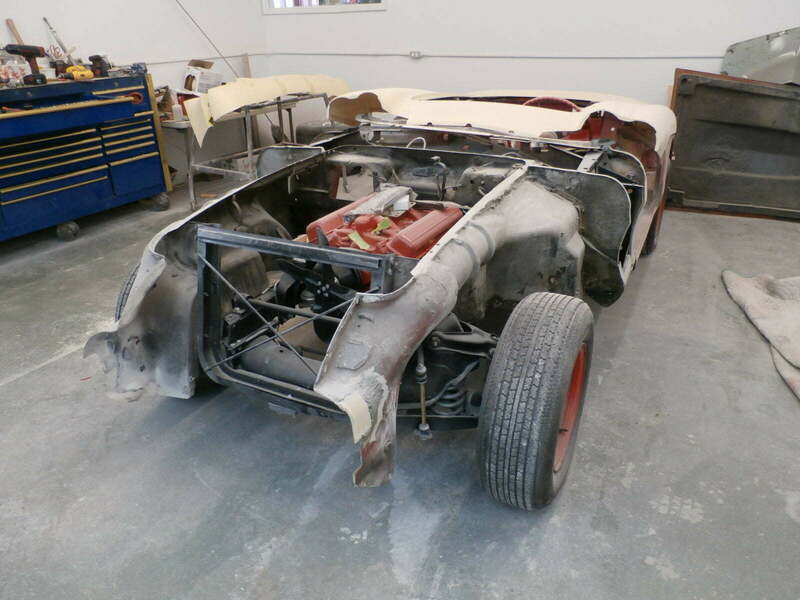 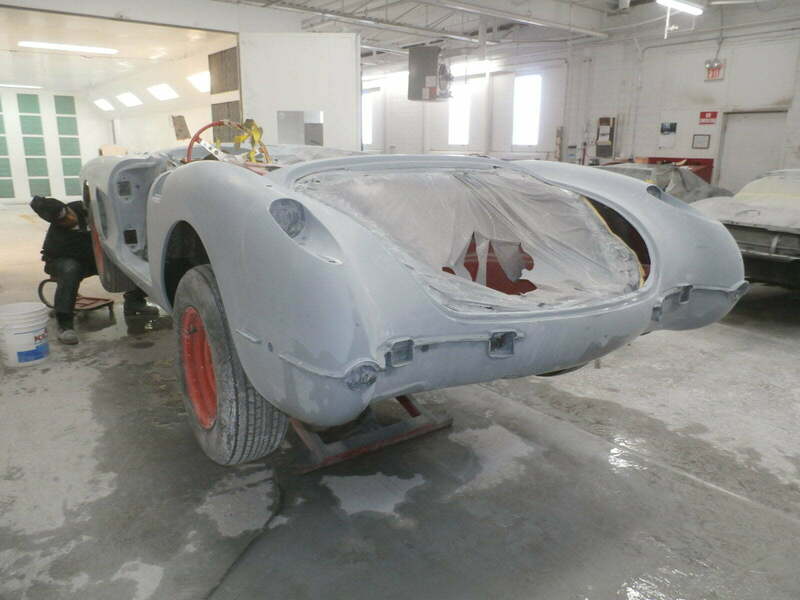 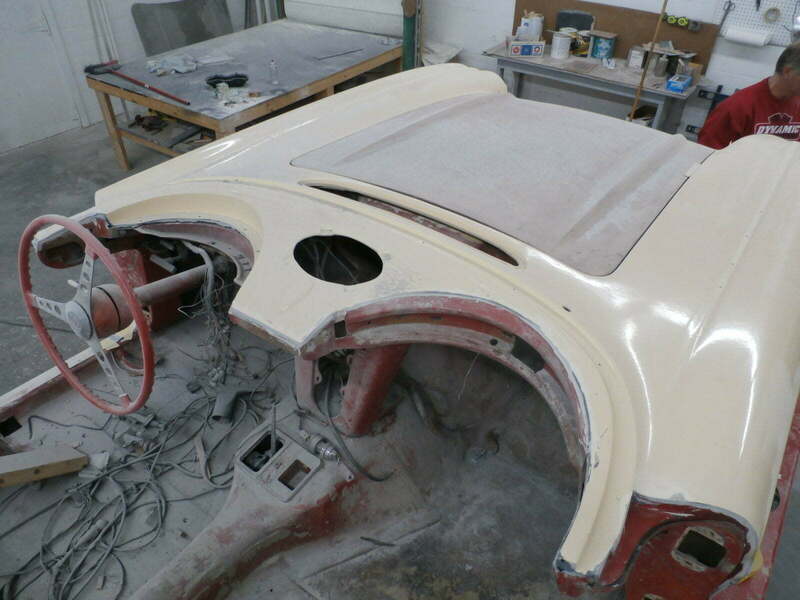 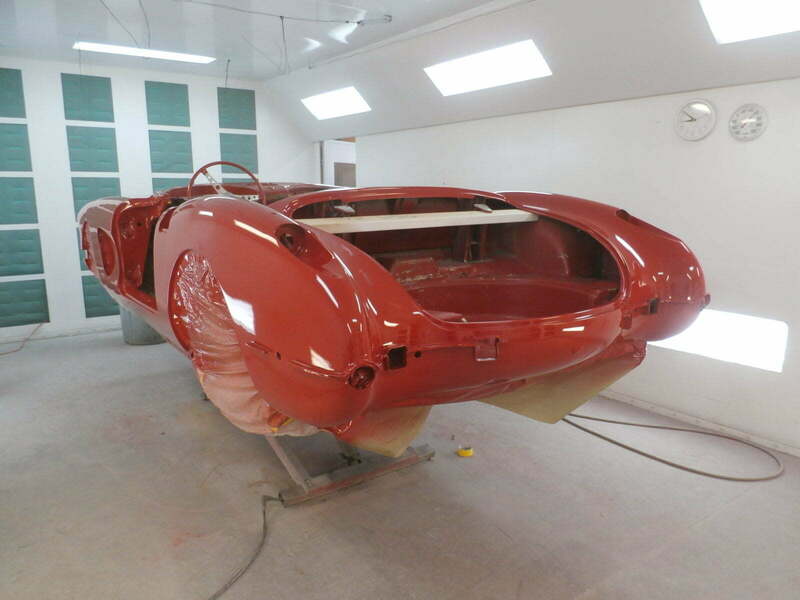 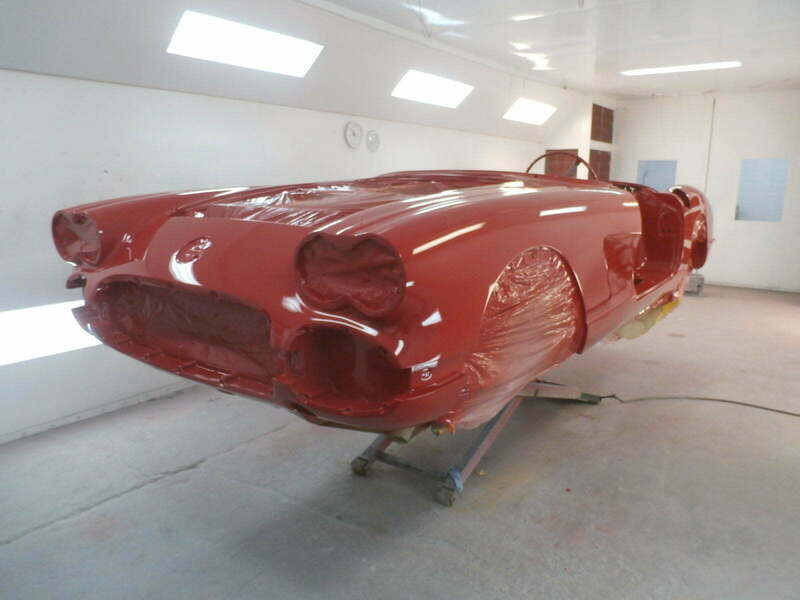 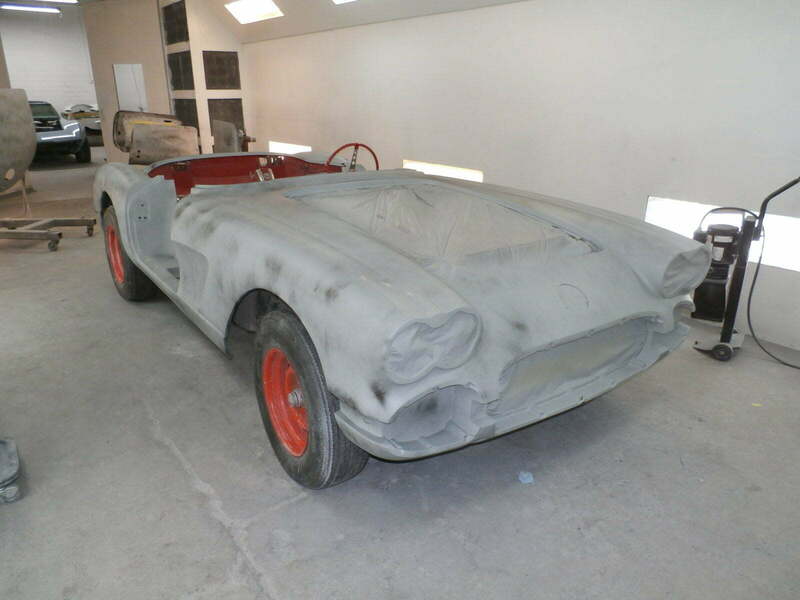 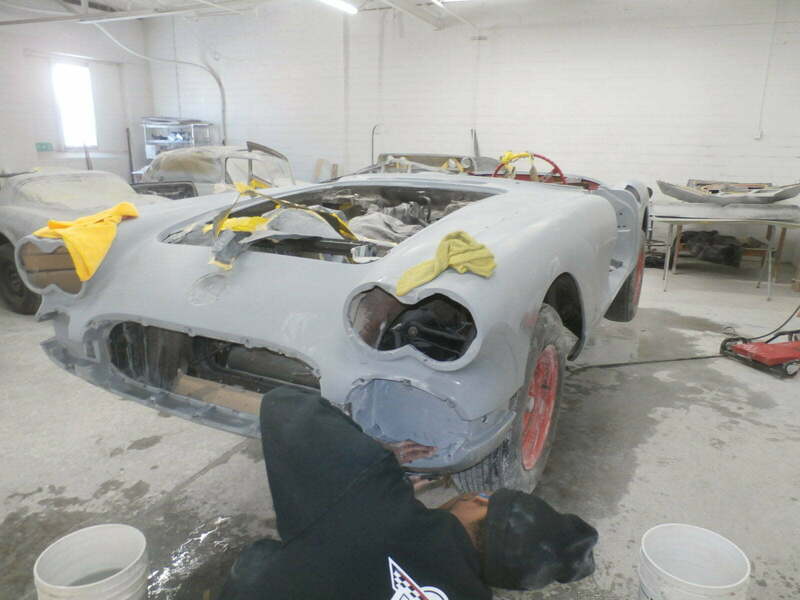 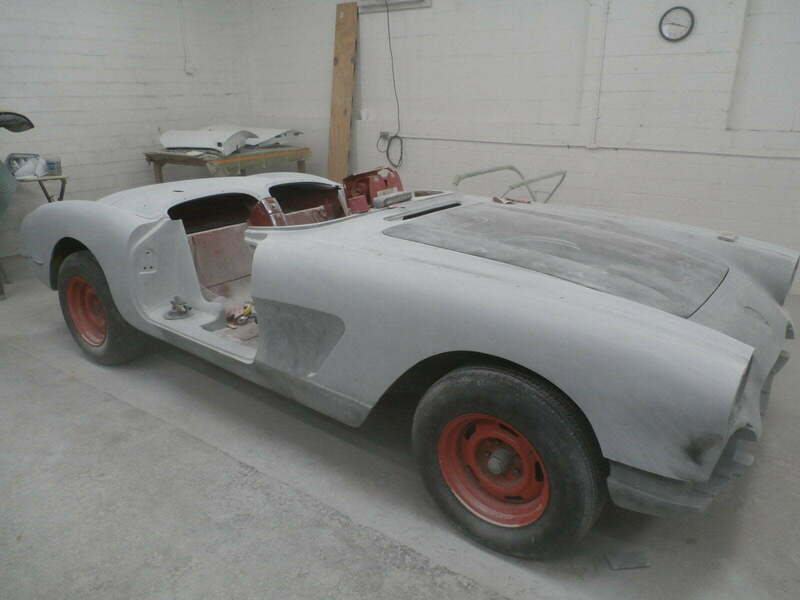 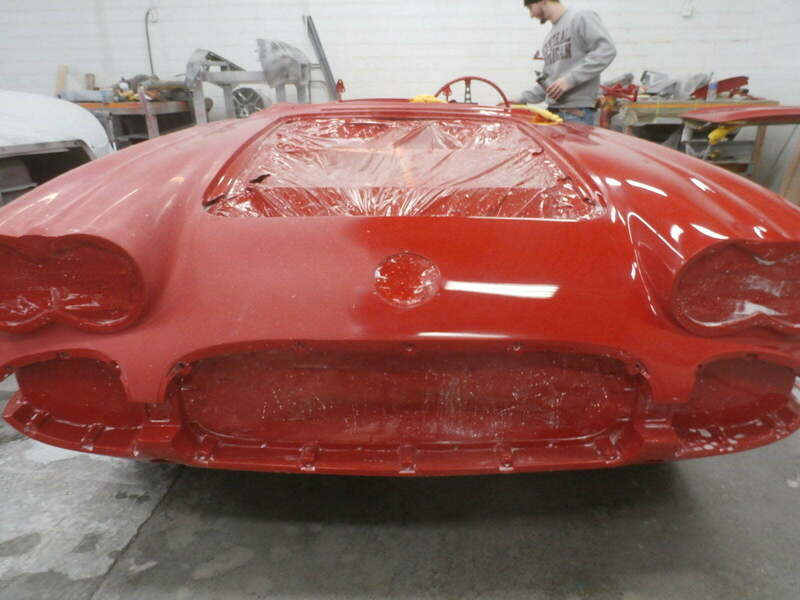 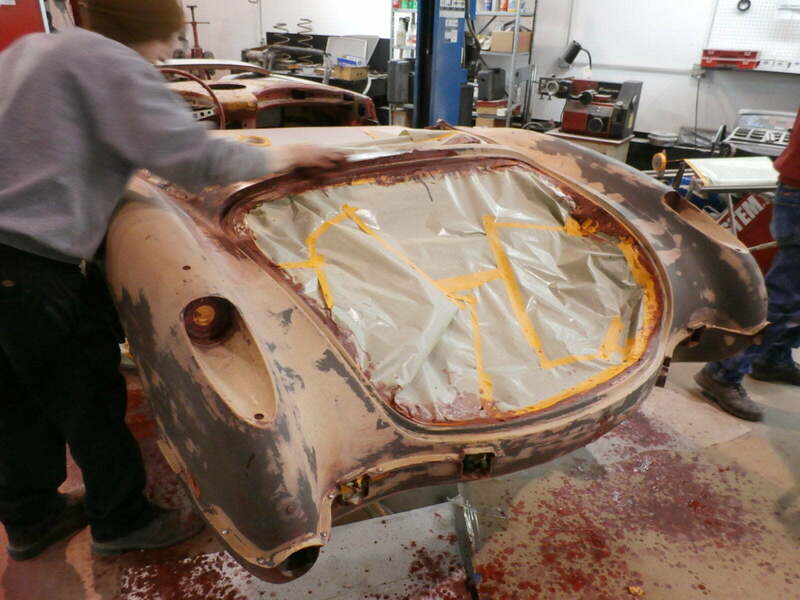 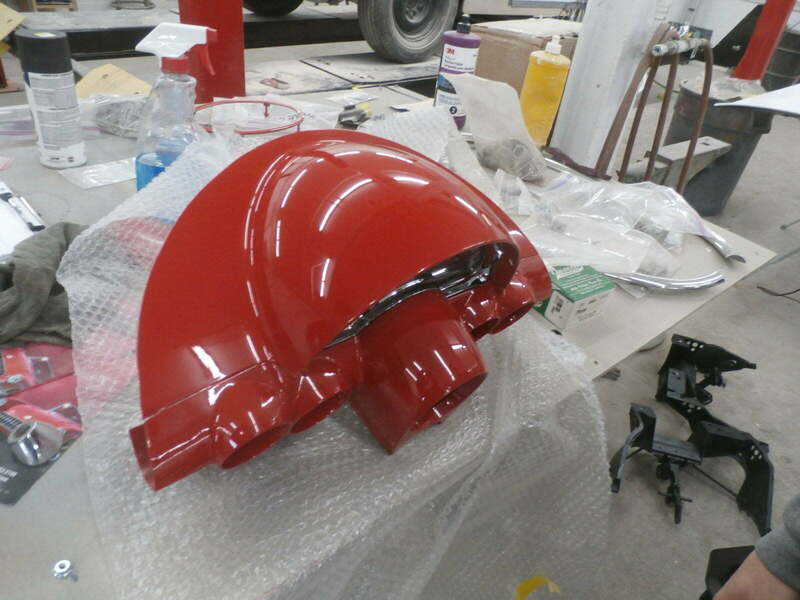 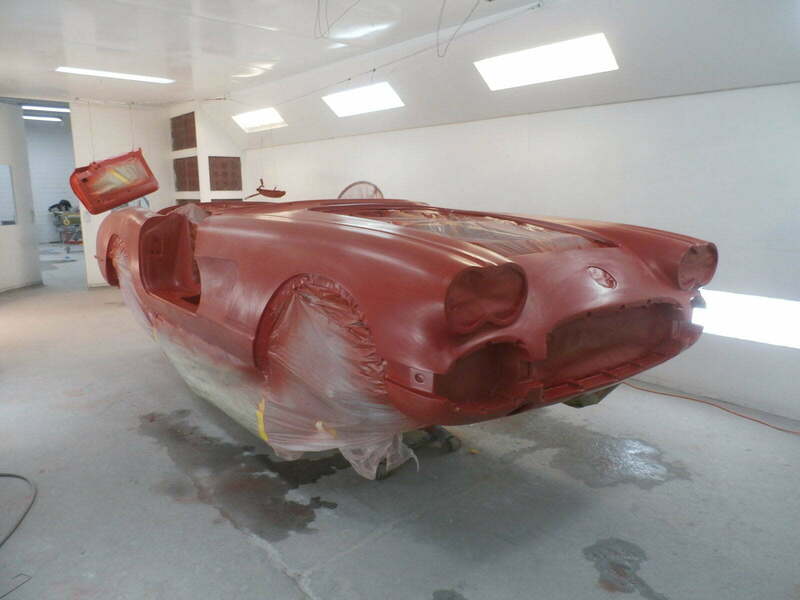 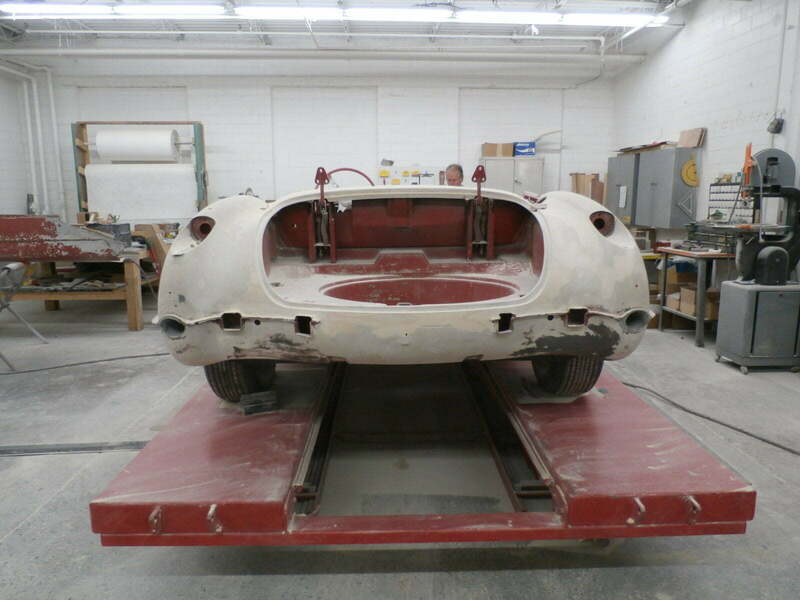 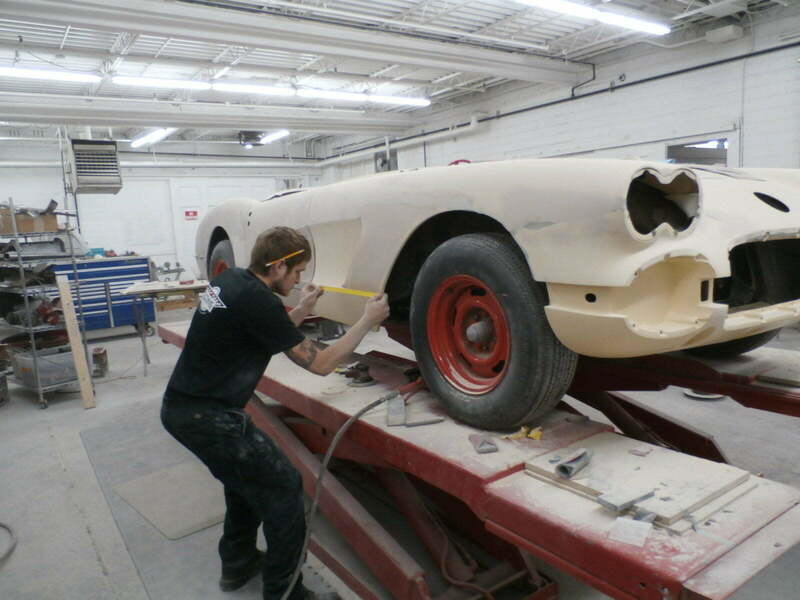 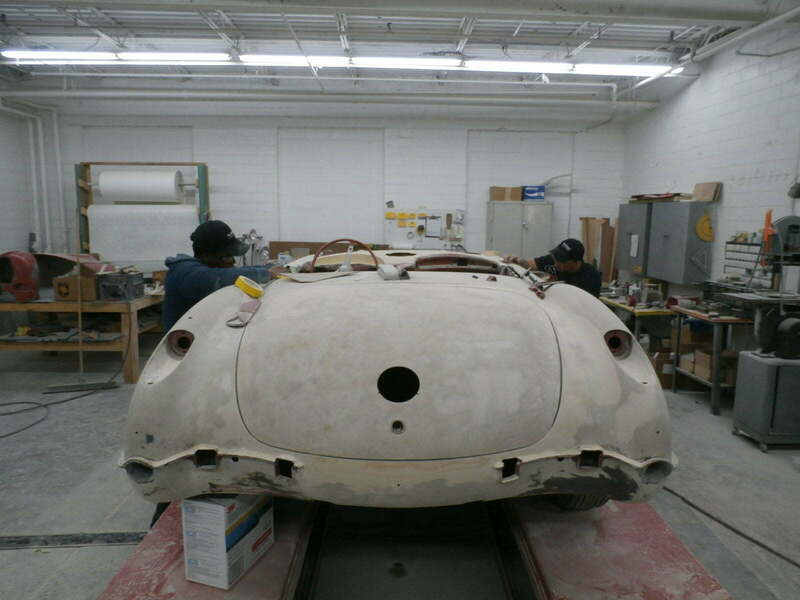 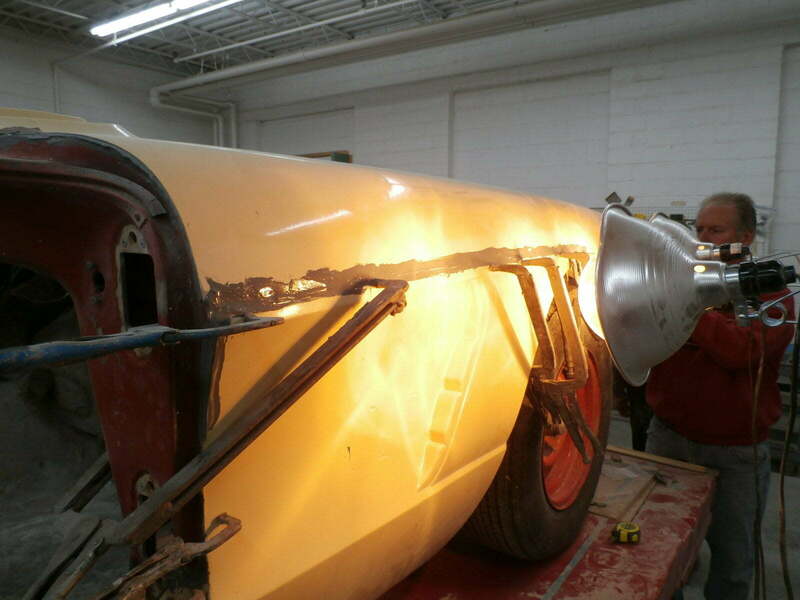 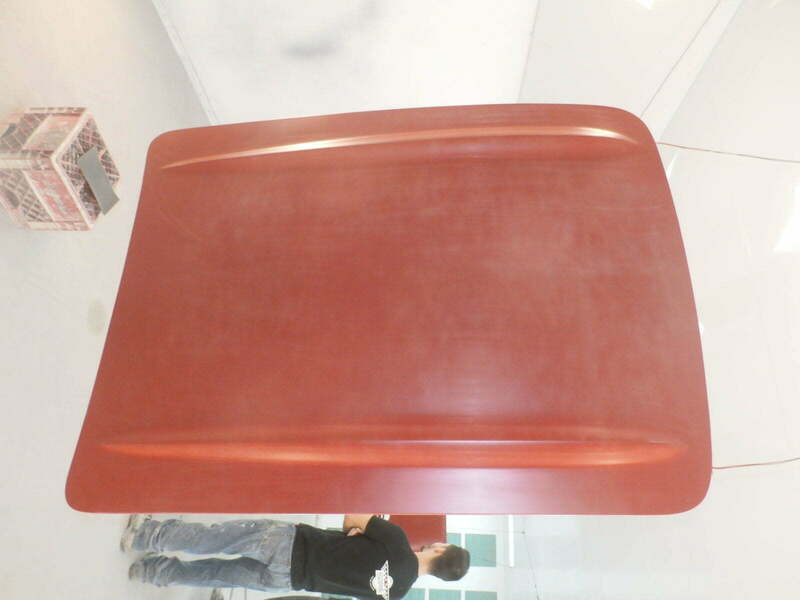 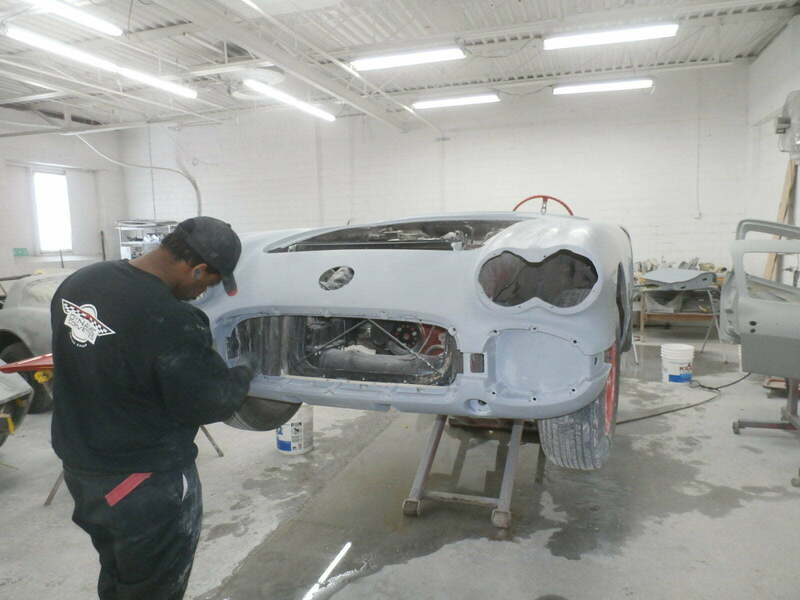 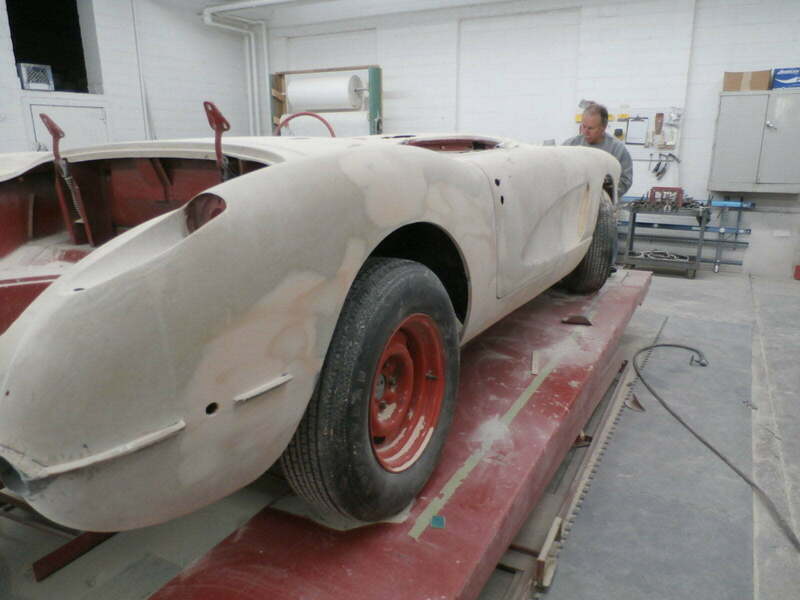 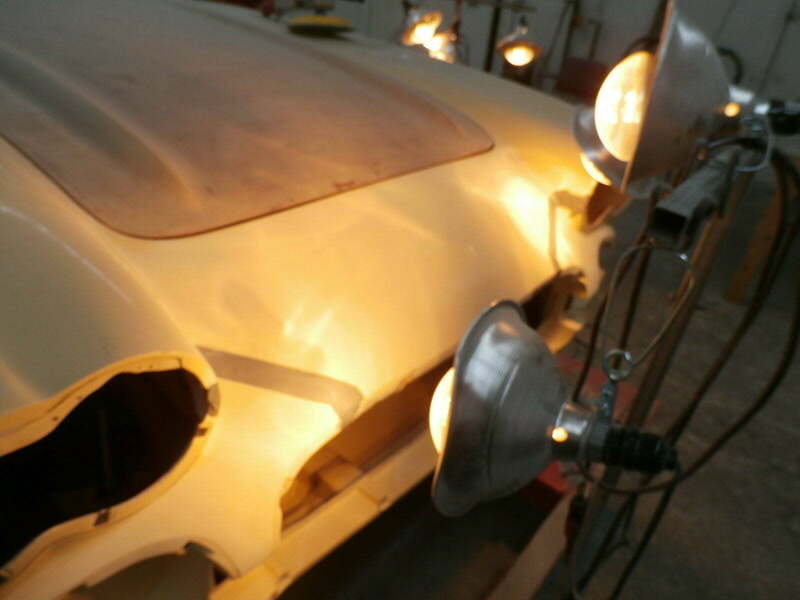 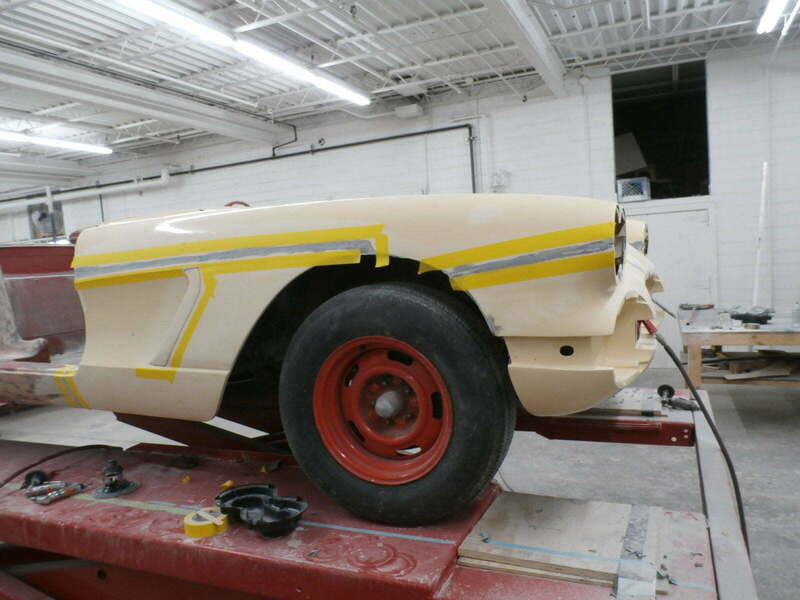 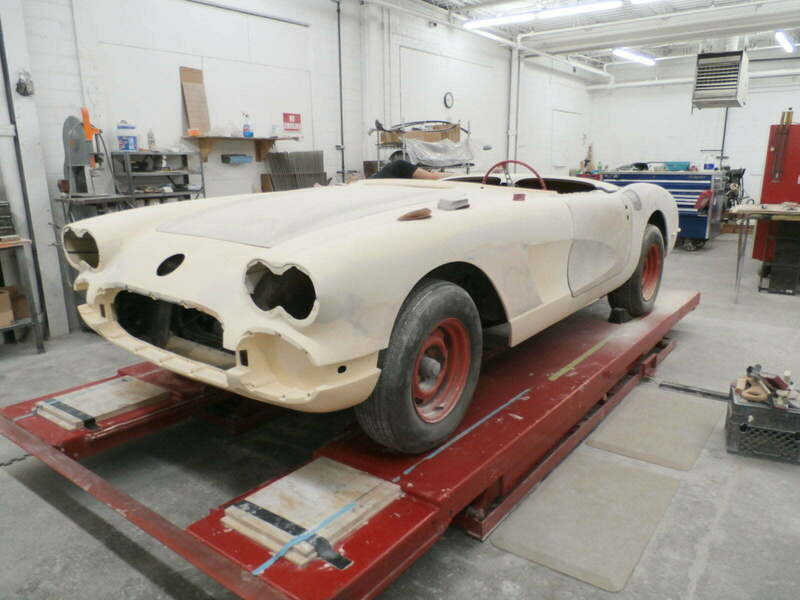 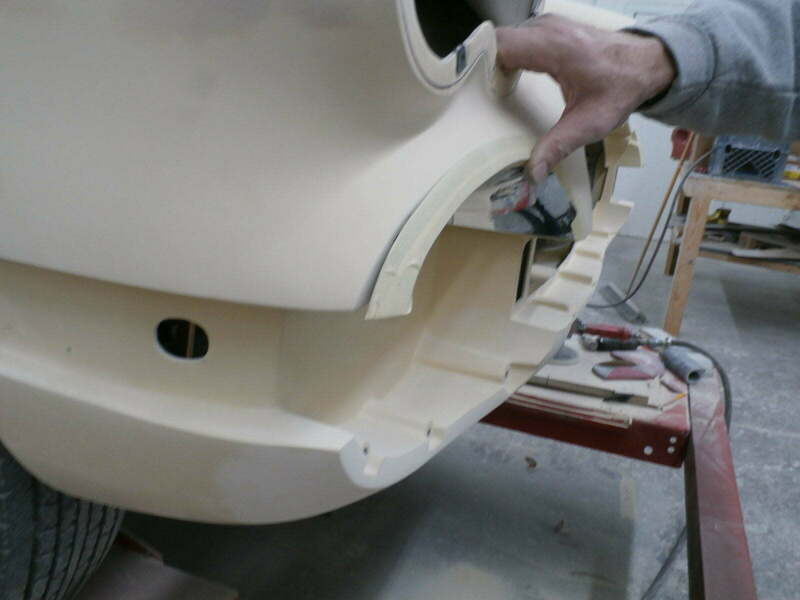 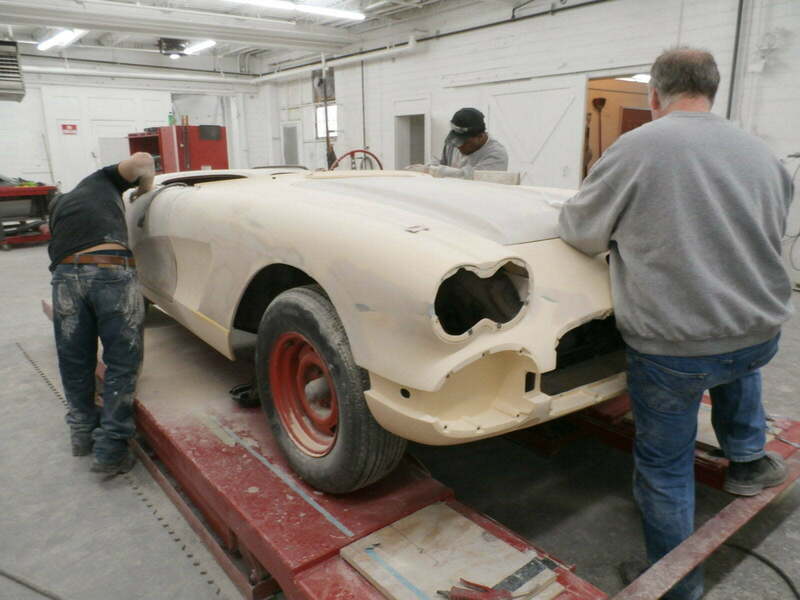 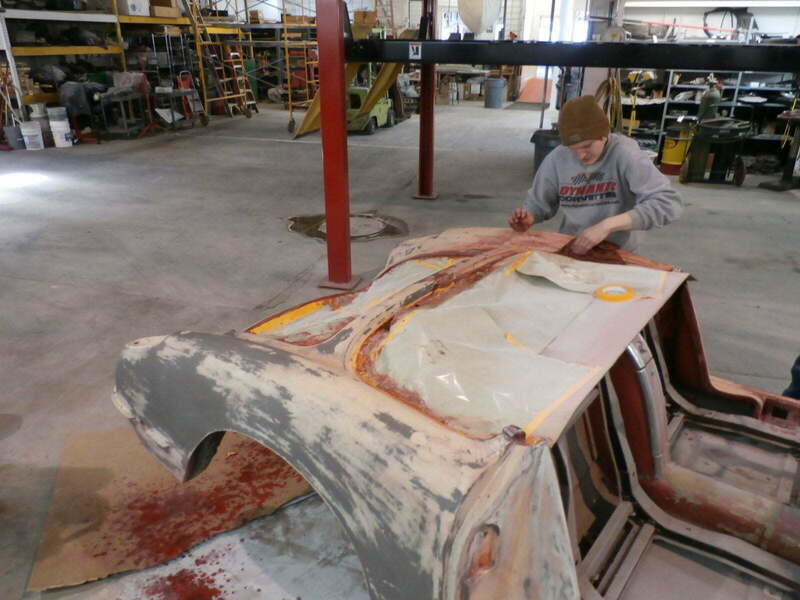 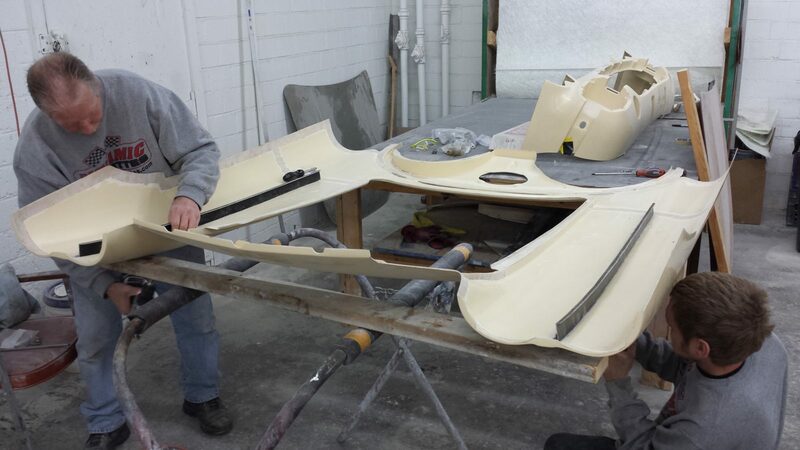 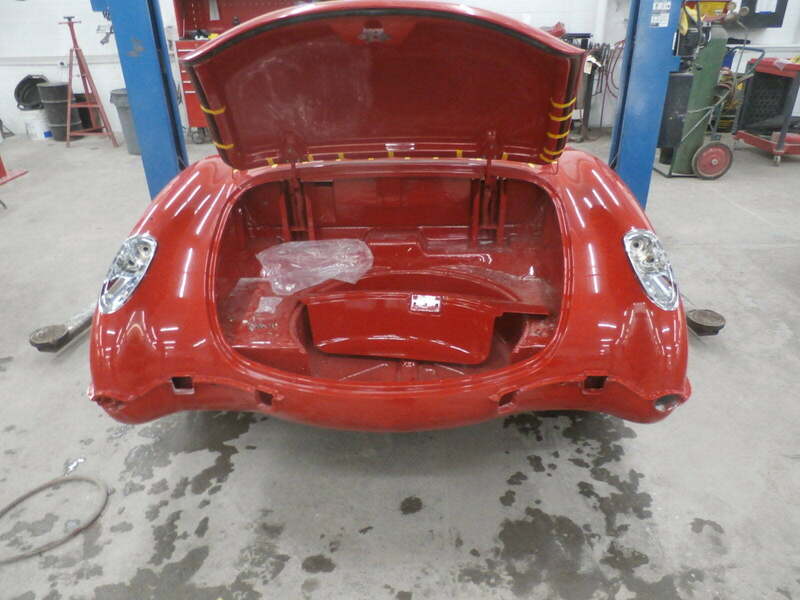 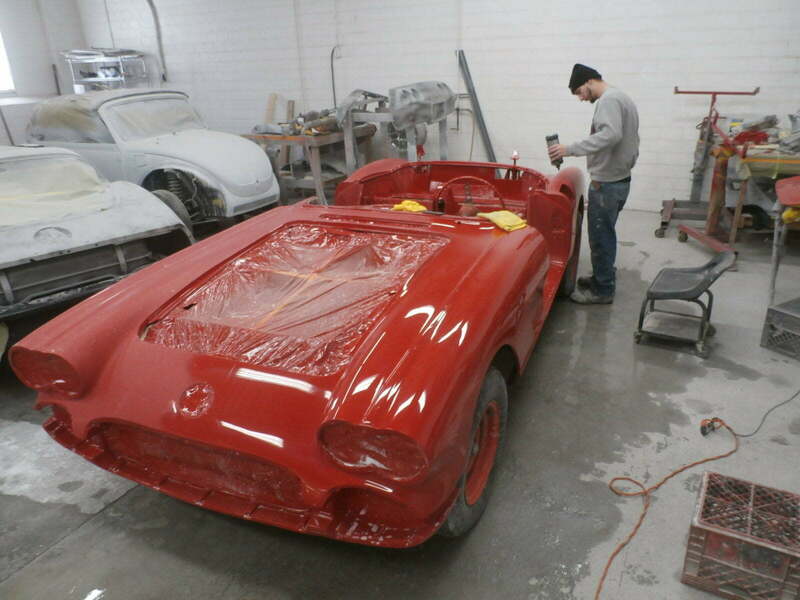 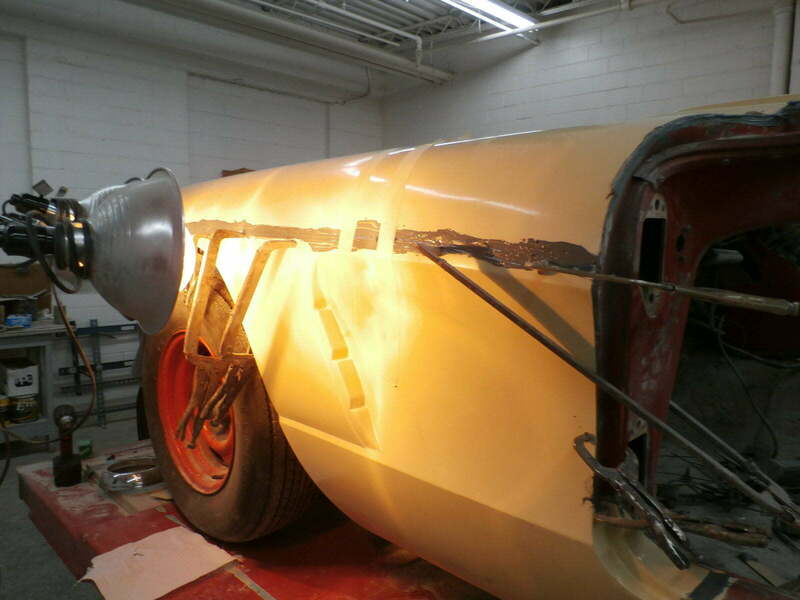 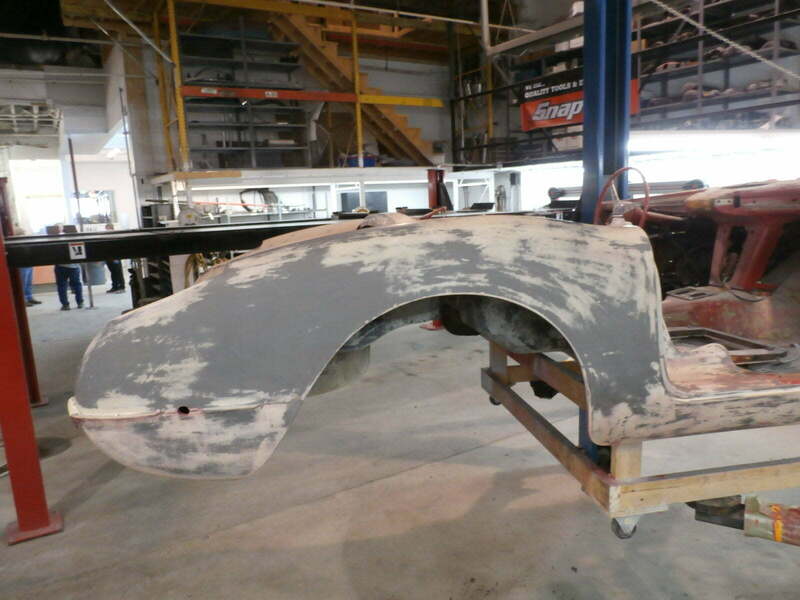 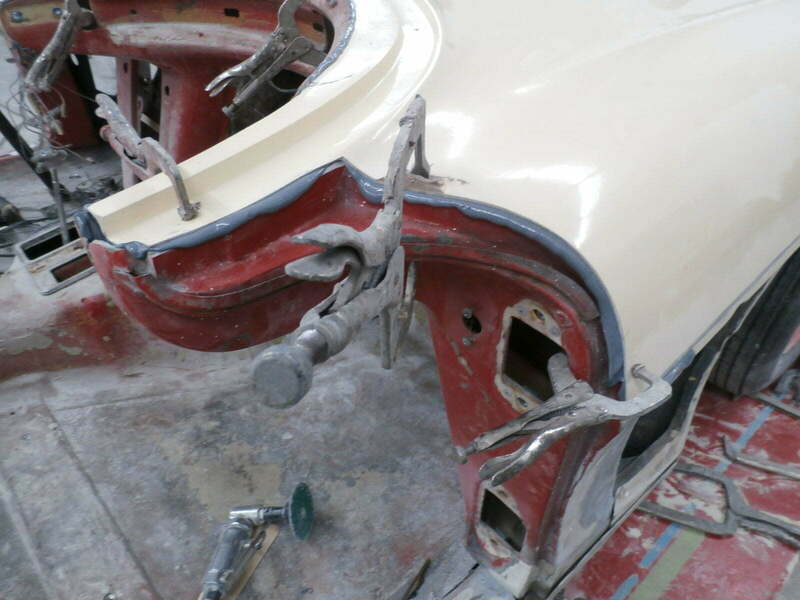 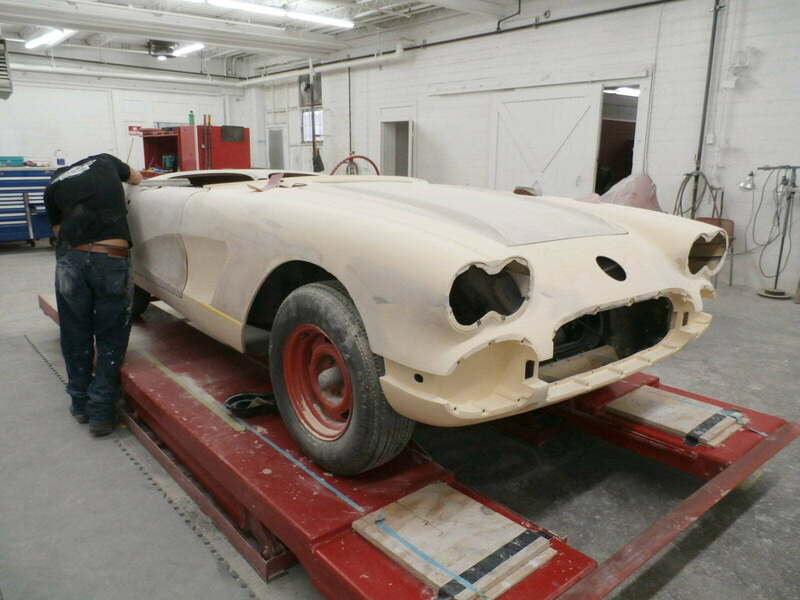 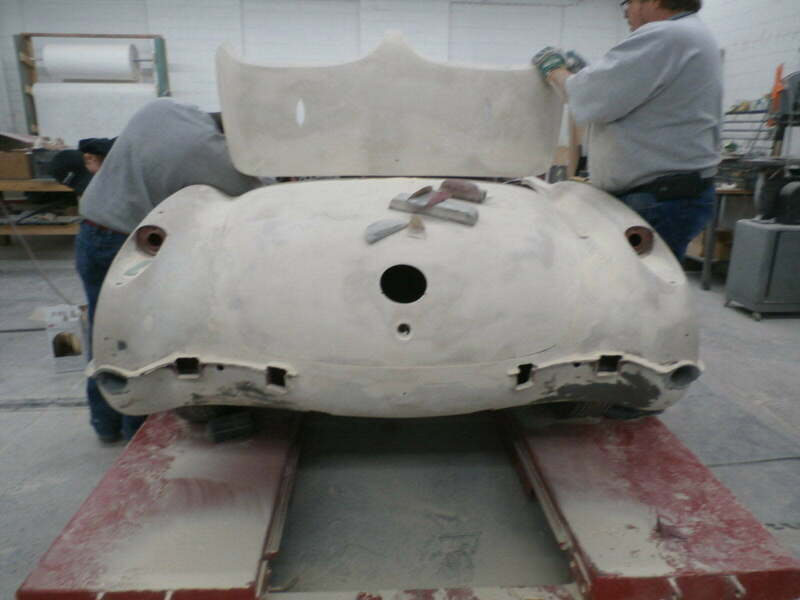 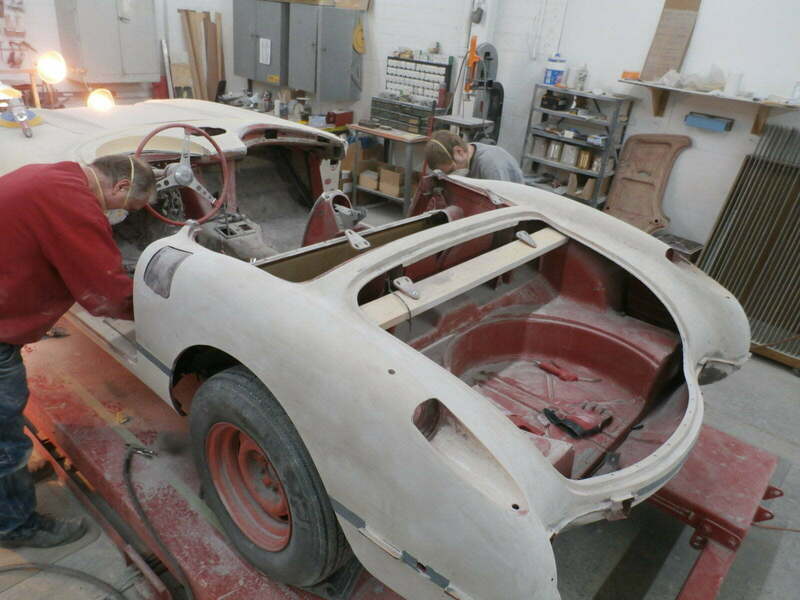 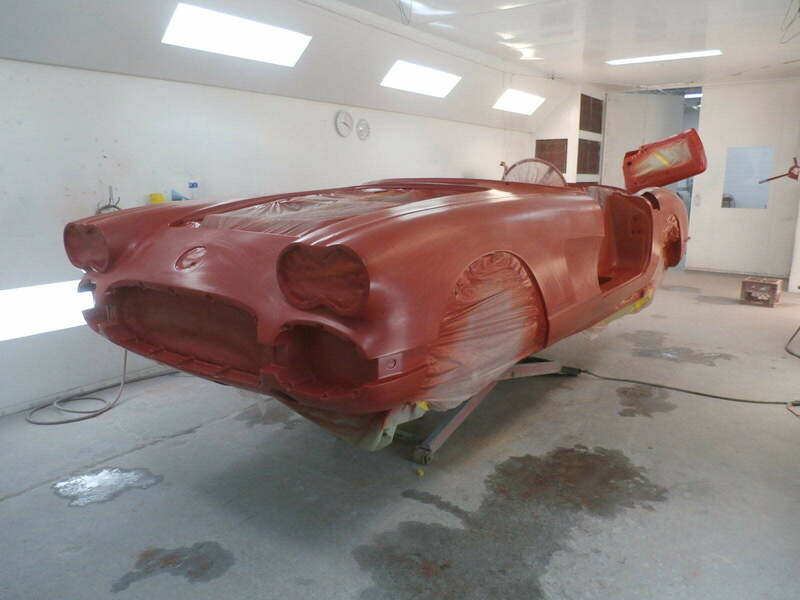 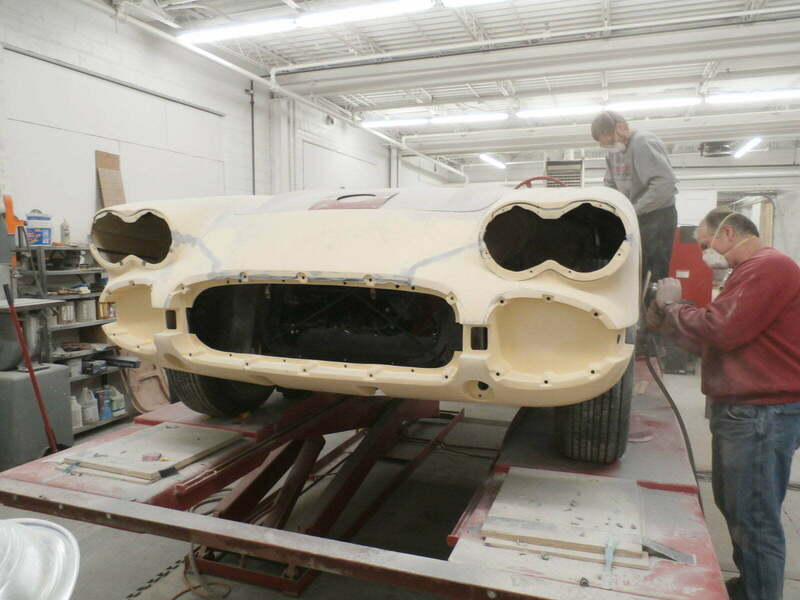 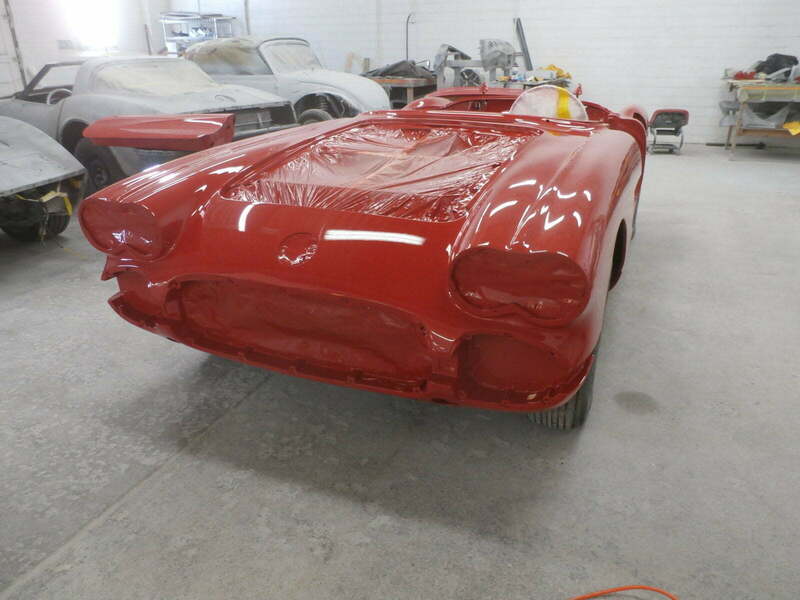 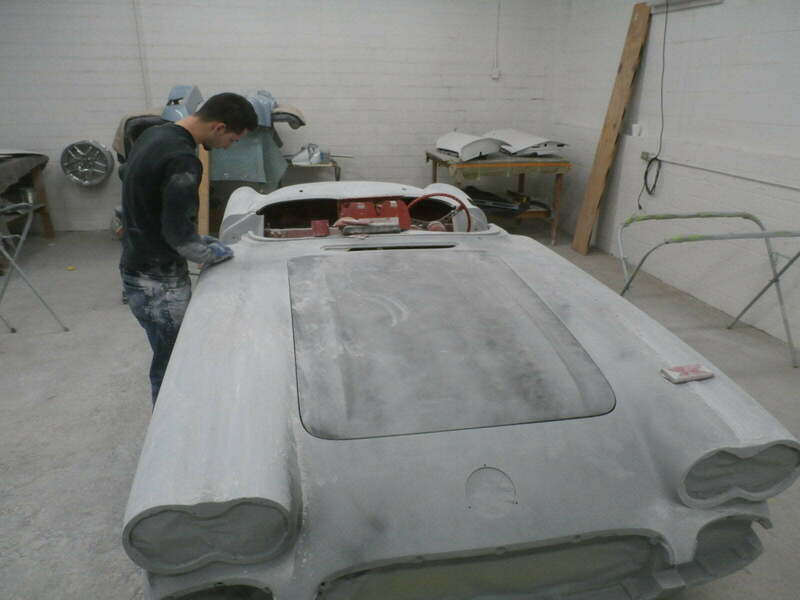 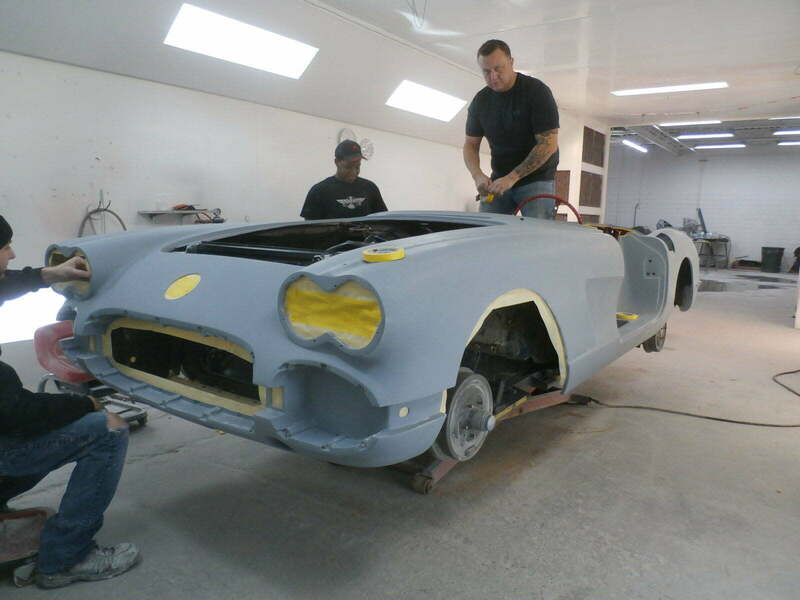 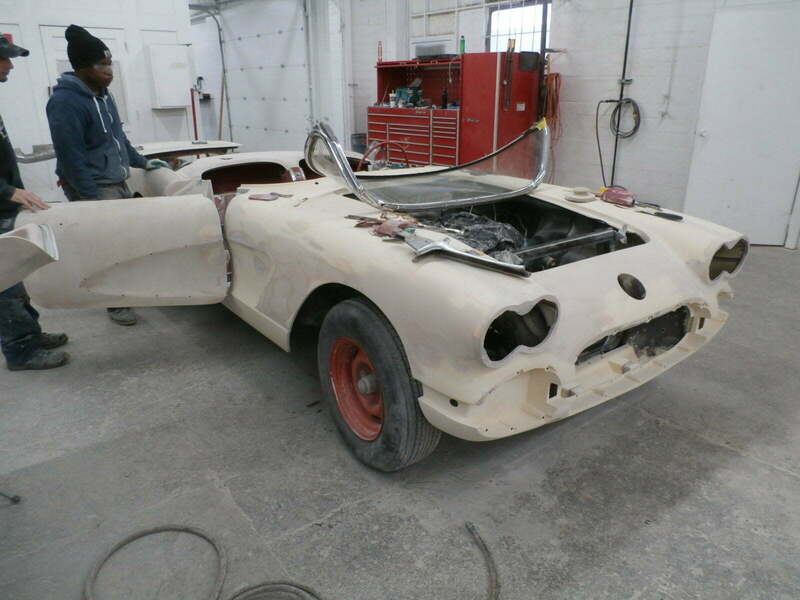 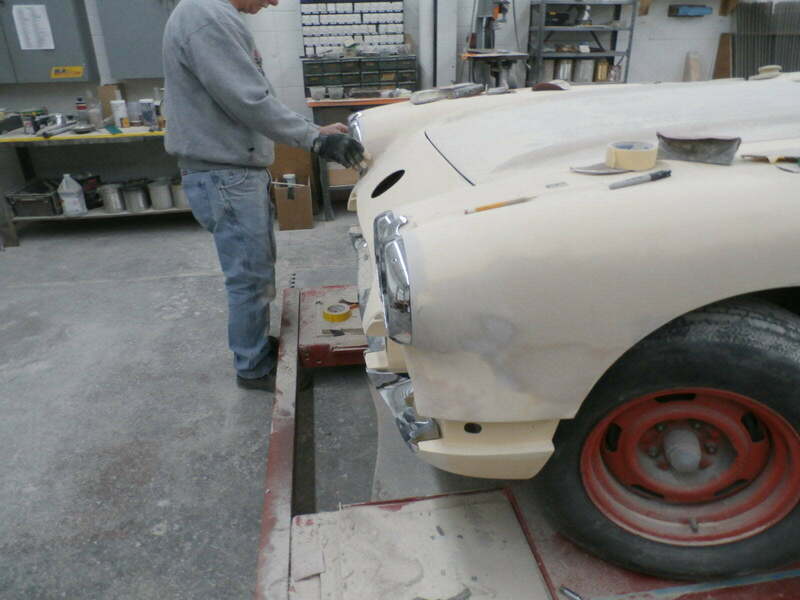 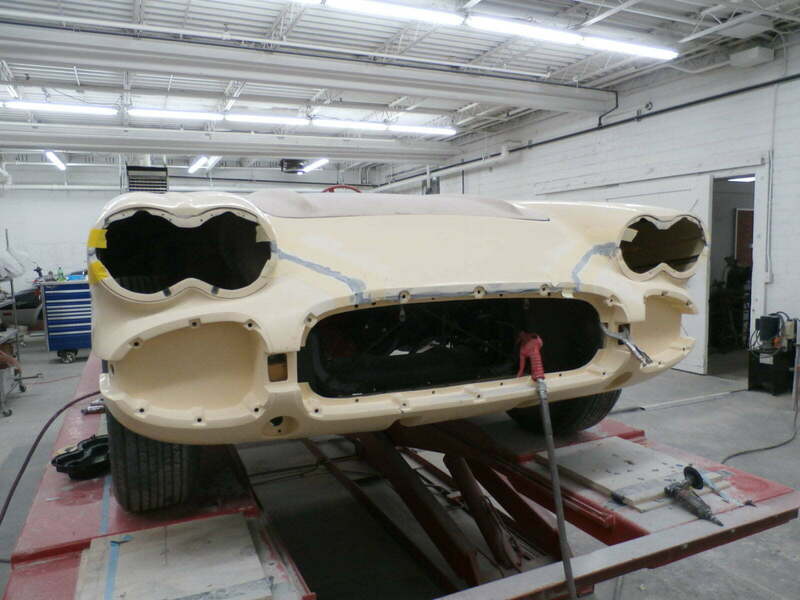 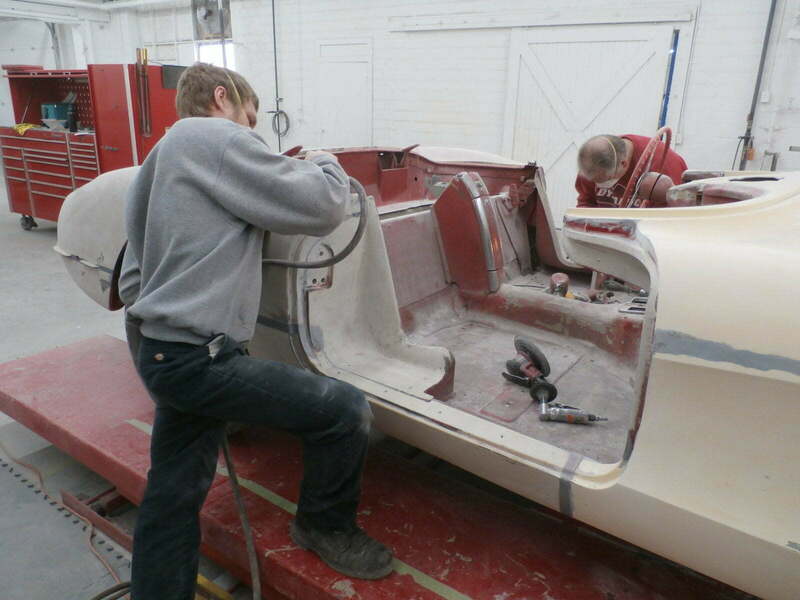 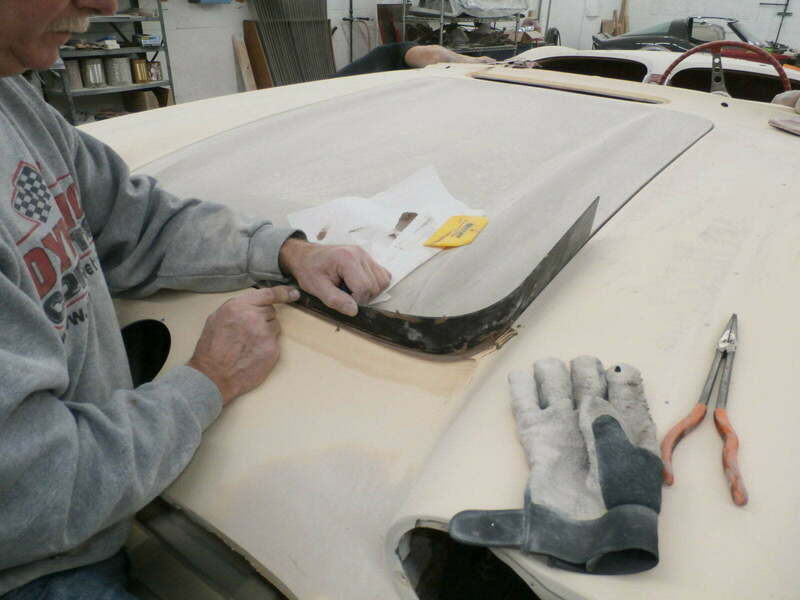 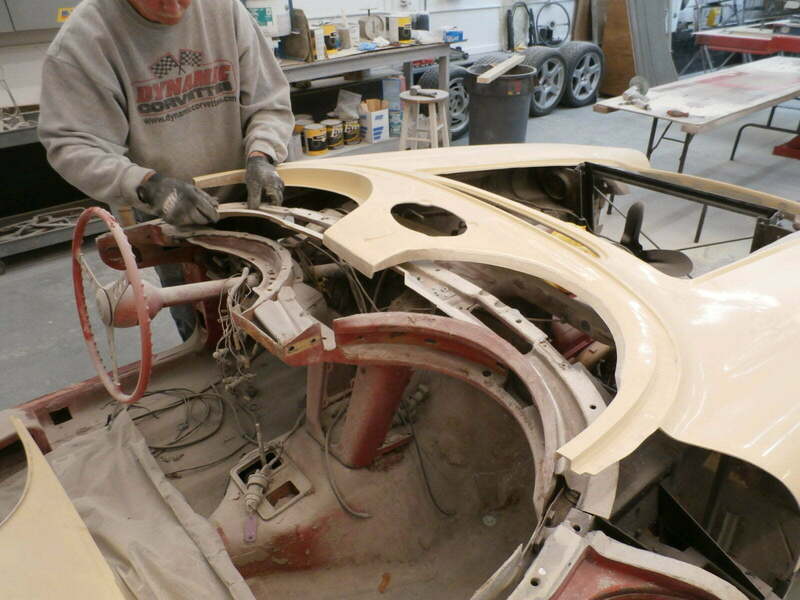 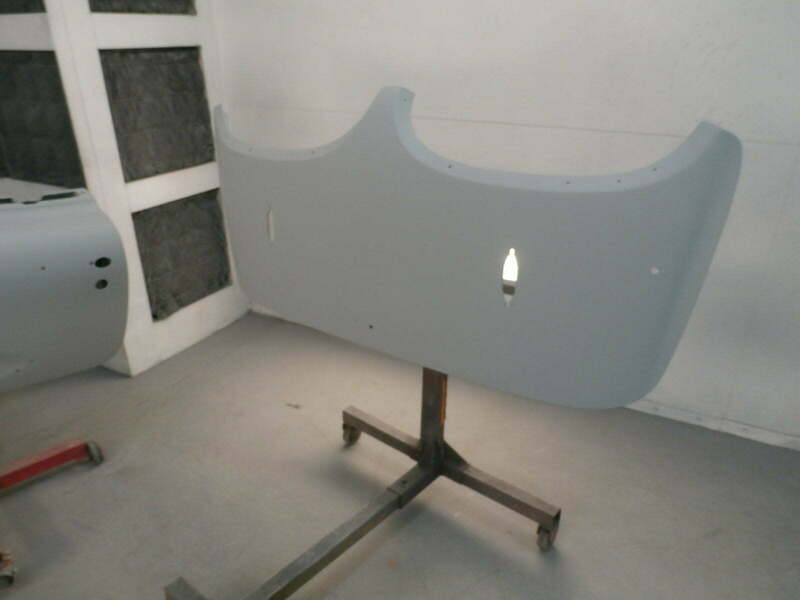 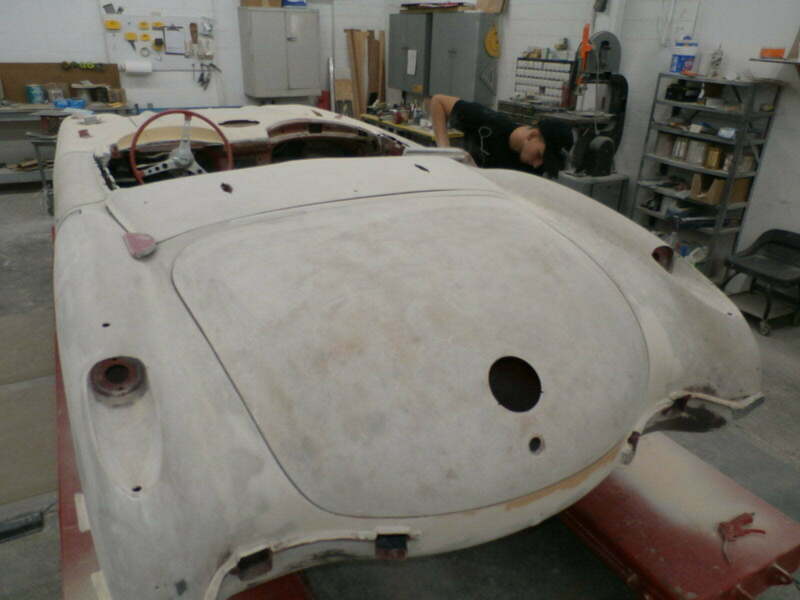 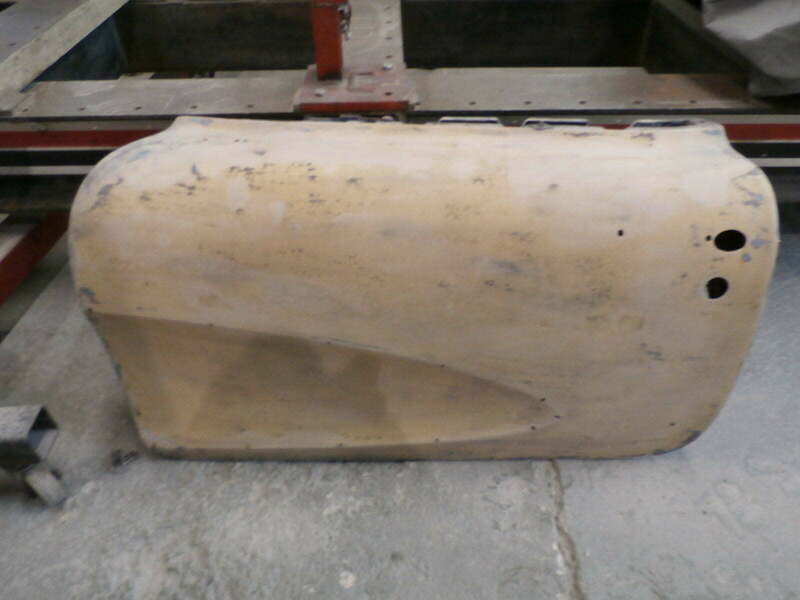 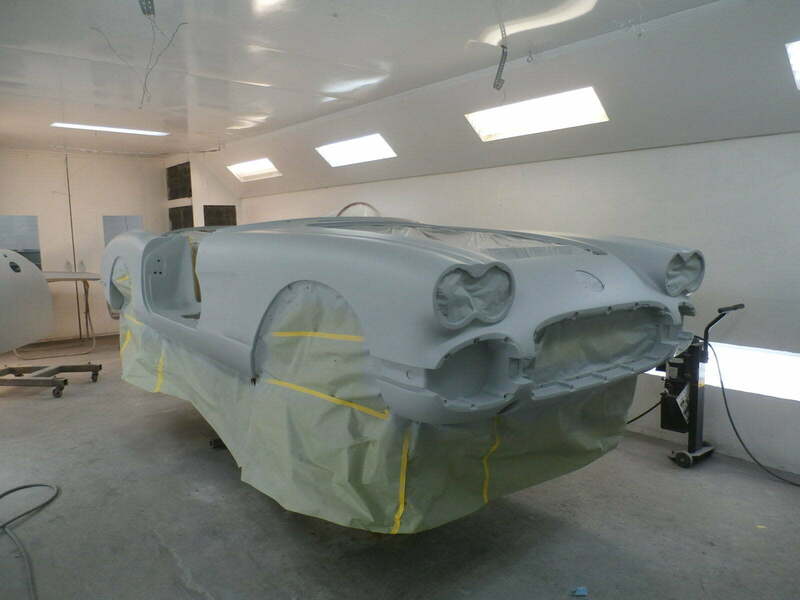 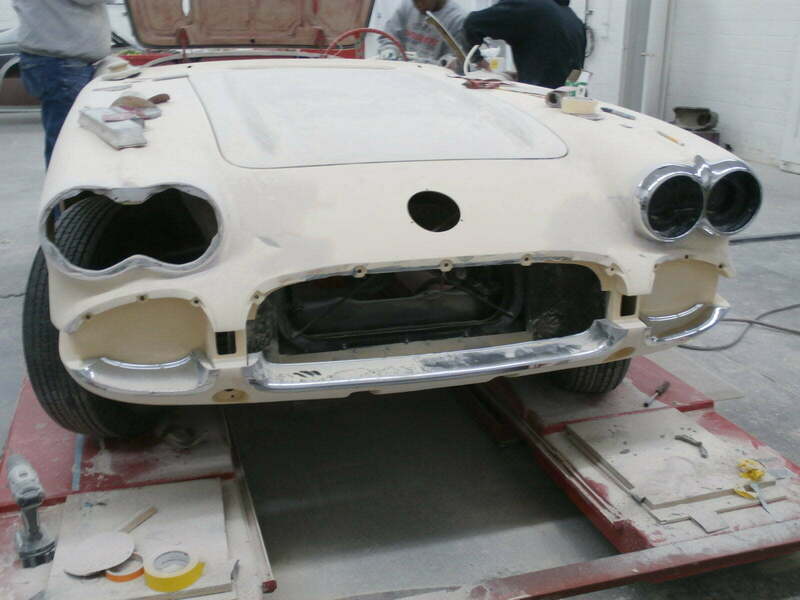 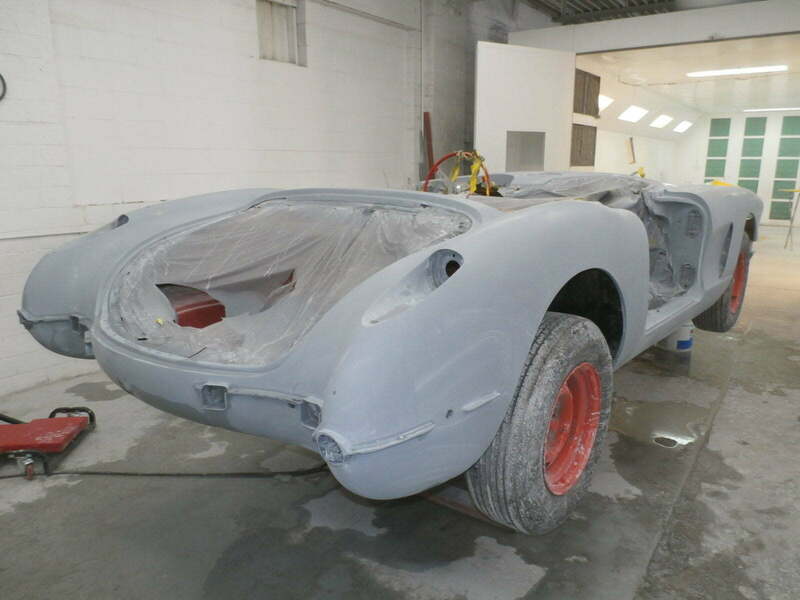 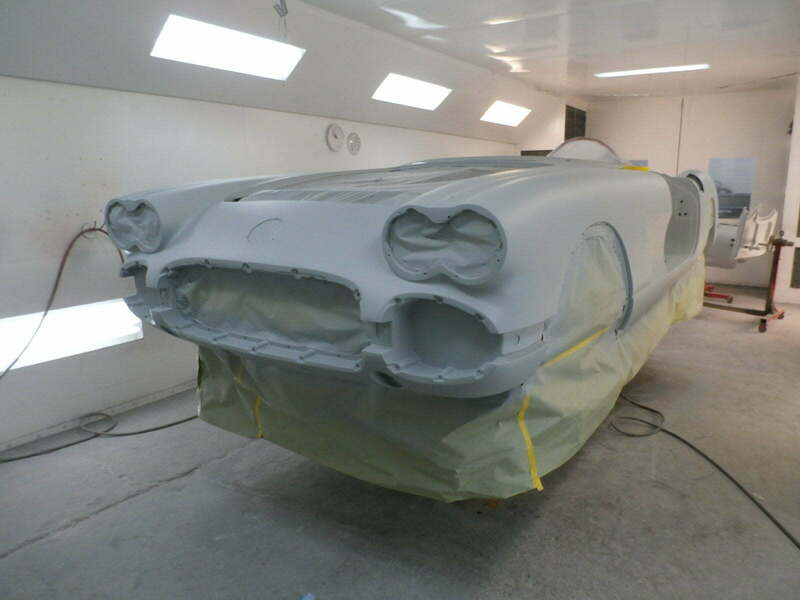 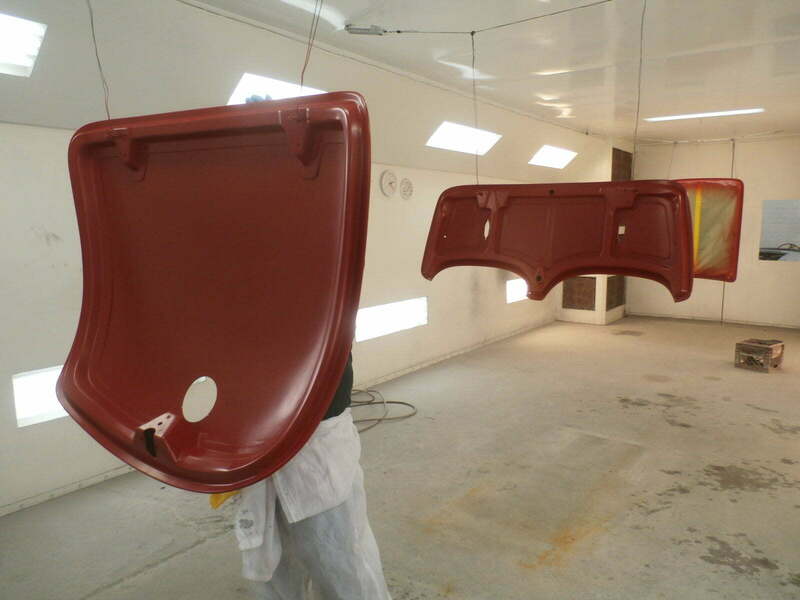 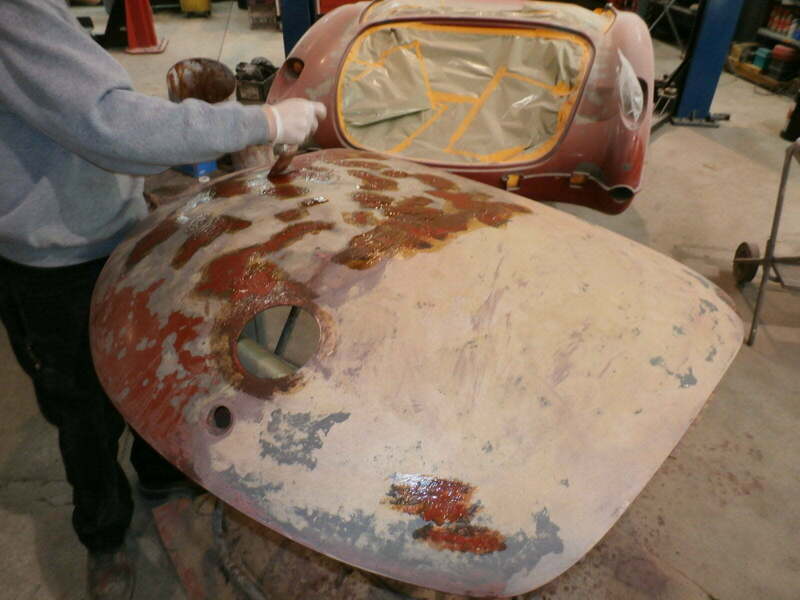 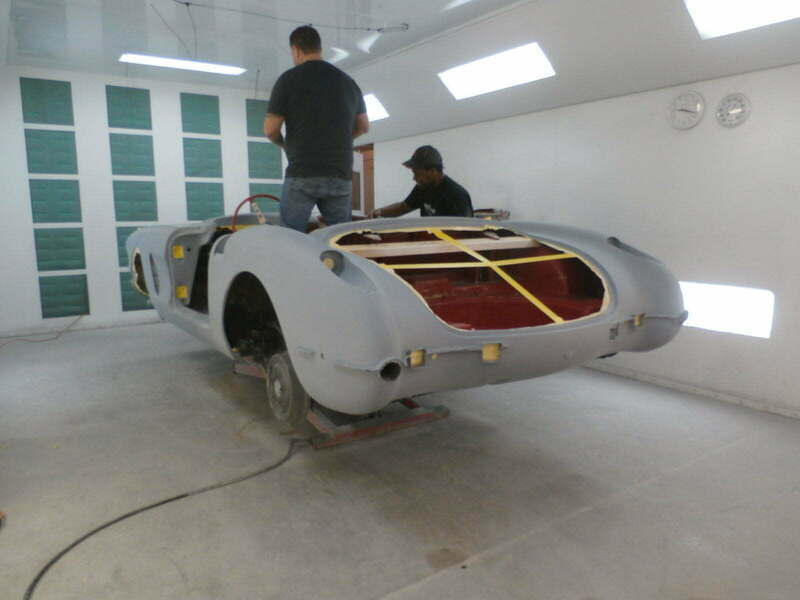 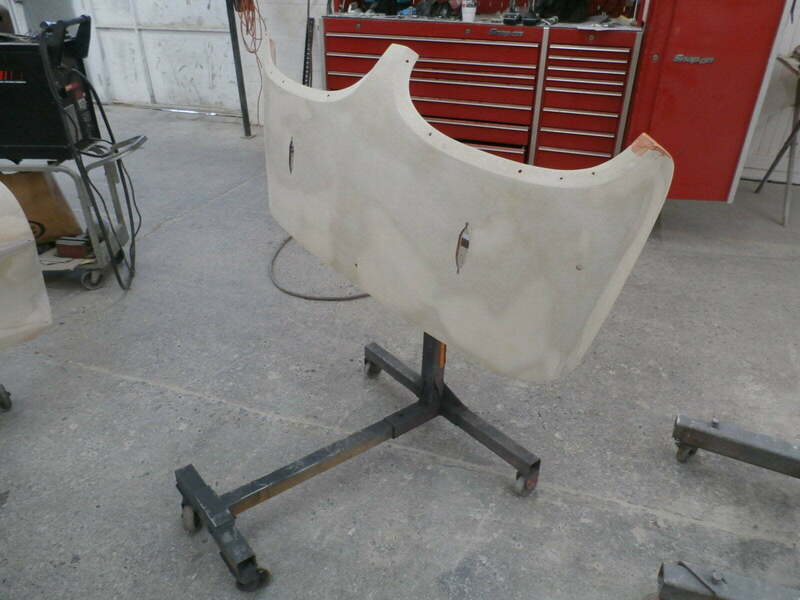 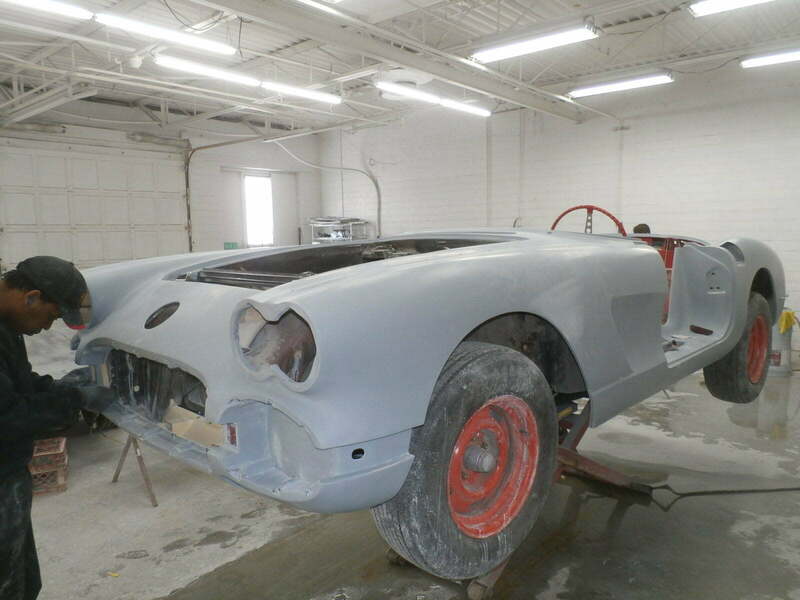 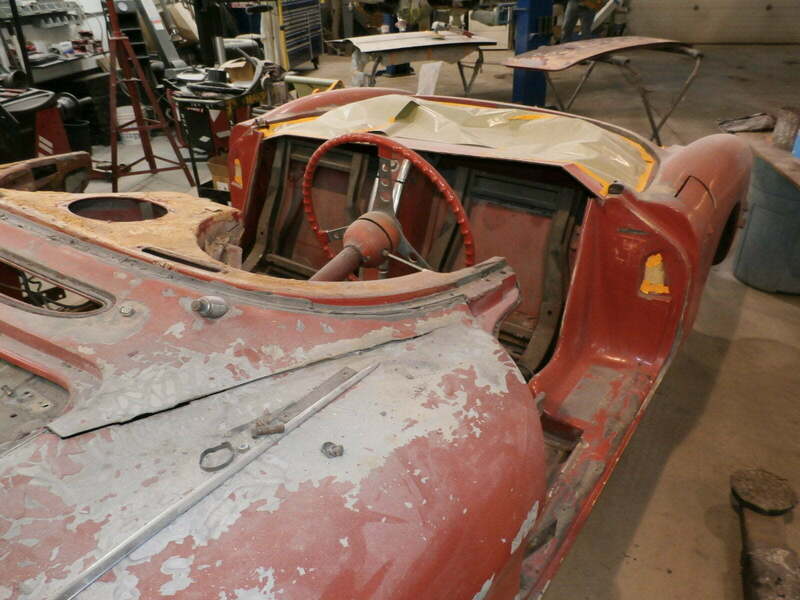 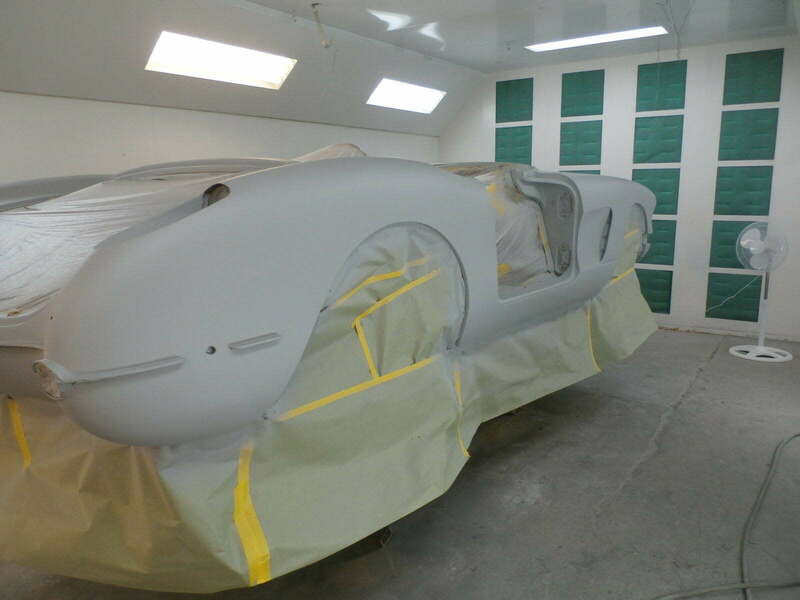 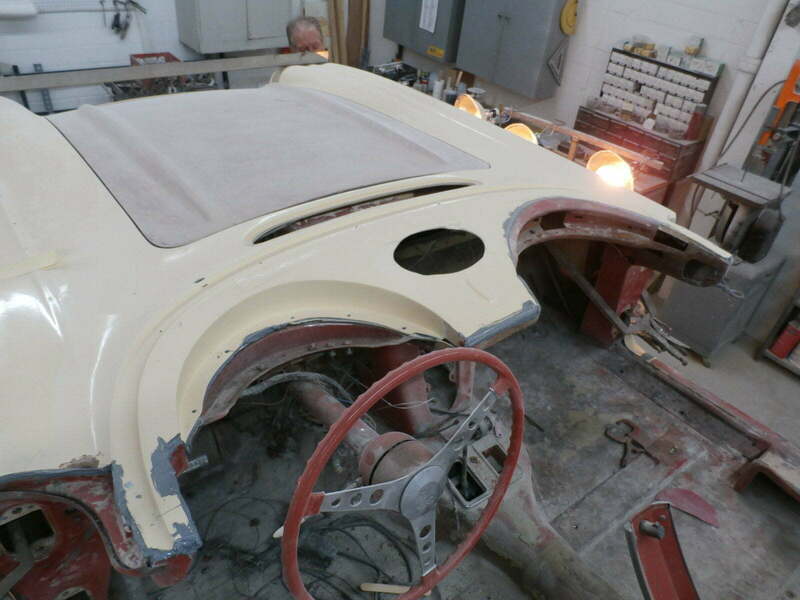 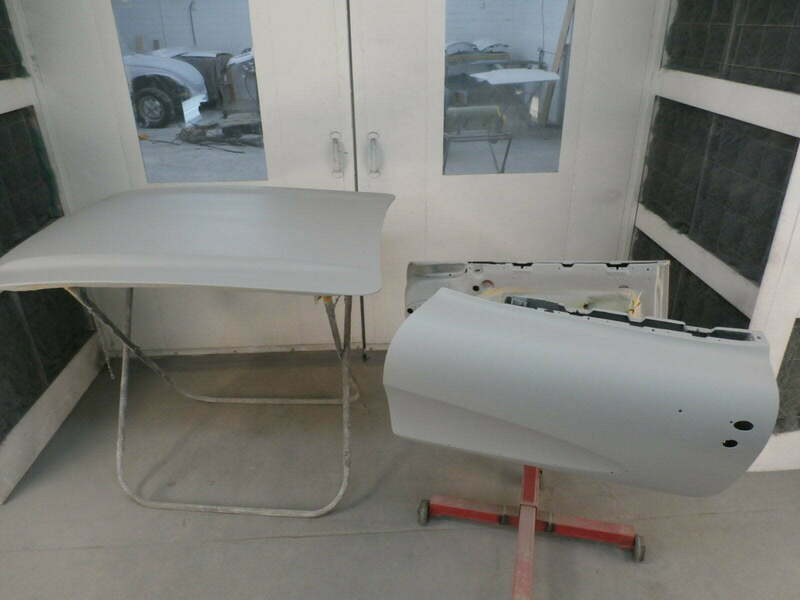 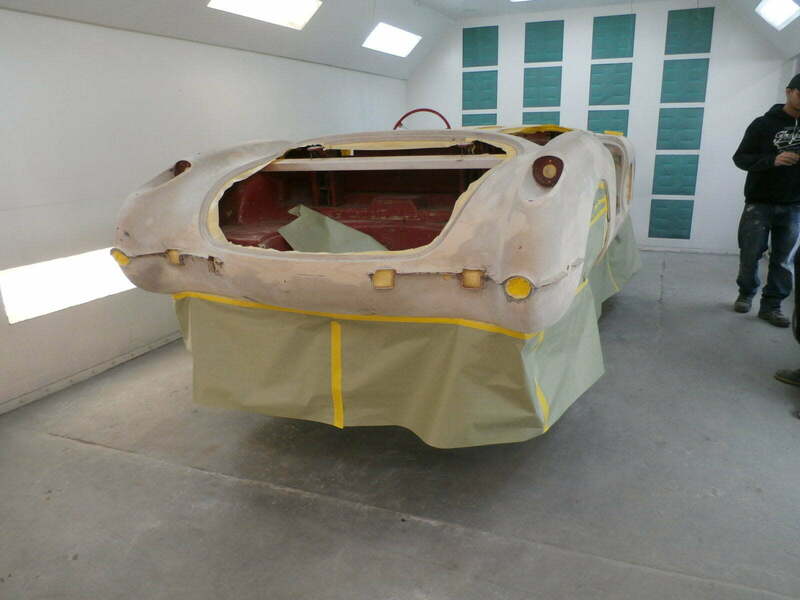 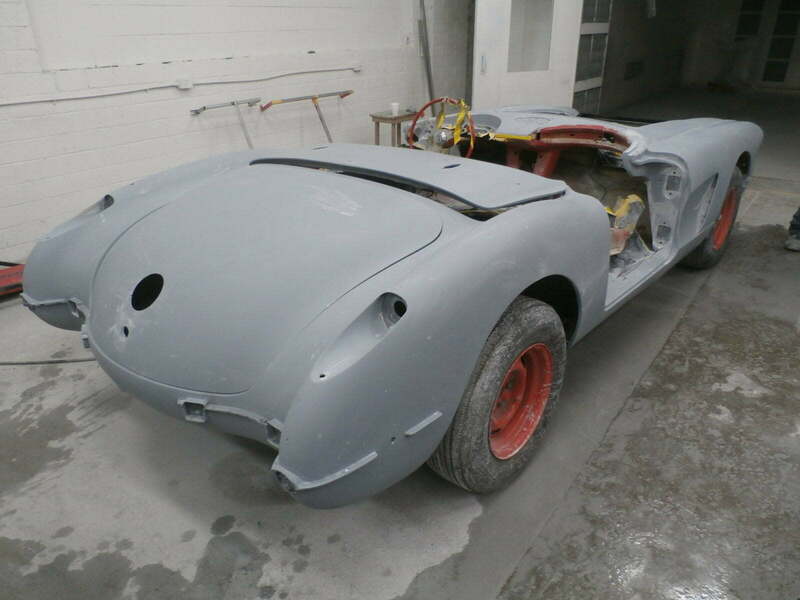 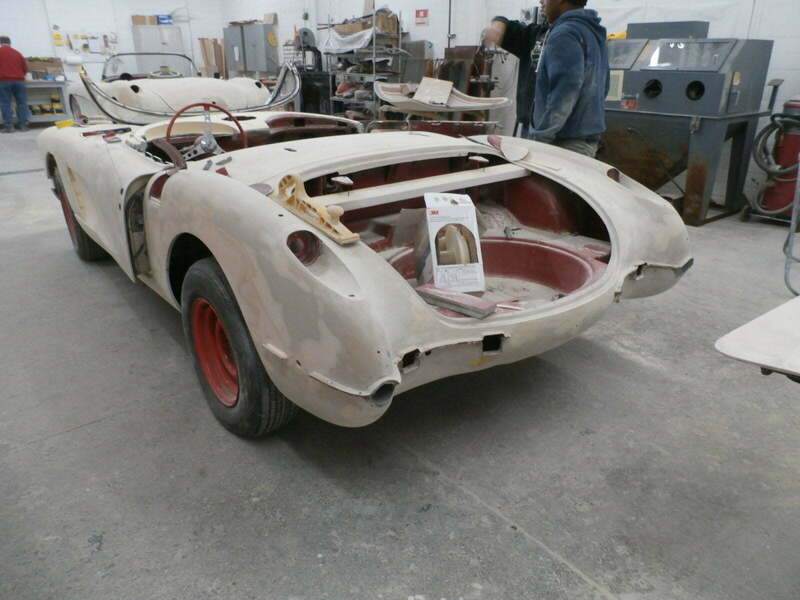 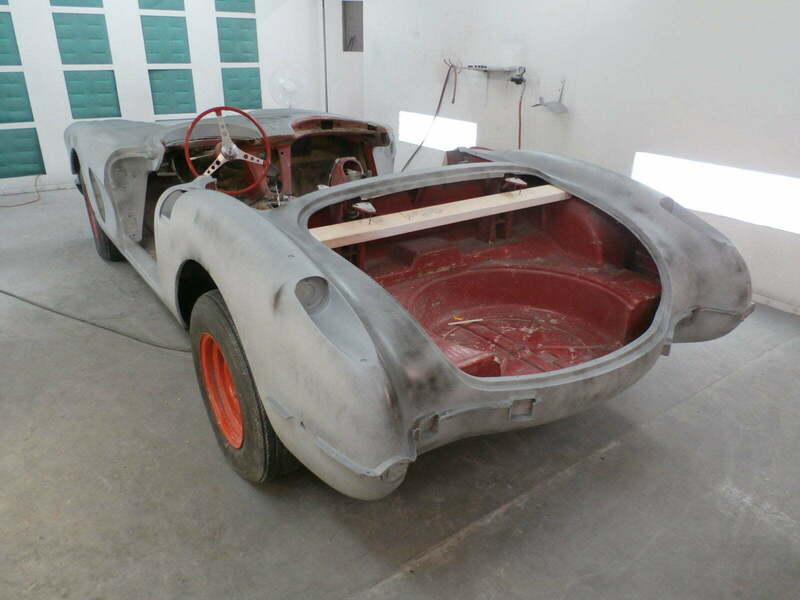 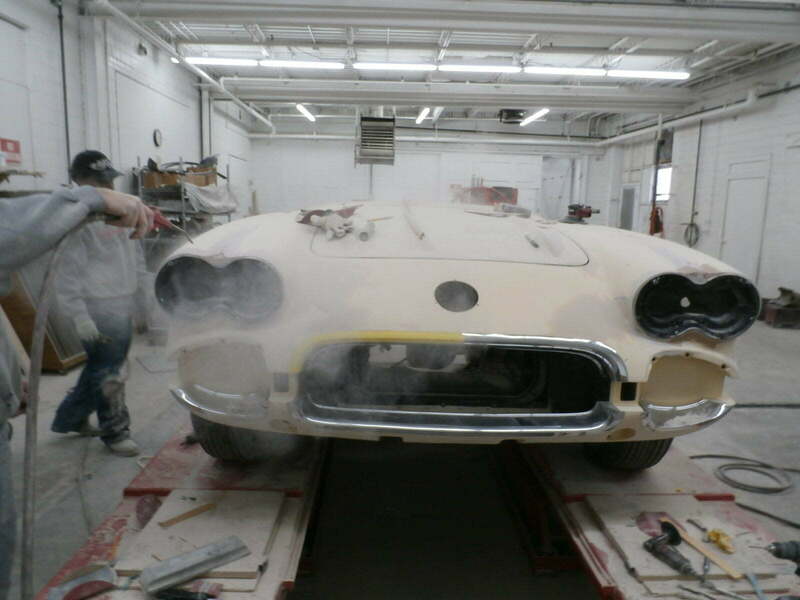 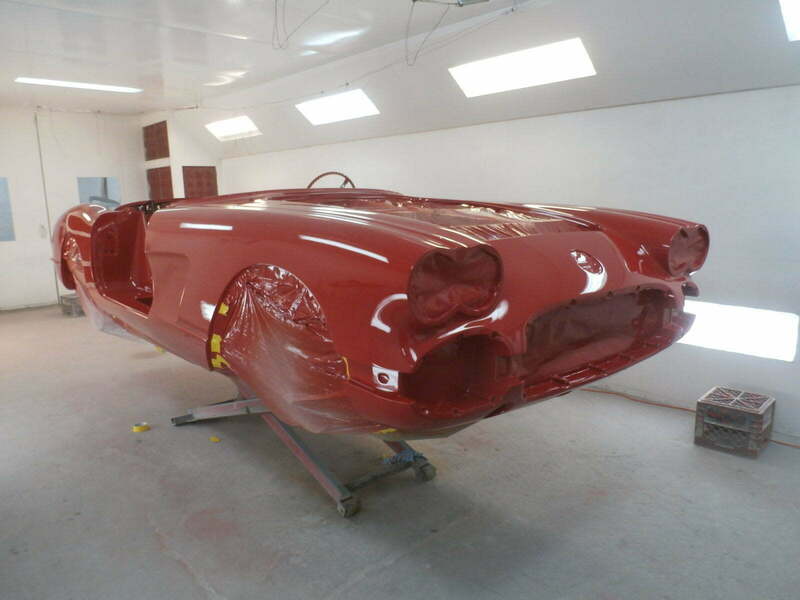 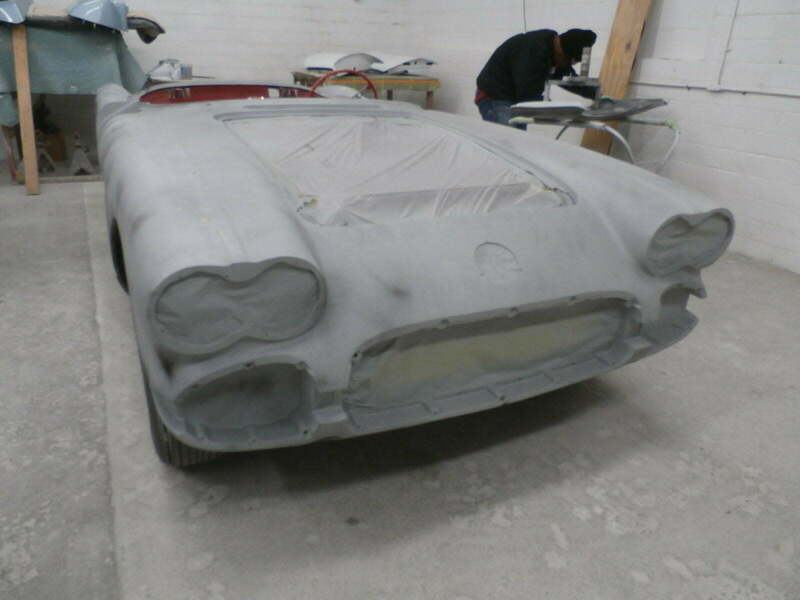 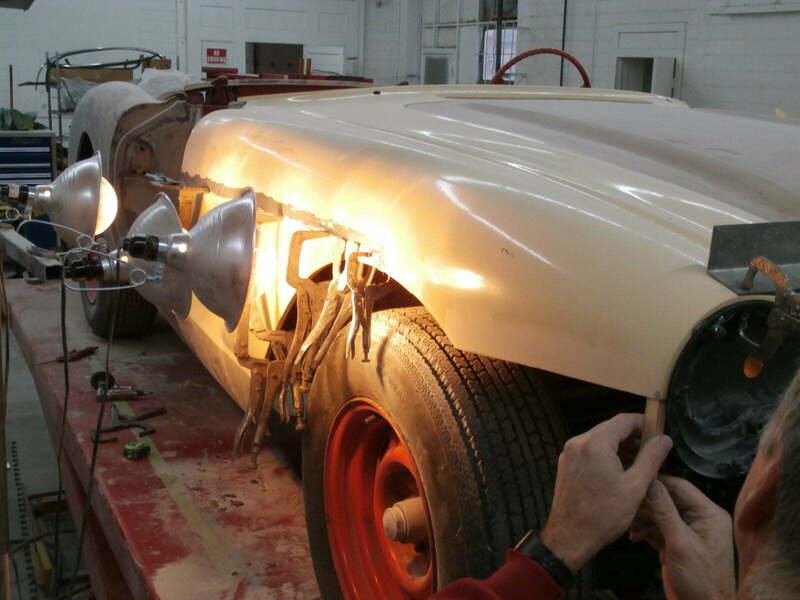 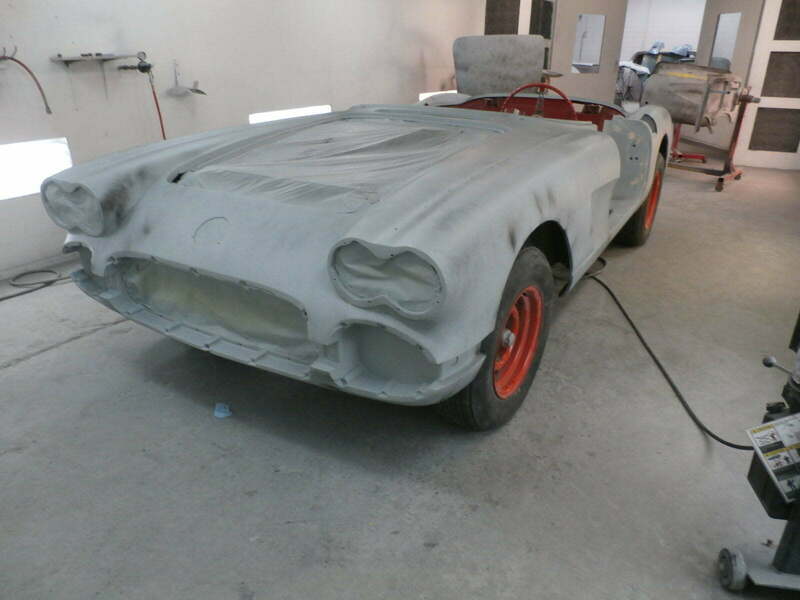 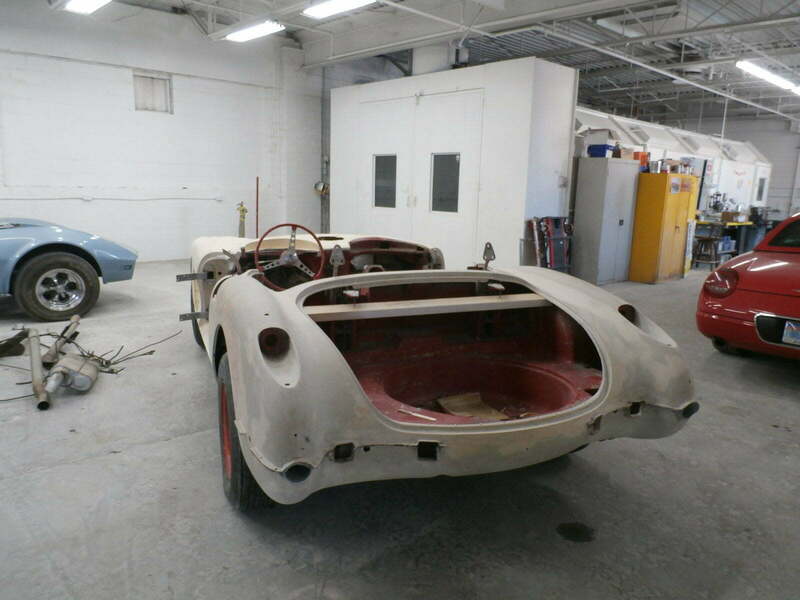 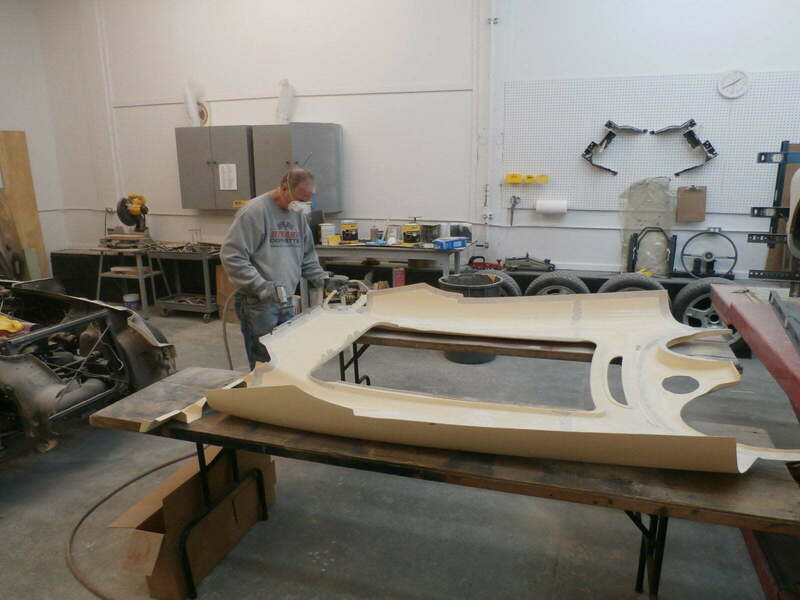 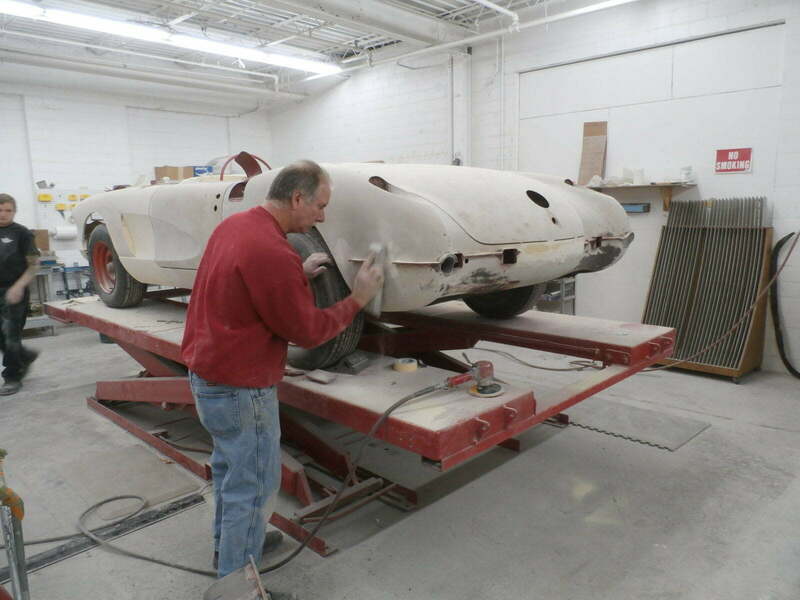 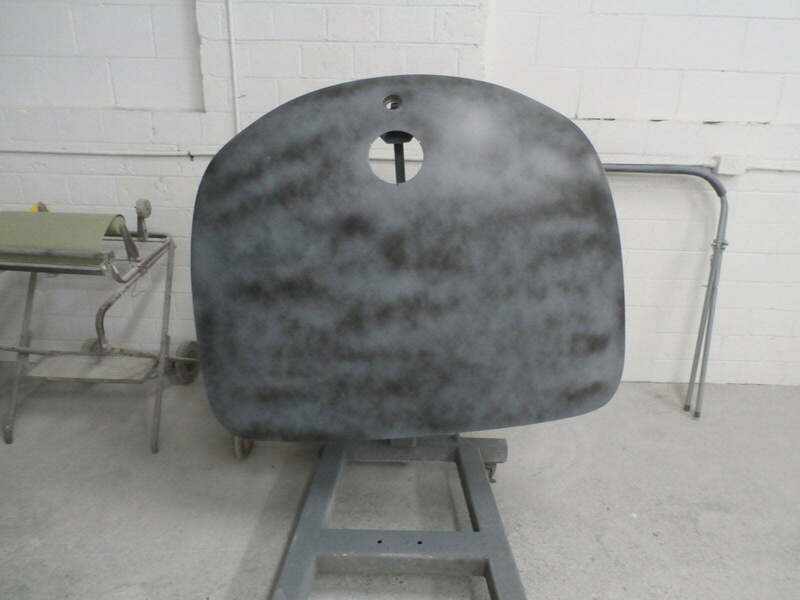 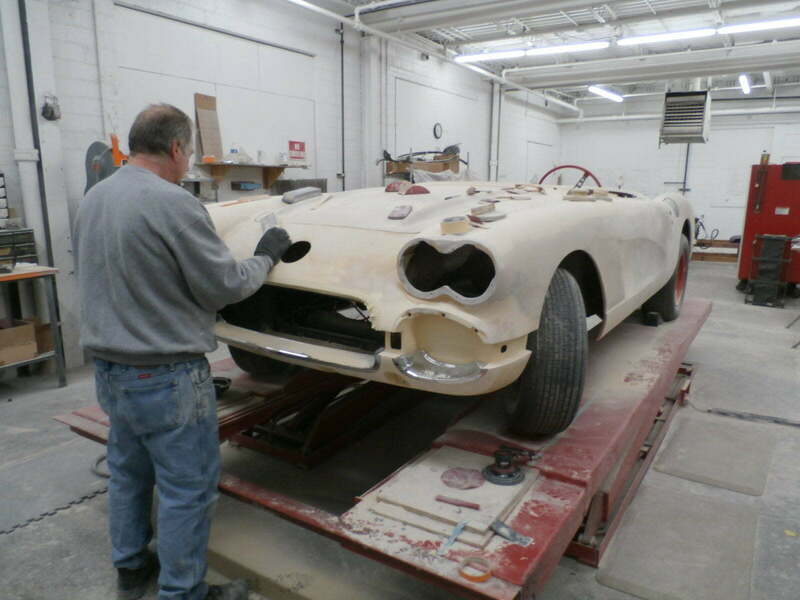 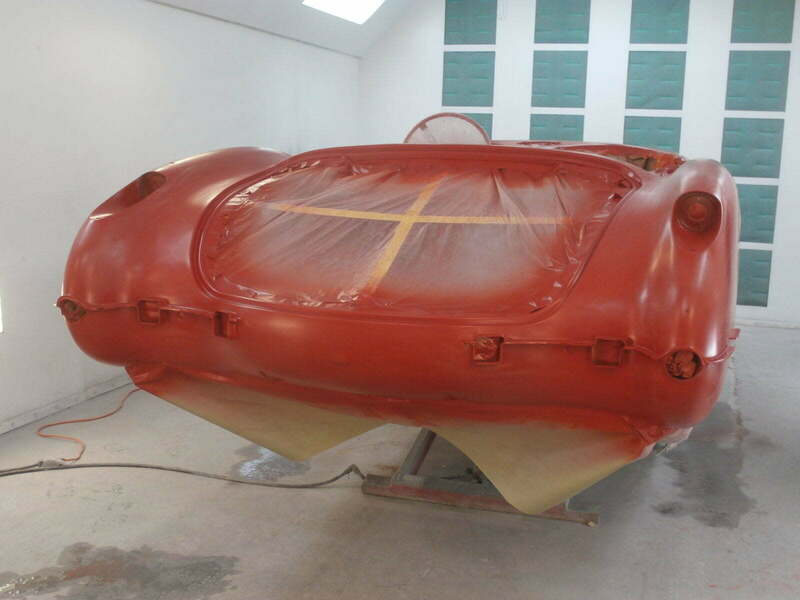 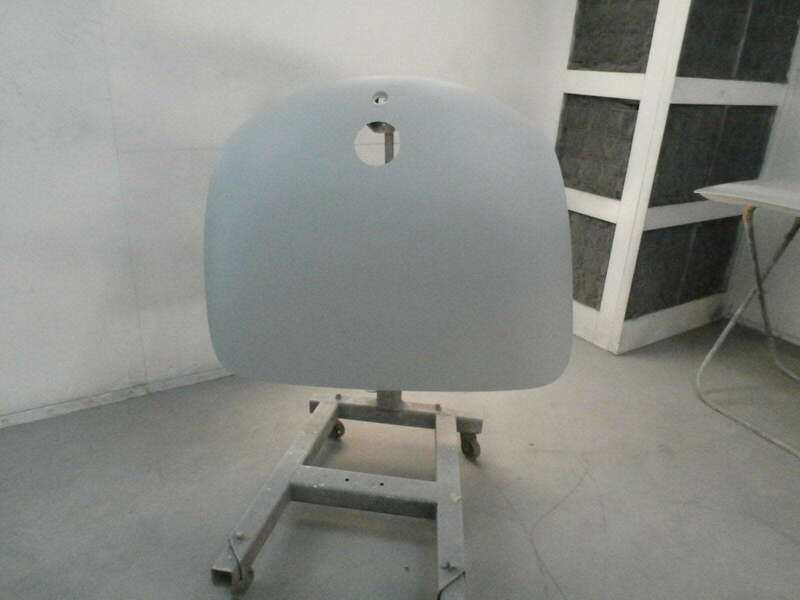 Once the body was coated in the second application of primer, they wet sanded the body until it was smooth as glass. 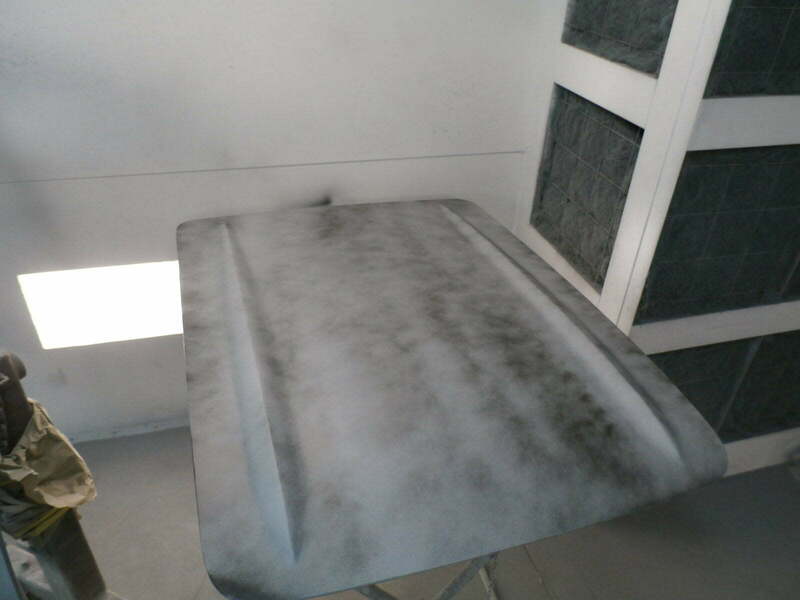 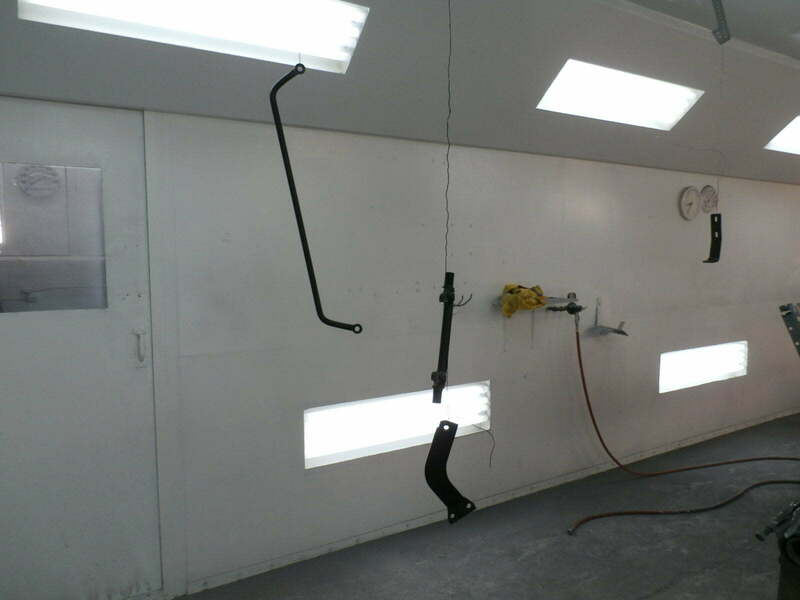 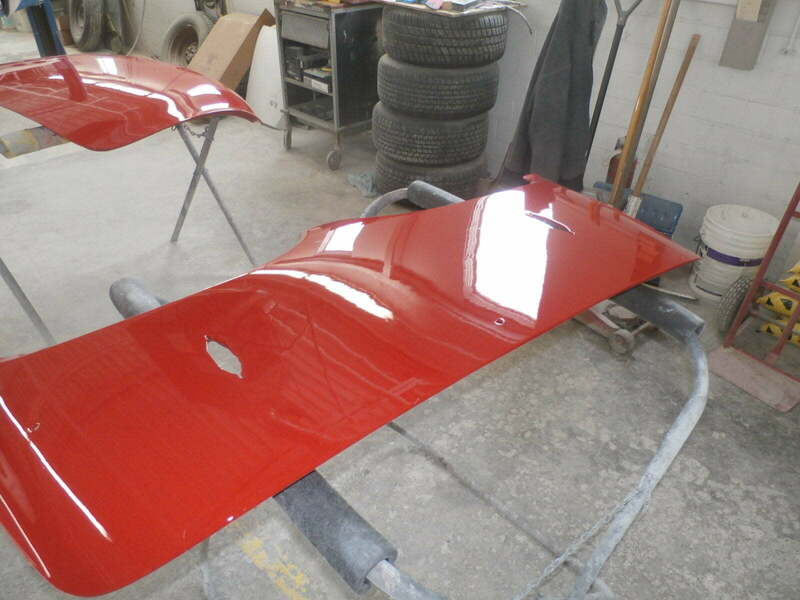 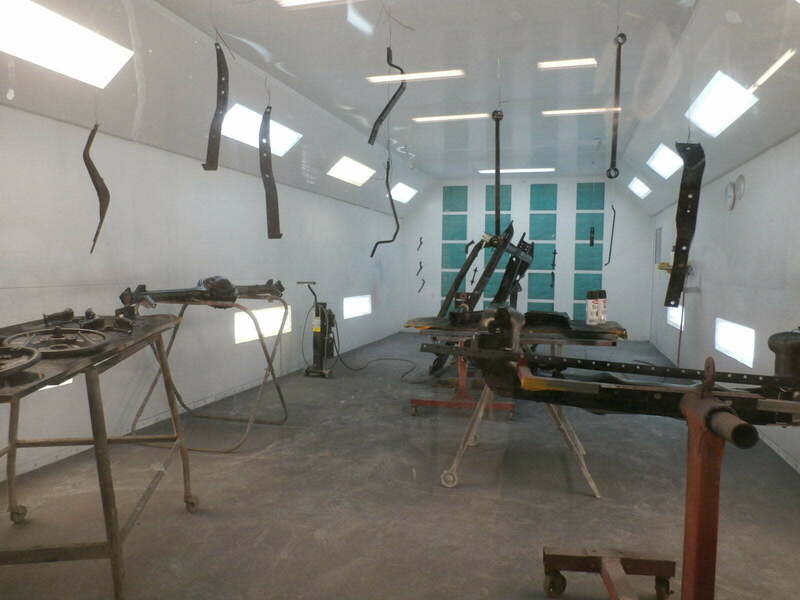 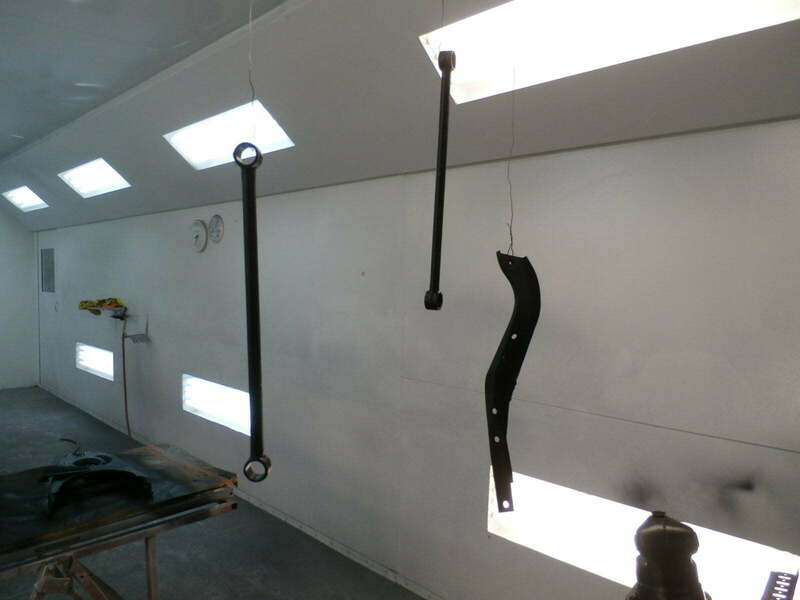 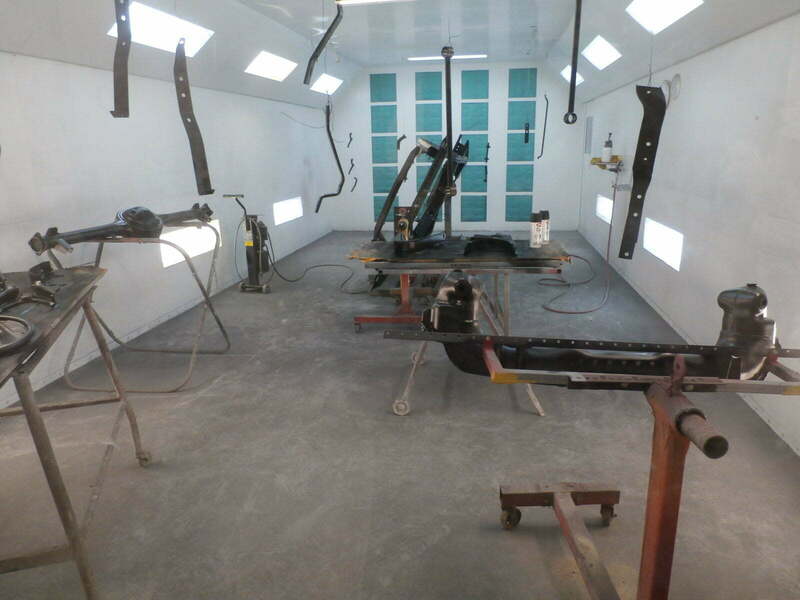 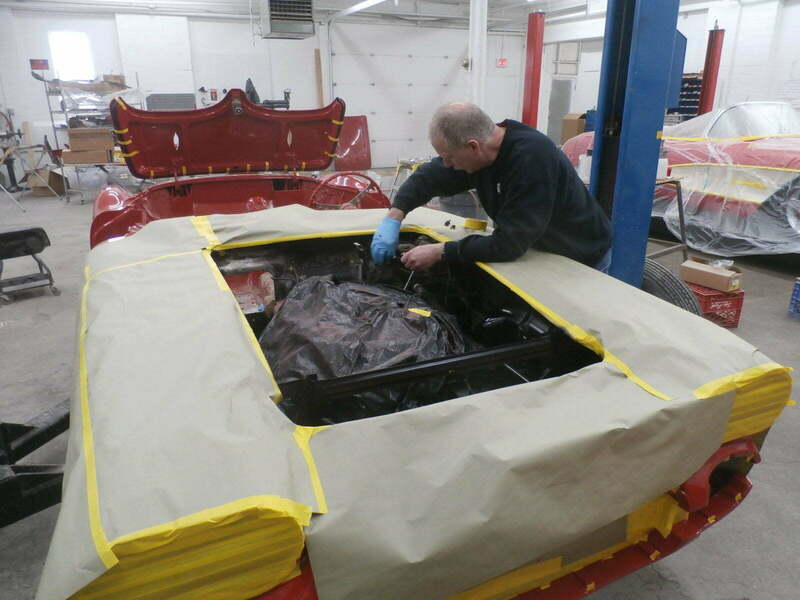 With the body smooth as glass, they masked off the entire vehicle again and started to apply base coat and clear coat to the removable panels and shortly followed by the entire vehicle. 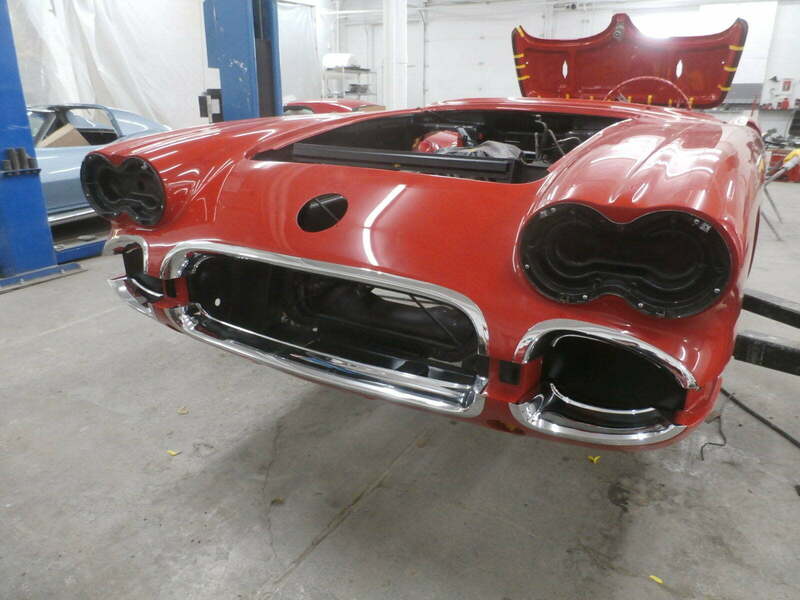 Once the vehicle was out of the paint booth, they wet sanded the entire body and then rubbed and buffed the finish to a brilliant shine. 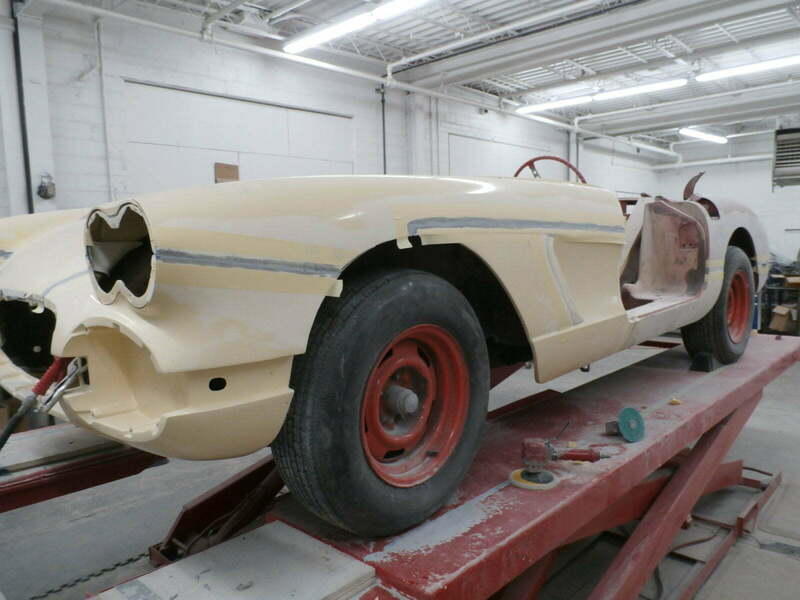 Now that all of the body and paint work is finished. 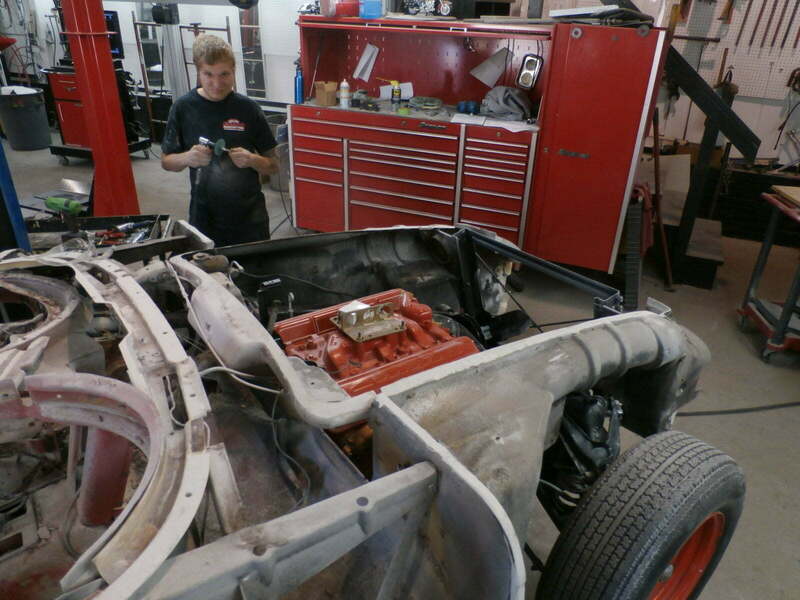 The vehicle is rolled back over to our mechanical shop area and they start to wire the engine, dash, and body. 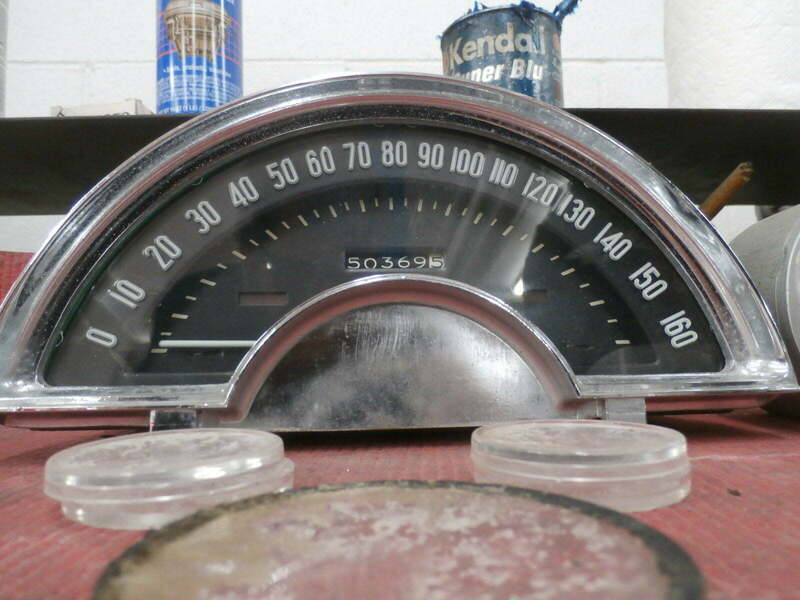 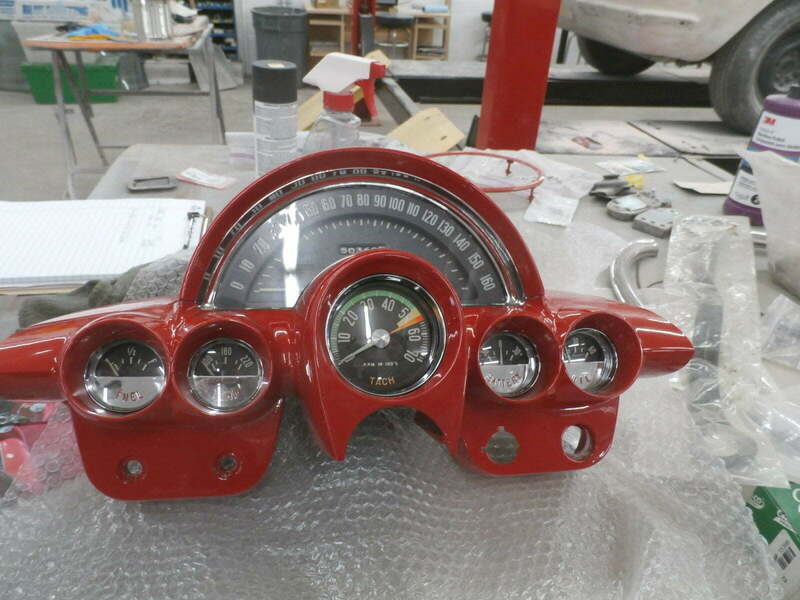 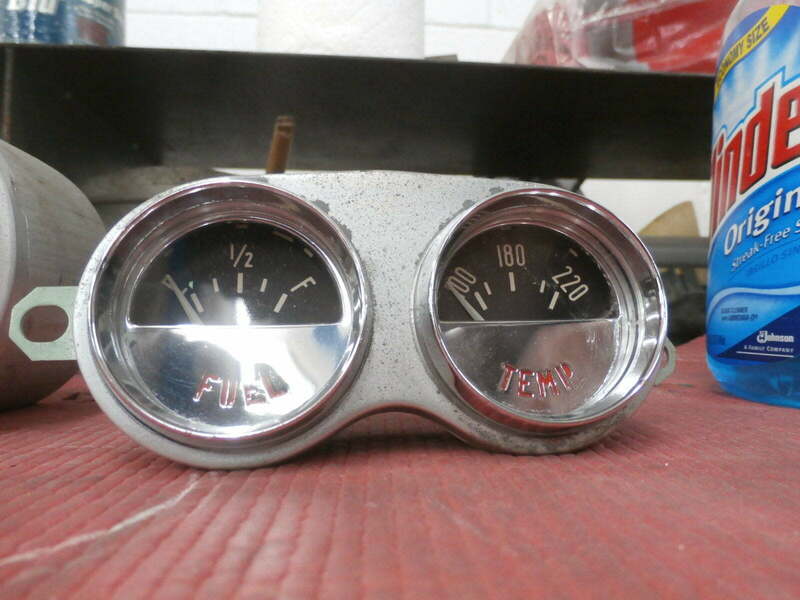 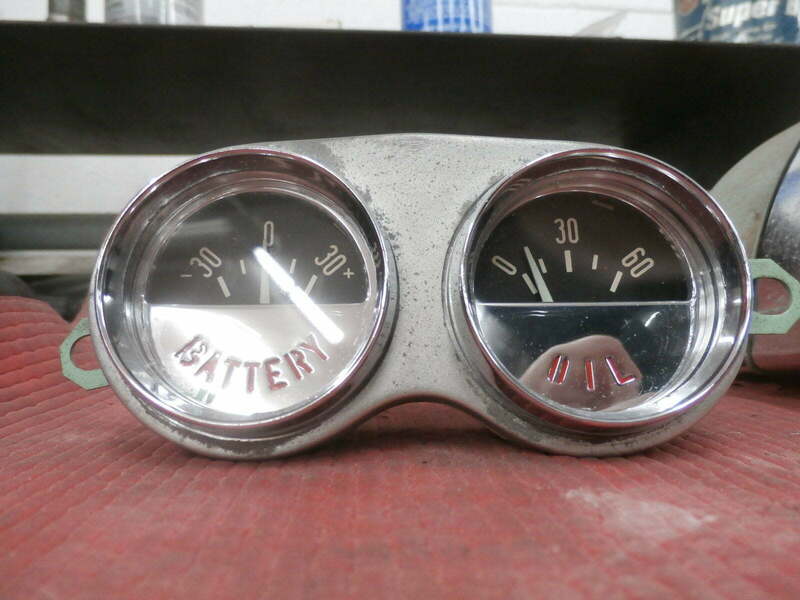 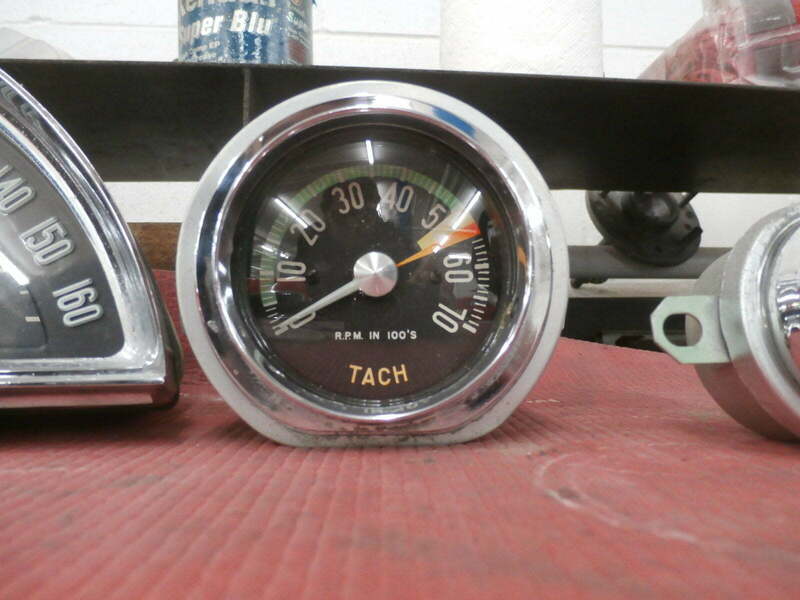 Previously, the gauges were sent out and restored with new lenses and new internal components. 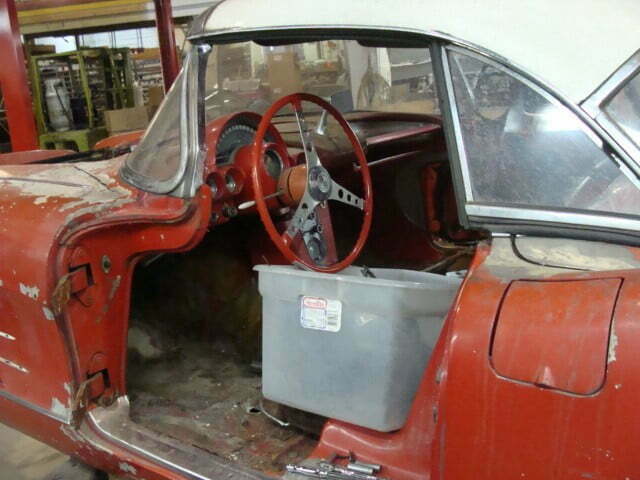 The windshield is installed, followed by the interior and seats. 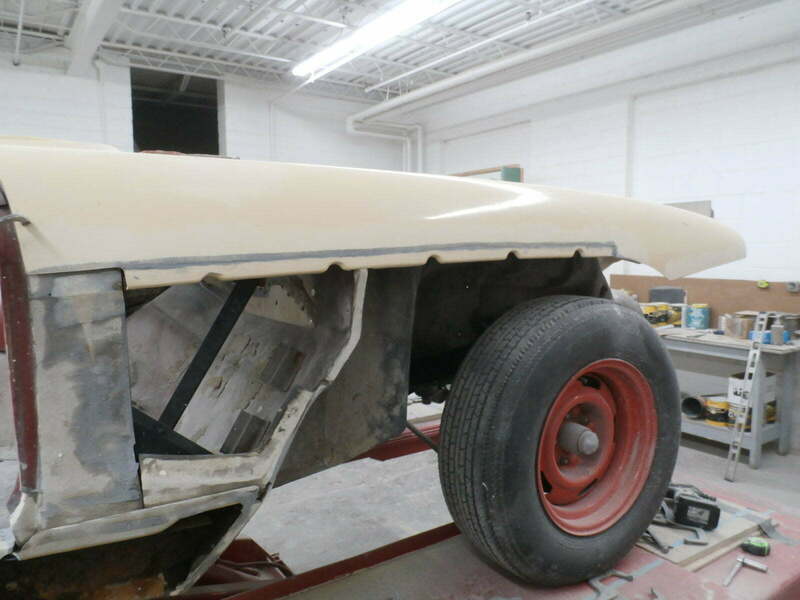 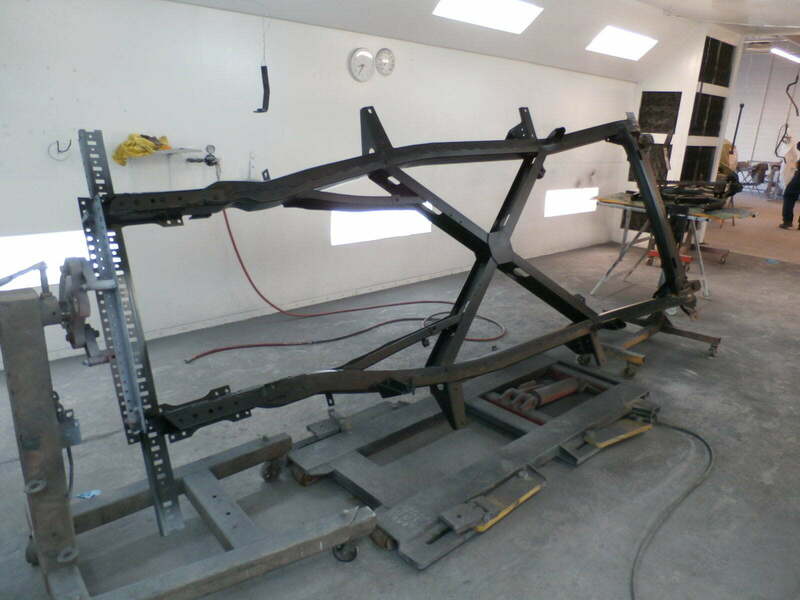 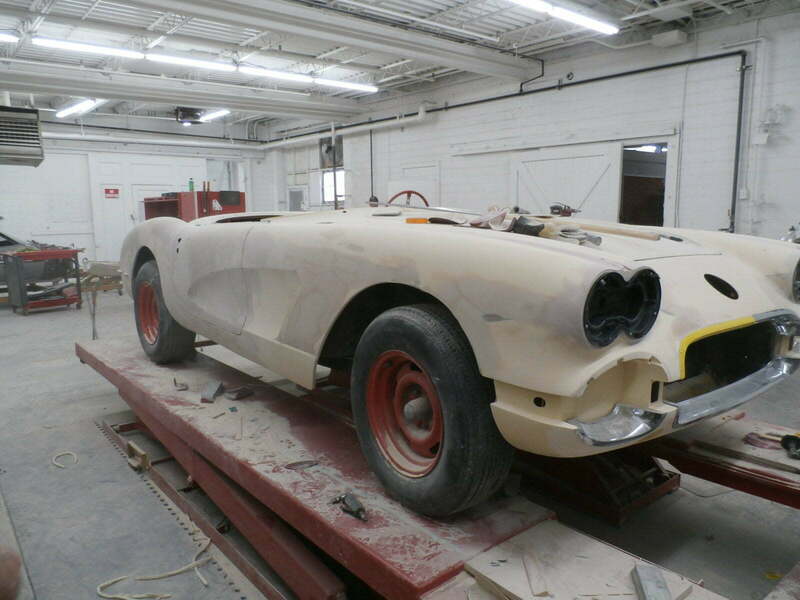 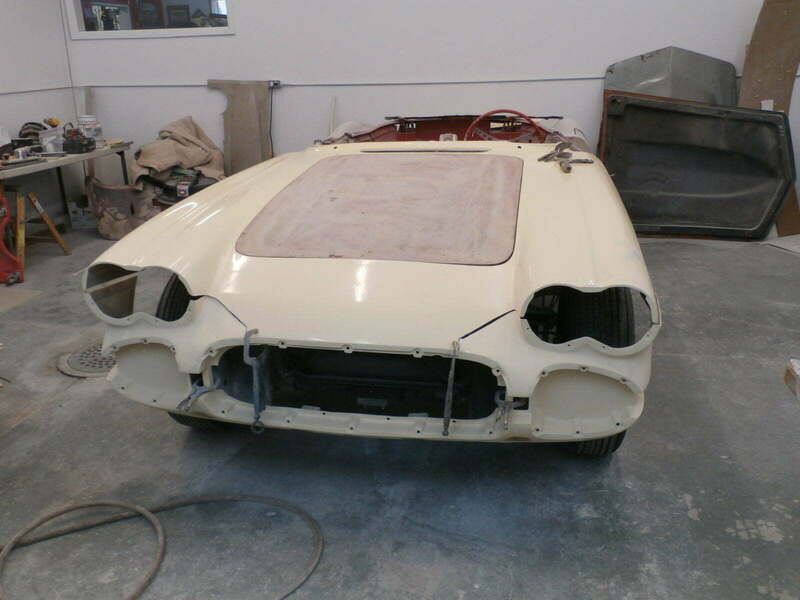 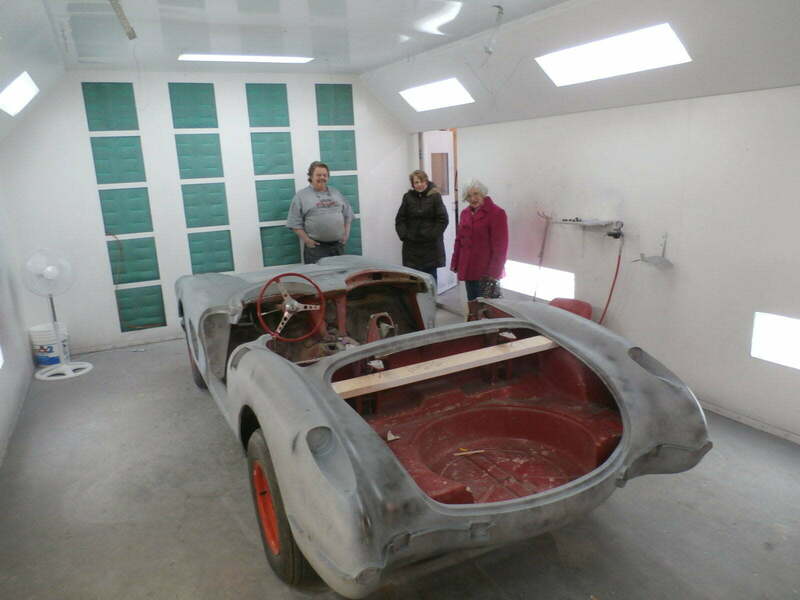 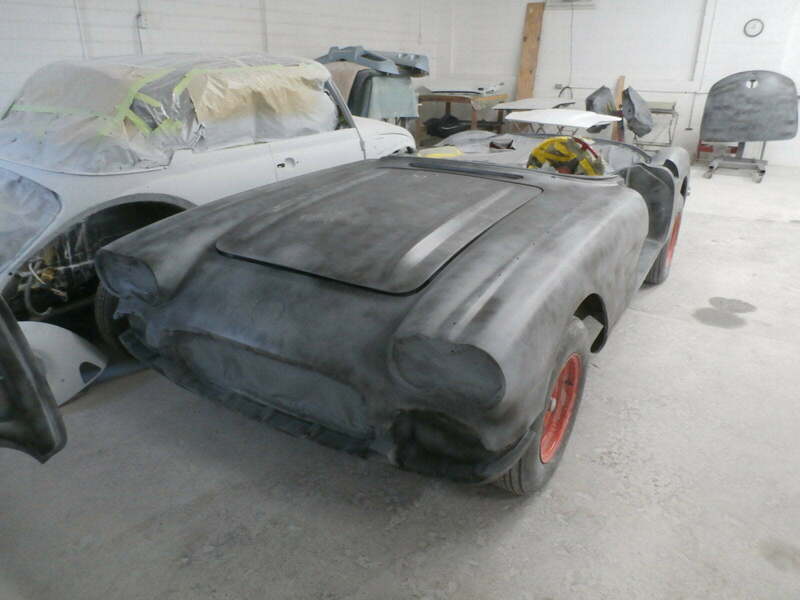 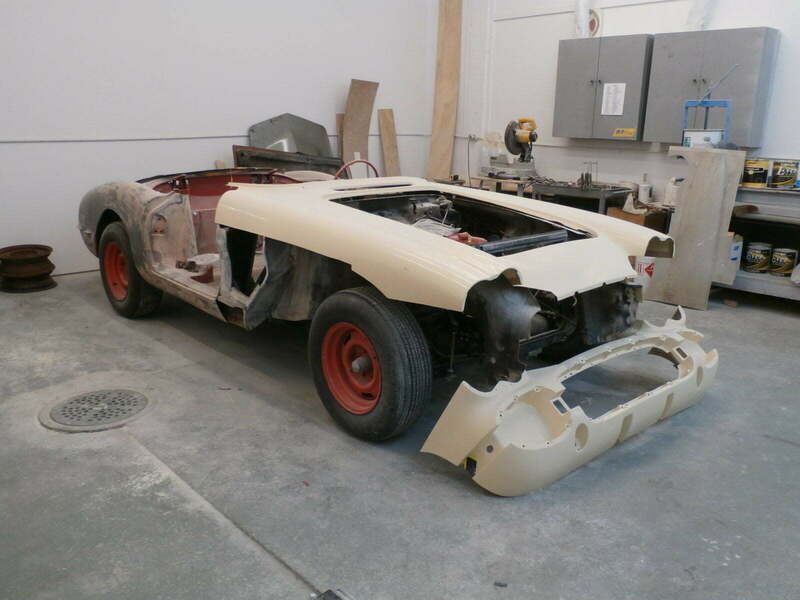 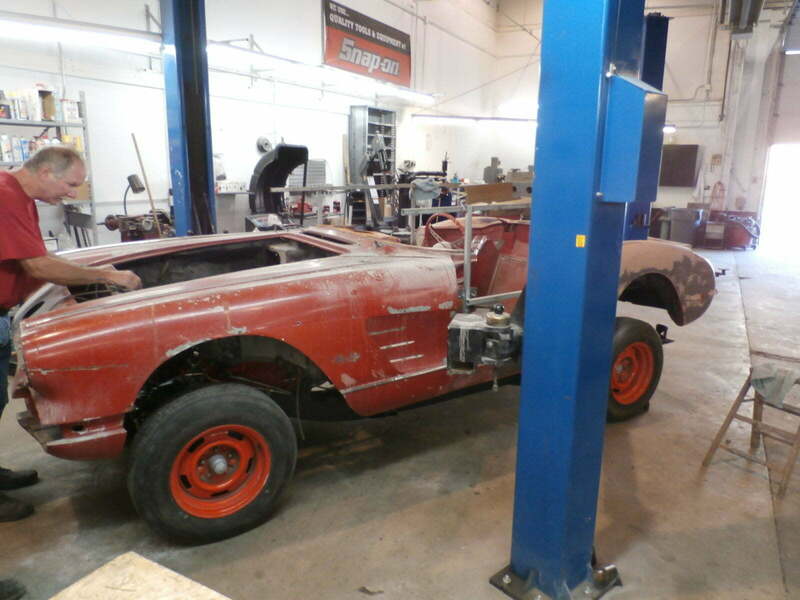 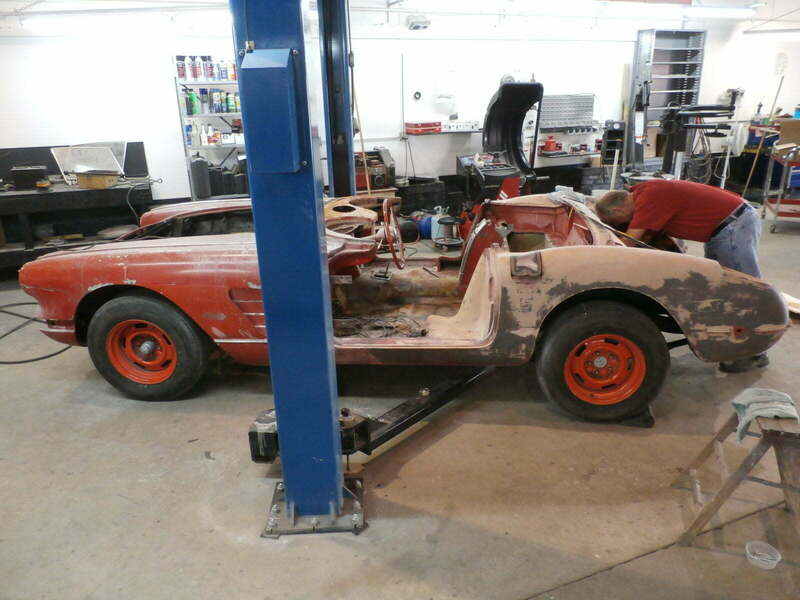 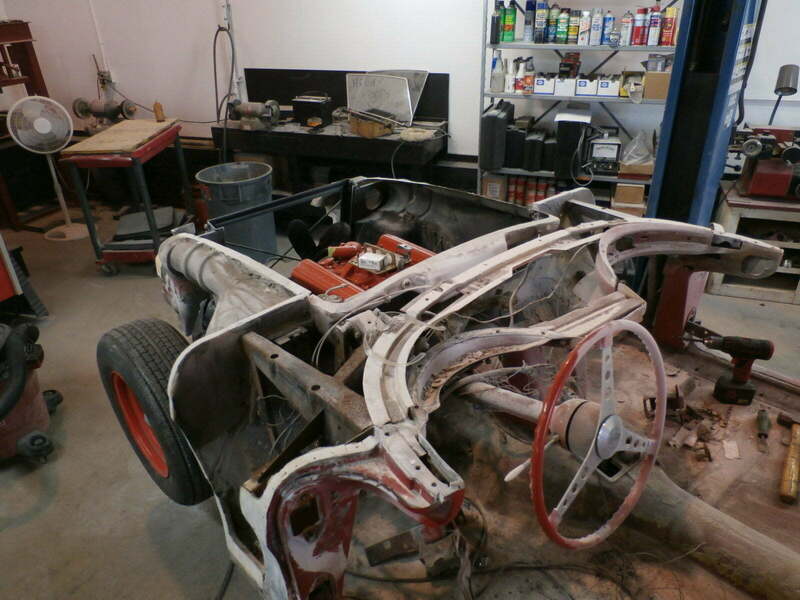 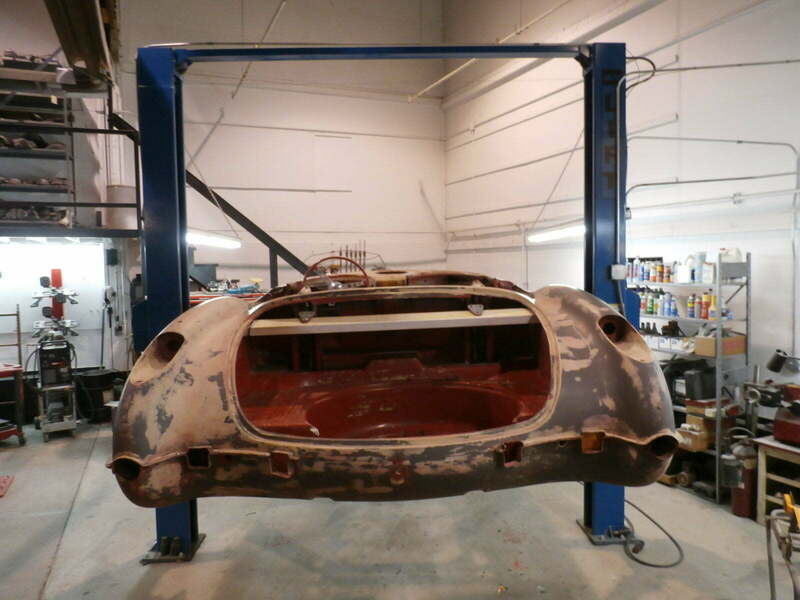 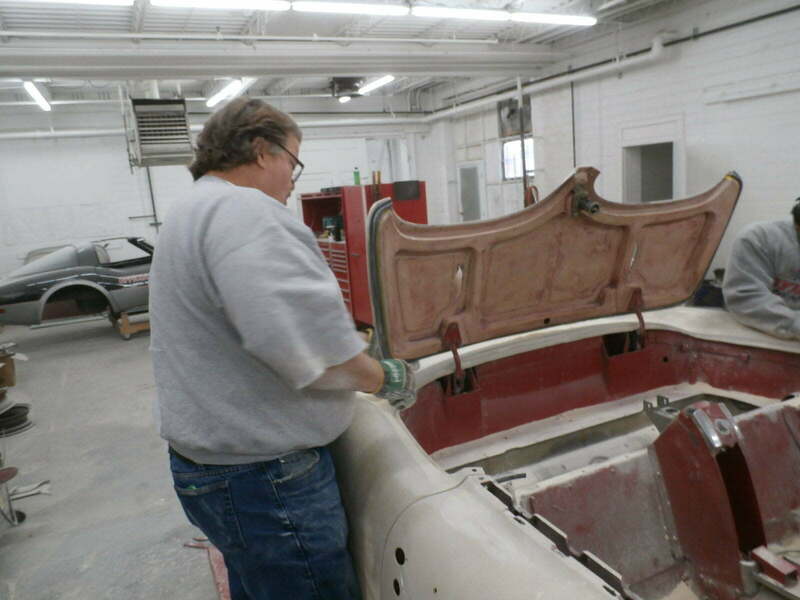 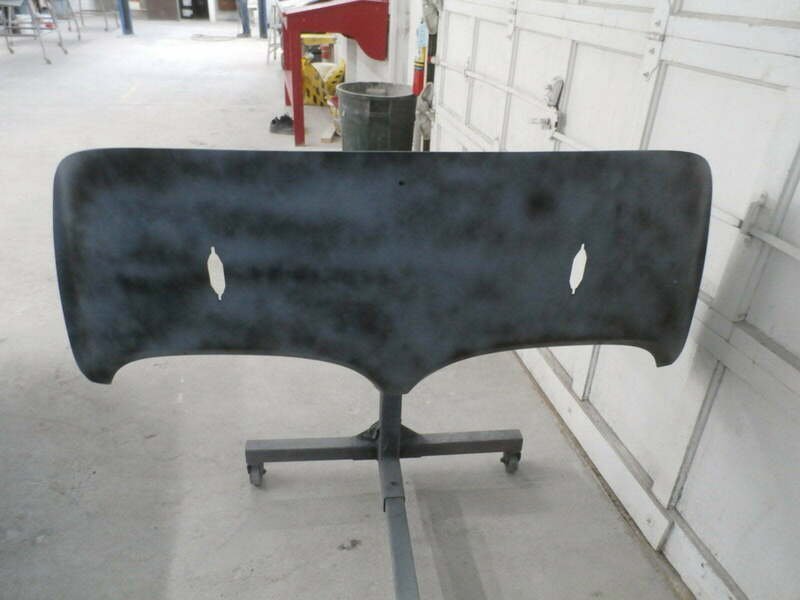 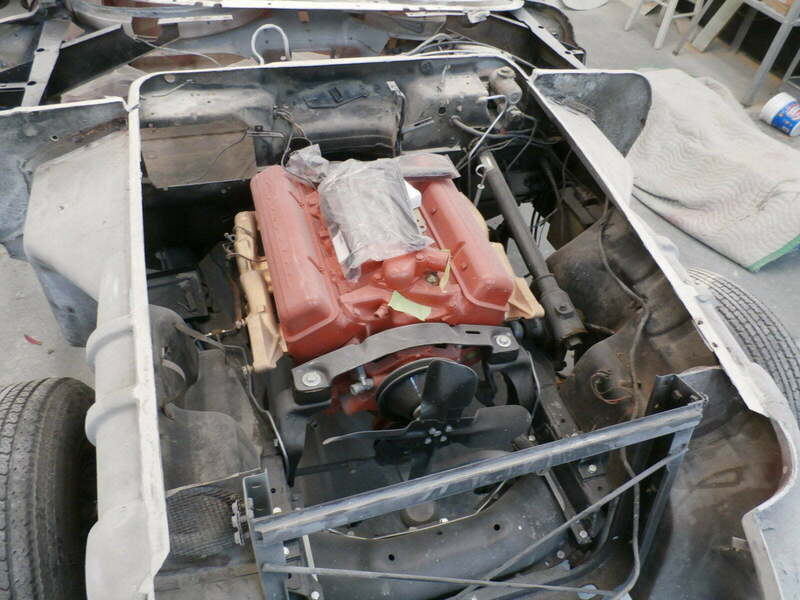 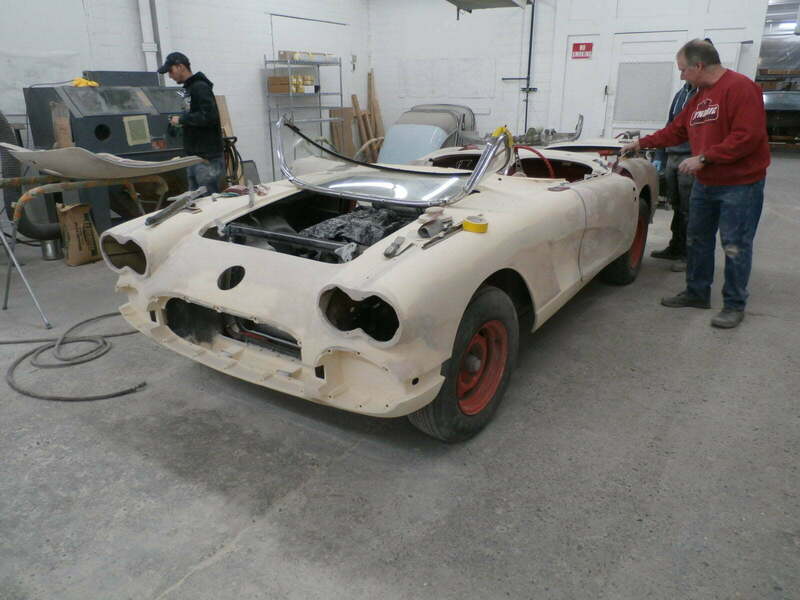 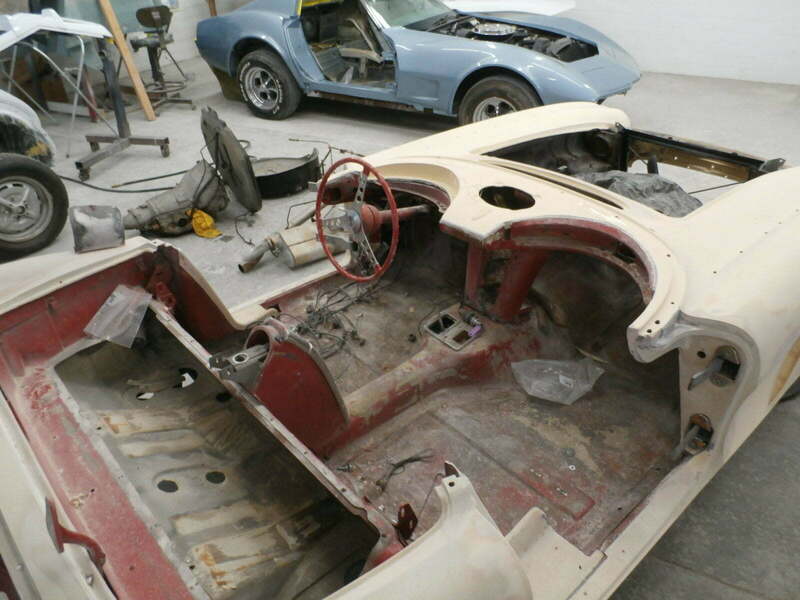 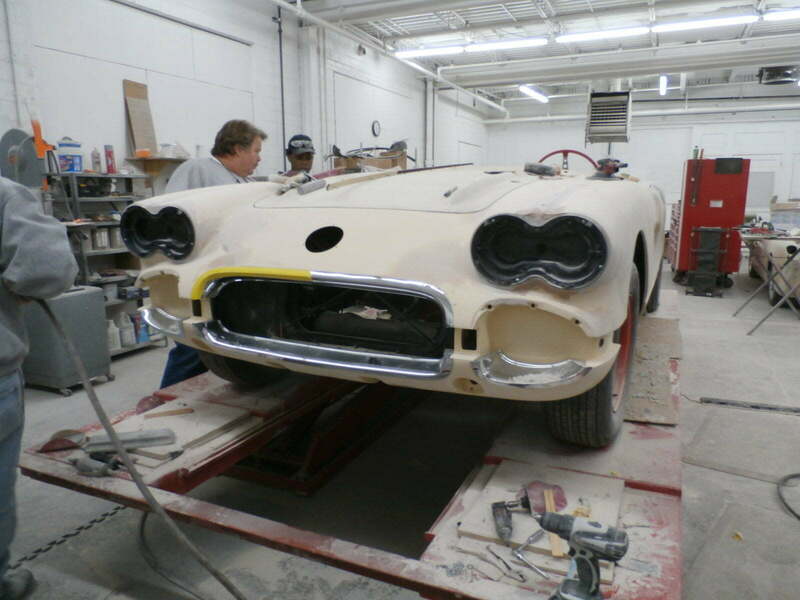 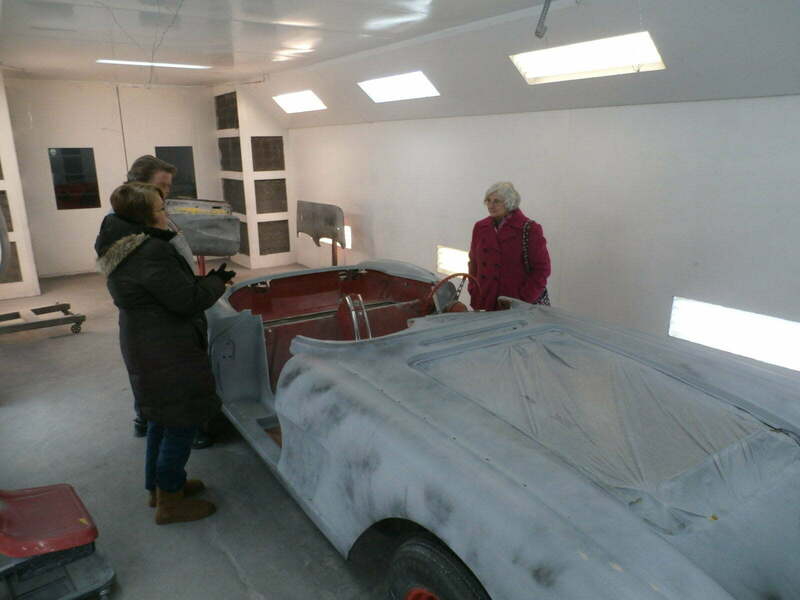 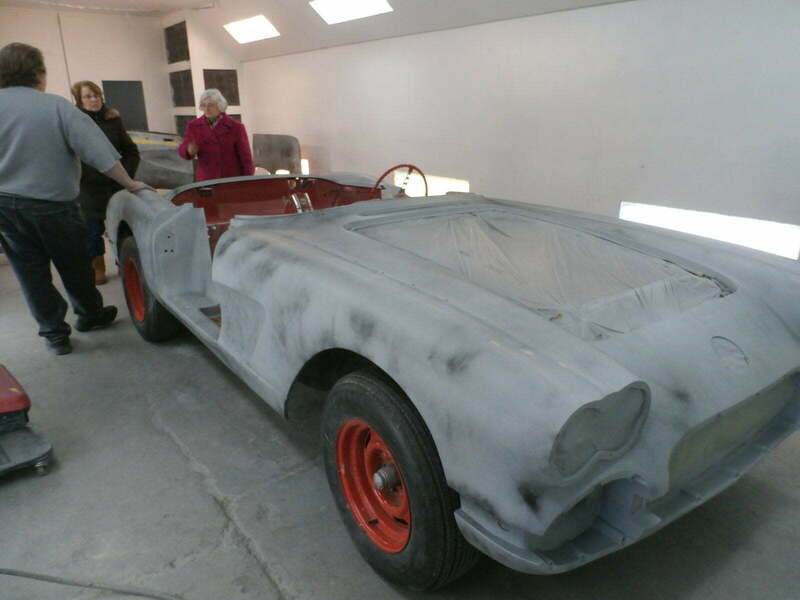 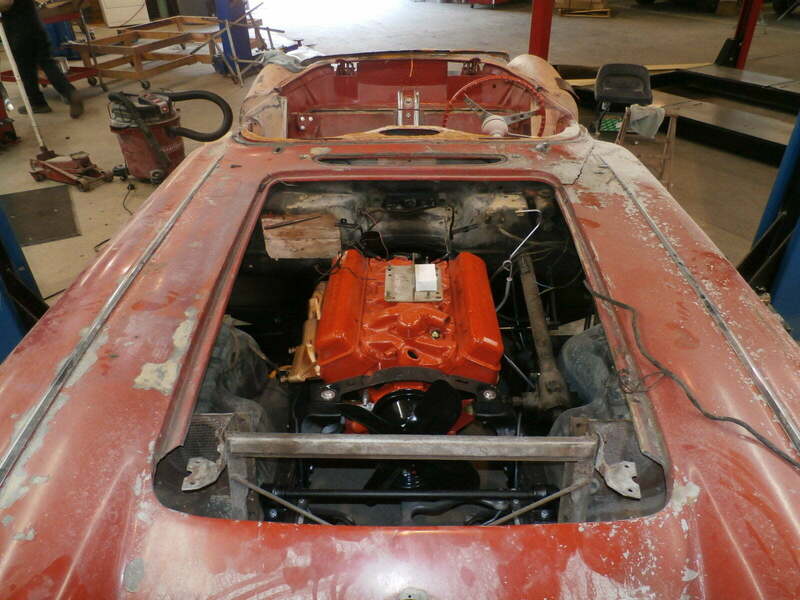 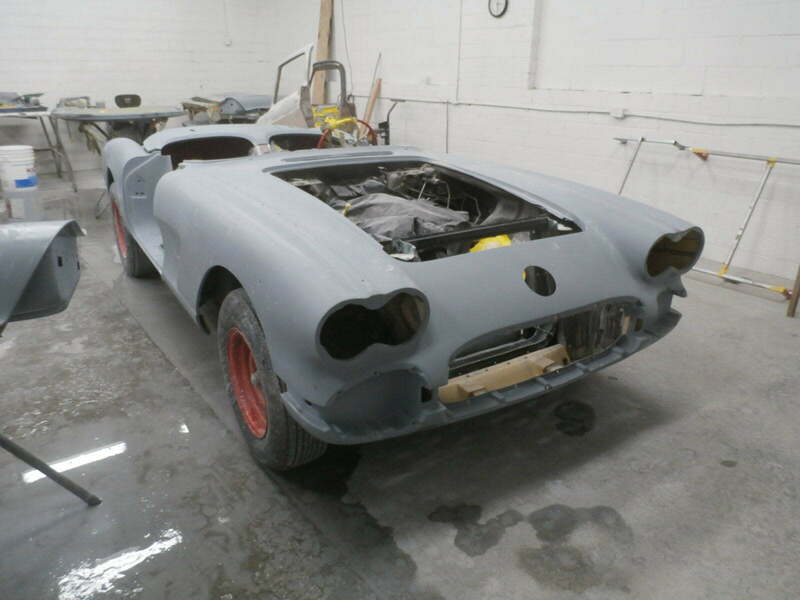 The convertible top frame was gone over, straightened, sand blasted, primed and then painted black. 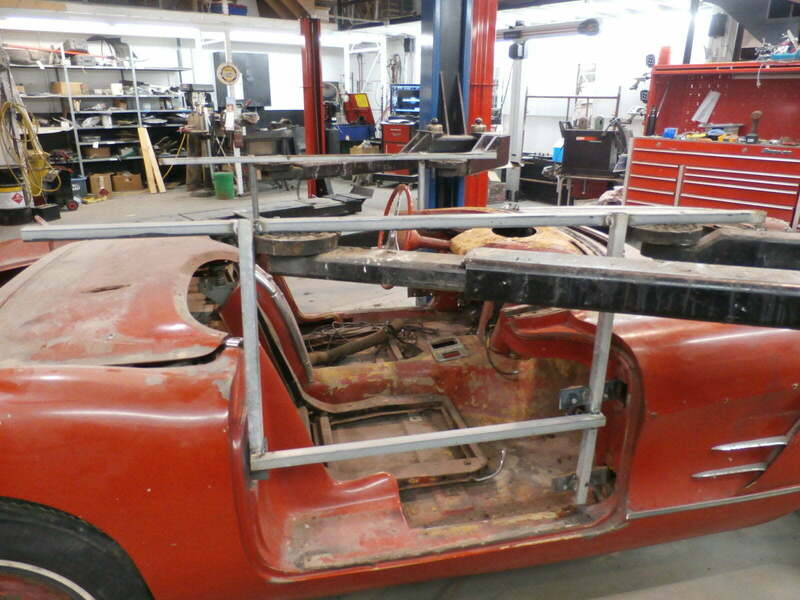 Once the convertible top frame was finished, they were able to install the new convertible top and let it stretch and rest over a few days. 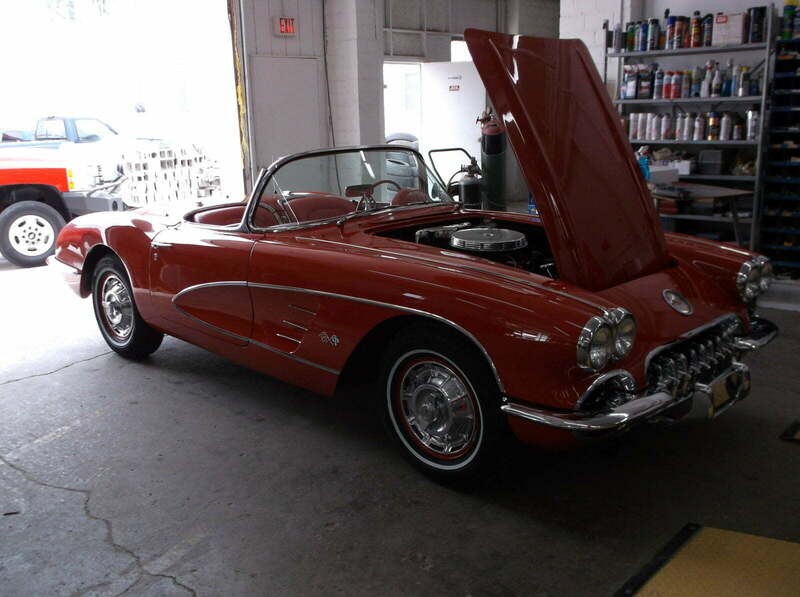 After a few shake down test drives and a few bugs worked out, we completely detailed the vehicle for the customer to take delivery.